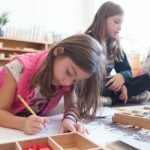 To Maria Montessori, the teaching of grammar was at the center of her language curriculum for elementary age children. 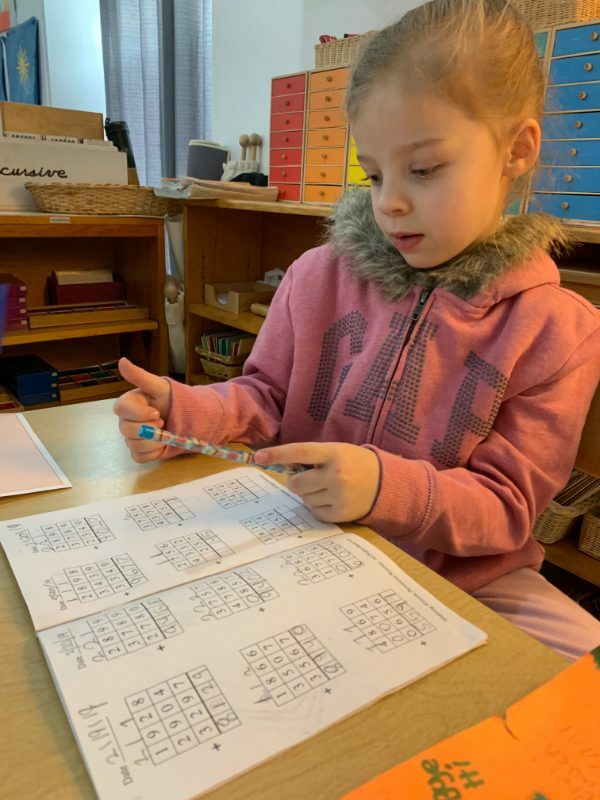 It is a critical element in our language program. 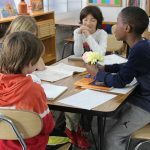 Understanding language and the words we read and write is extremely valuable for the students’ further education. 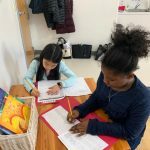 First and second year students are learning the parts of speech. 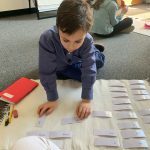 The aims of this work are to learn the function of each word and to understand the relationship between words. 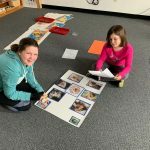 Our elder students have started learning sentence analysis. 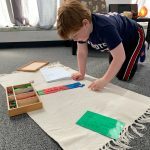 Sentence analysis is the Montessori version of sentence diagramming and the aims of this work are to study how words are used in sentences. 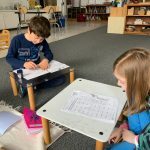 First year students learned about verbs this week. 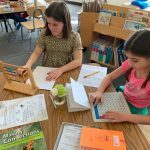 Second years learned about conjunctions. 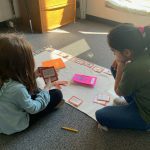 And third year students learned about predicates, subjects, and direct objects. 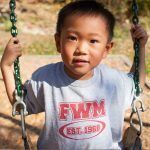 “A child’s world is fresh and new and beautiful, full of wonder and excitement. 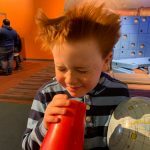 It is our misfortune that for most of us that clear-eyed vision, that true instinct for what is beautiful and awe-inspiring, is dimmed and even lost before we reach adulthood. 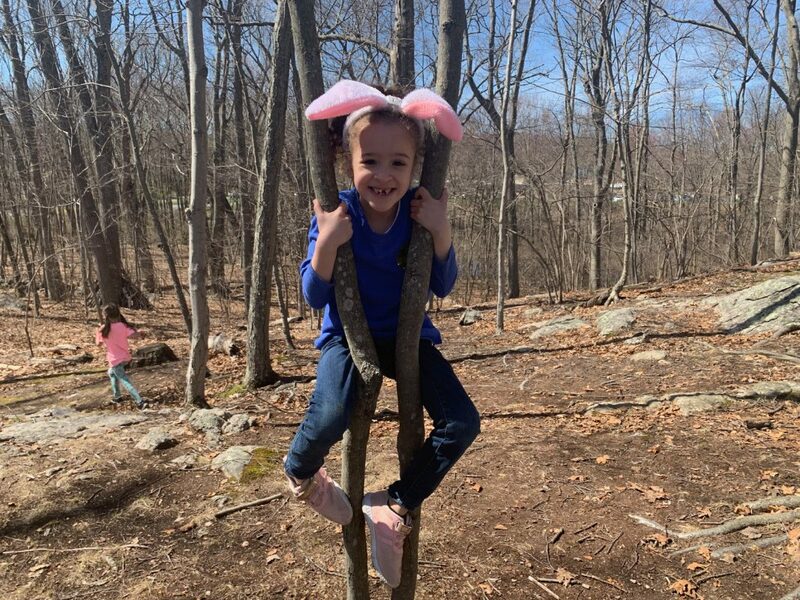 If I had influence with the good fairy who is supposed to preside over the christening of all children I should ask that her gift to each child in the world be a sense of wonder so indestructible that it would last throughout life, as an unfailing antidote against the boredom and disenchantments of later years, the sterile preoccupation with things that are artificial, the alienation from the sources of our strength.” -Rachel Carson, The Sense of Wonder. 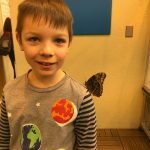 Our relationships to other living things need to be more than theoretical. 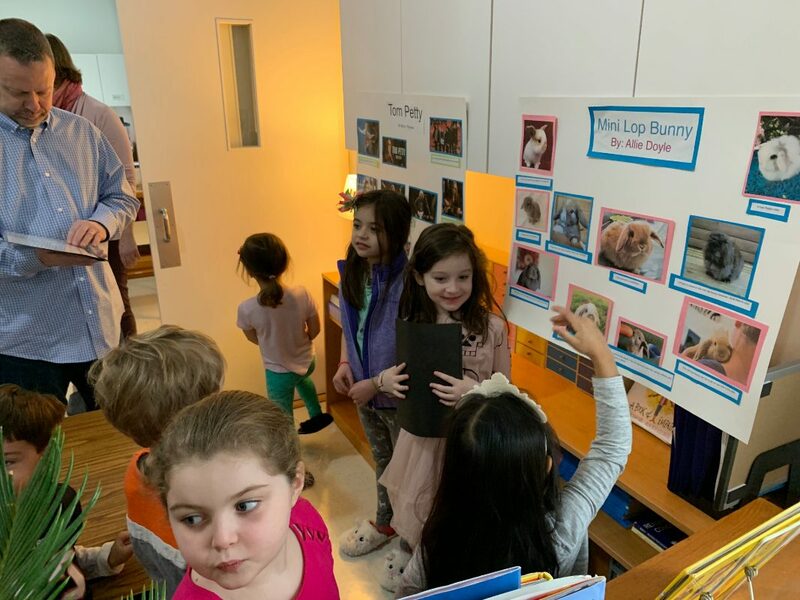 Children love animals and plants and relate to them as individuals. 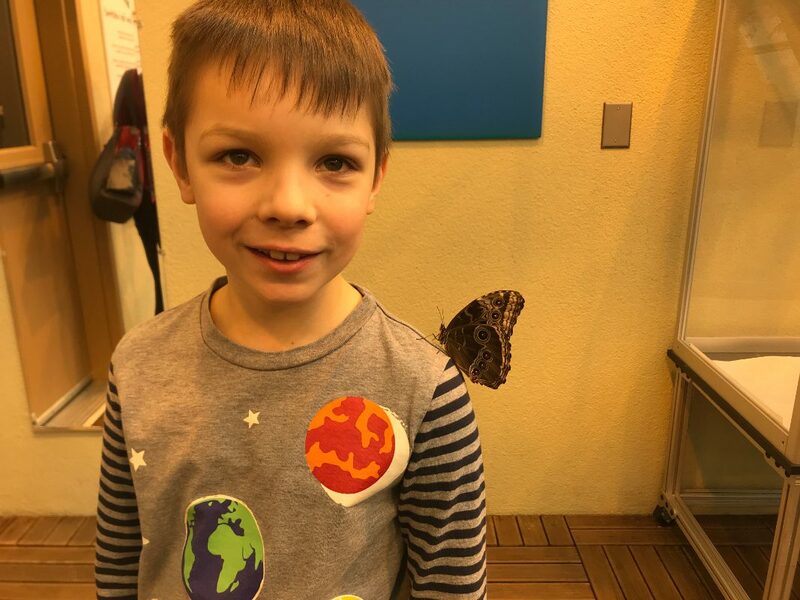 Children are drawn to living things and they want to know about them. 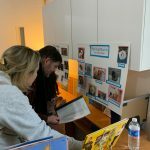 We can nurture and build on that interest by helping them to sharpen their skills in observation, and to learn and apply methods of appropriate care taking. 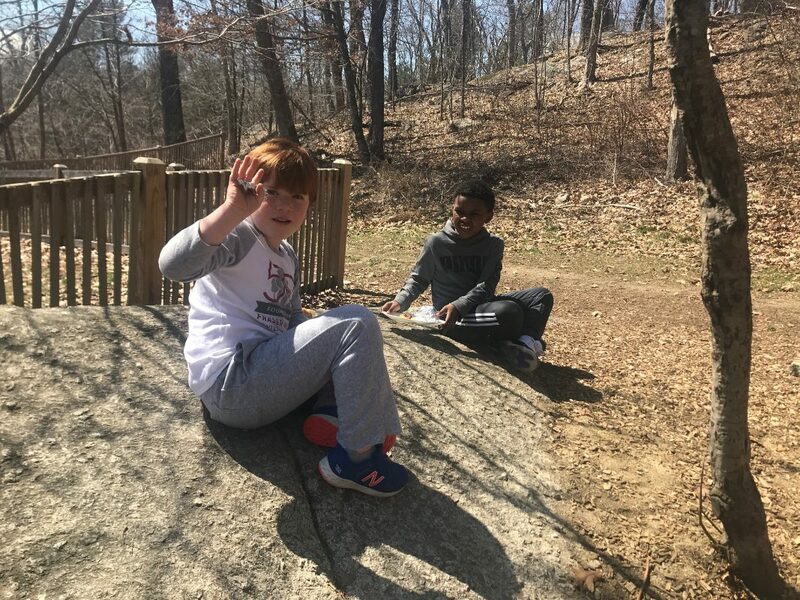 We are going to be visiting the outdoor classroom as frequently as possible! 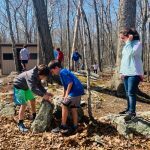 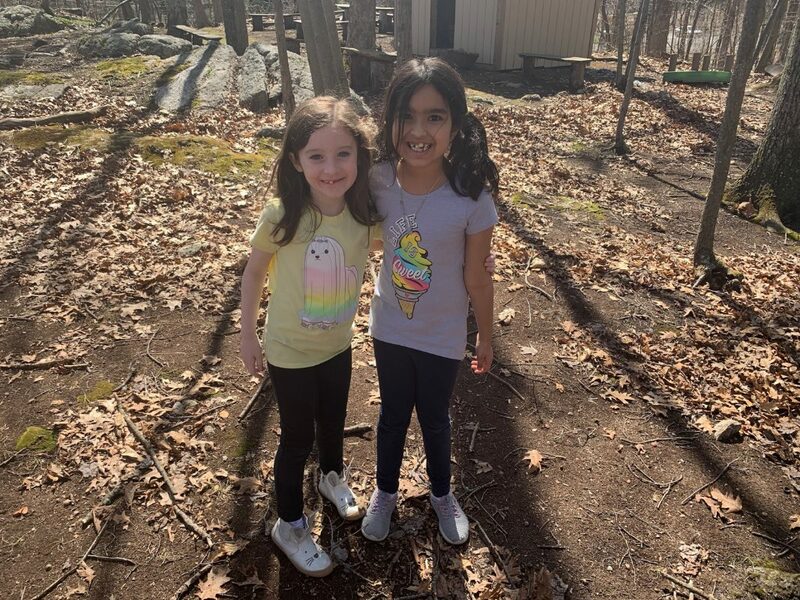 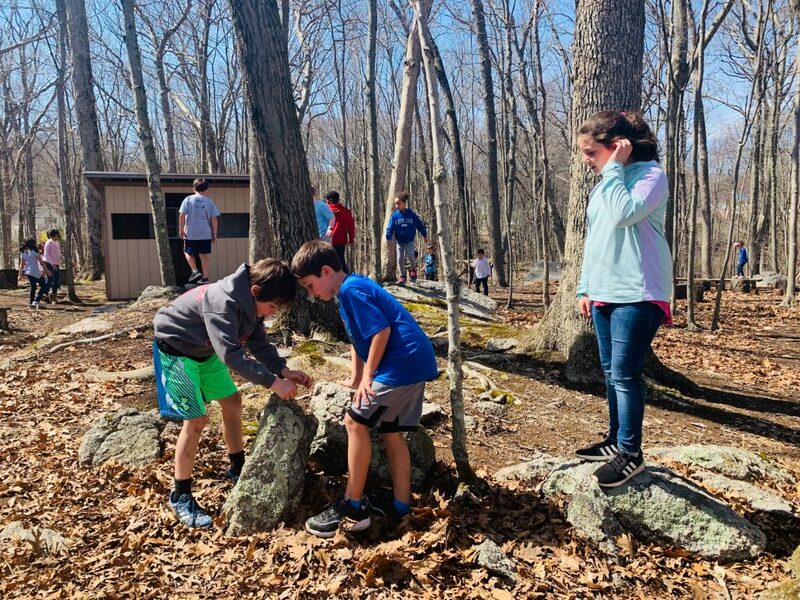 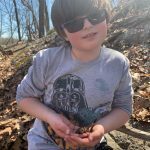 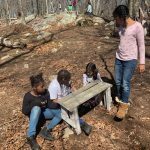 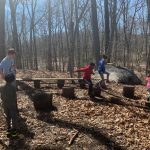 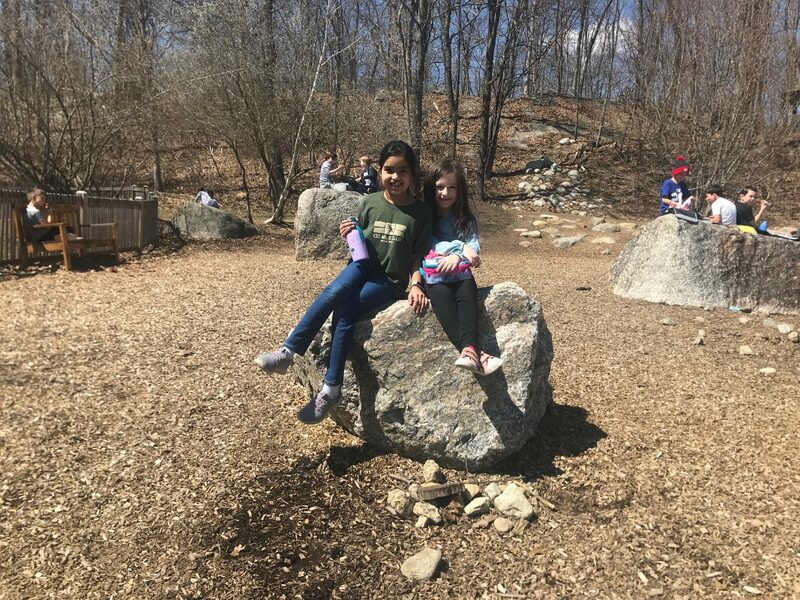 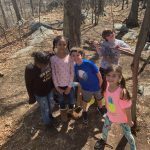 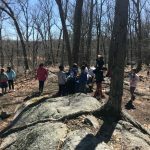 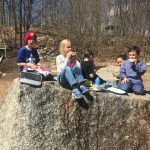 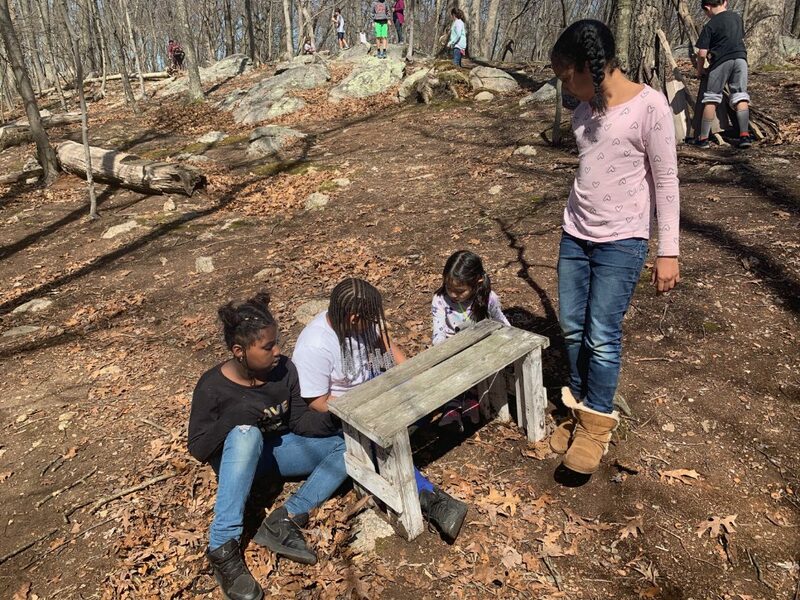 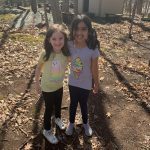 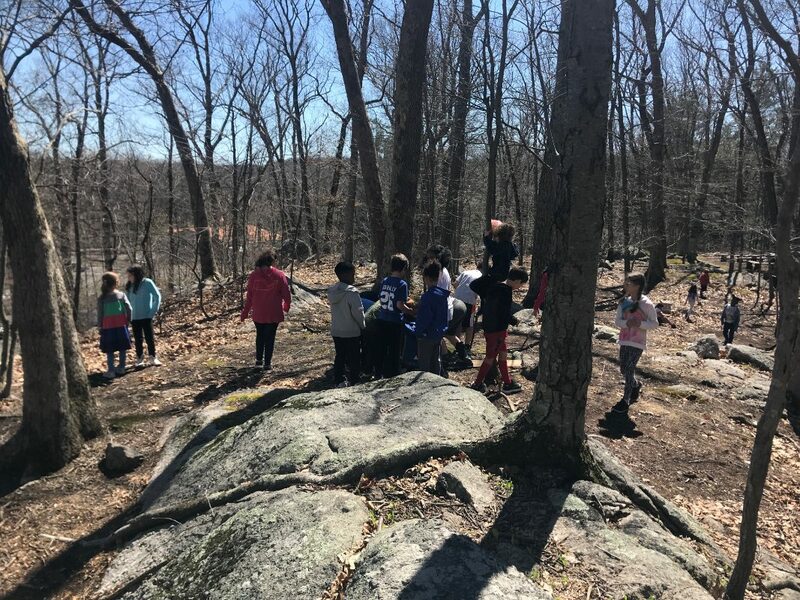 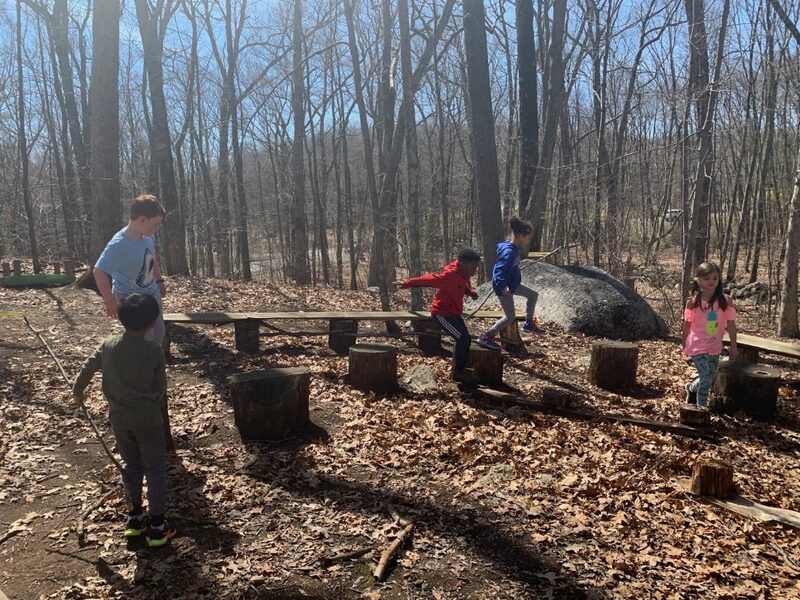 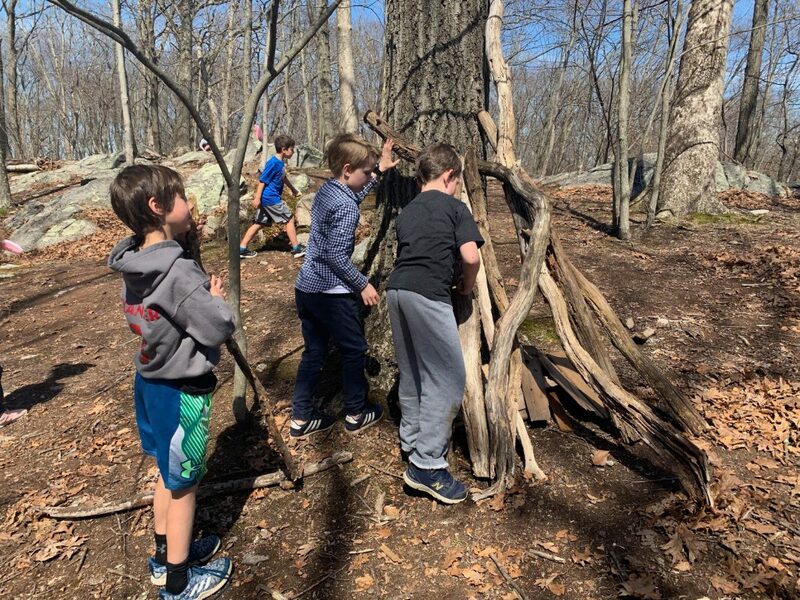 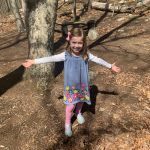 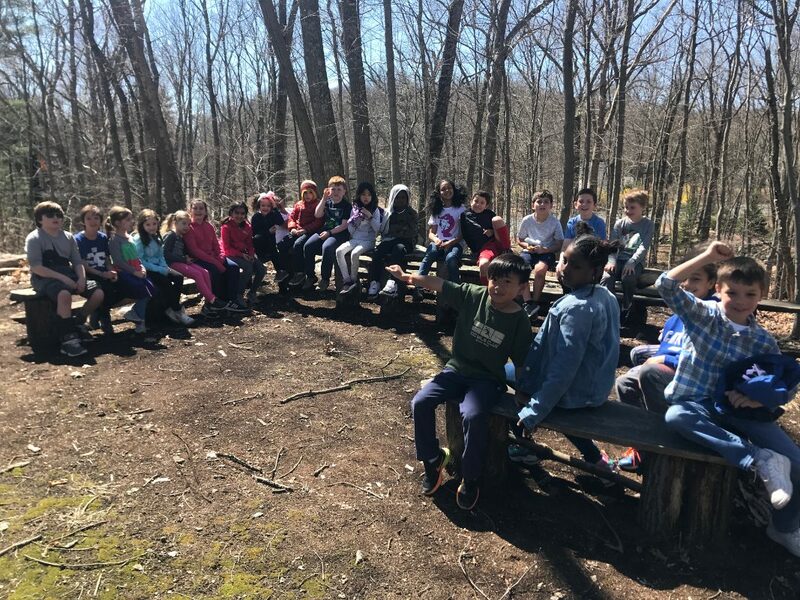 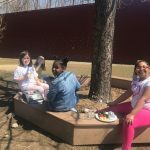 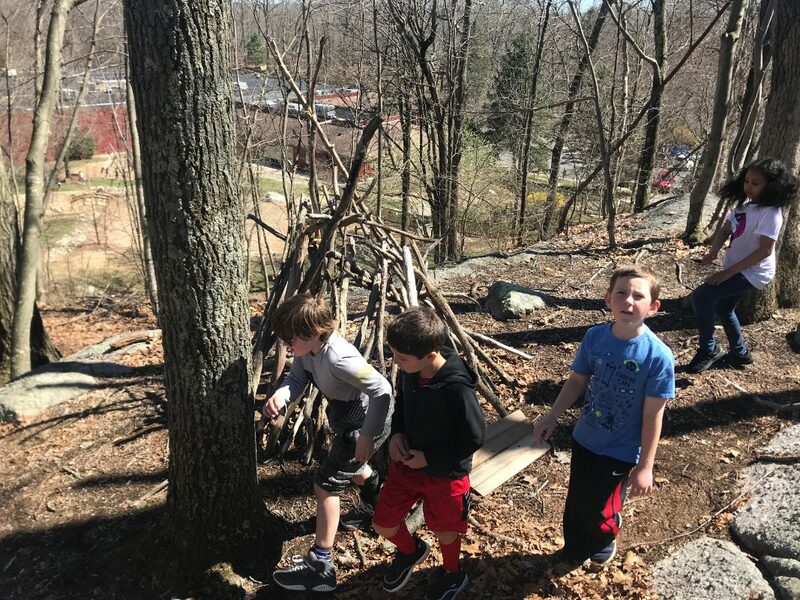 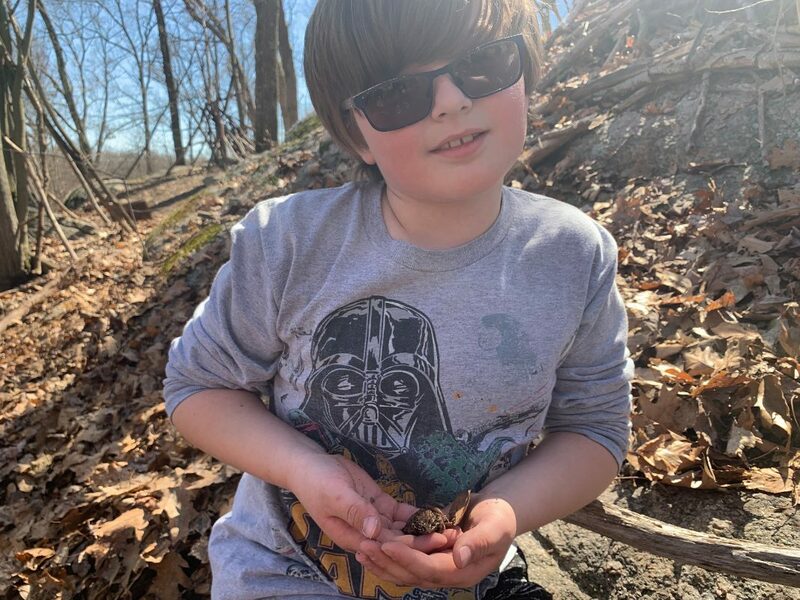 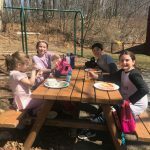 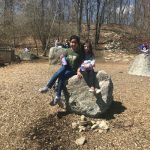 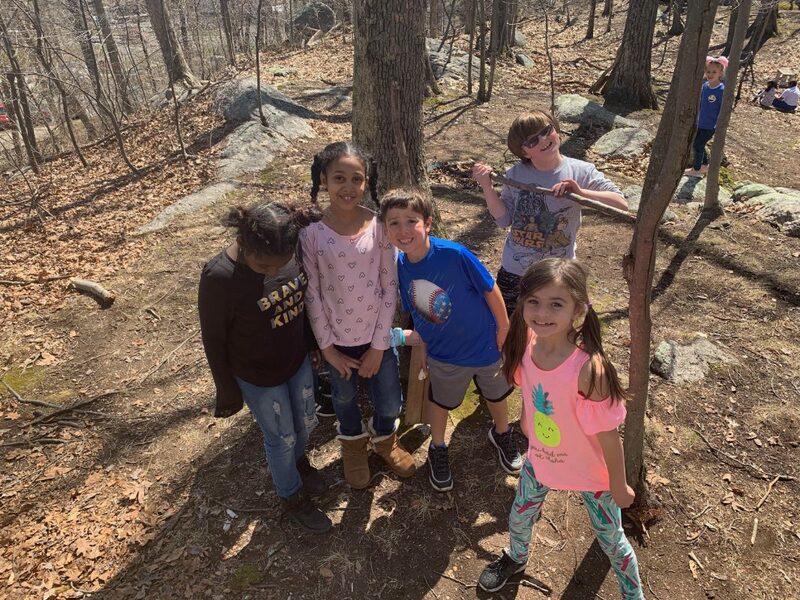 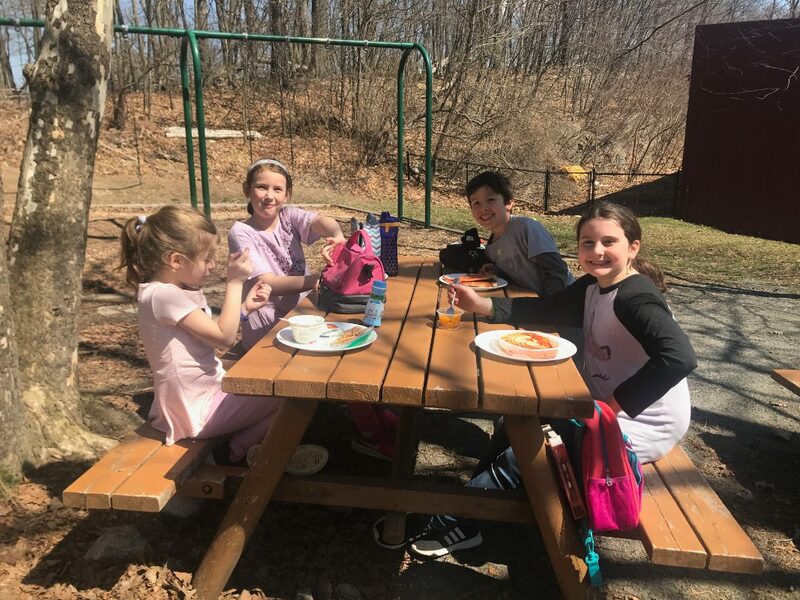 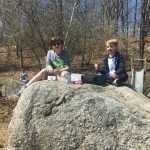 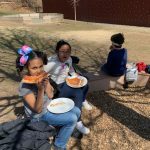 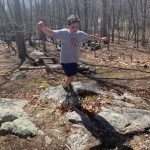 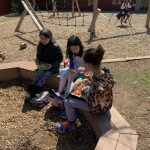 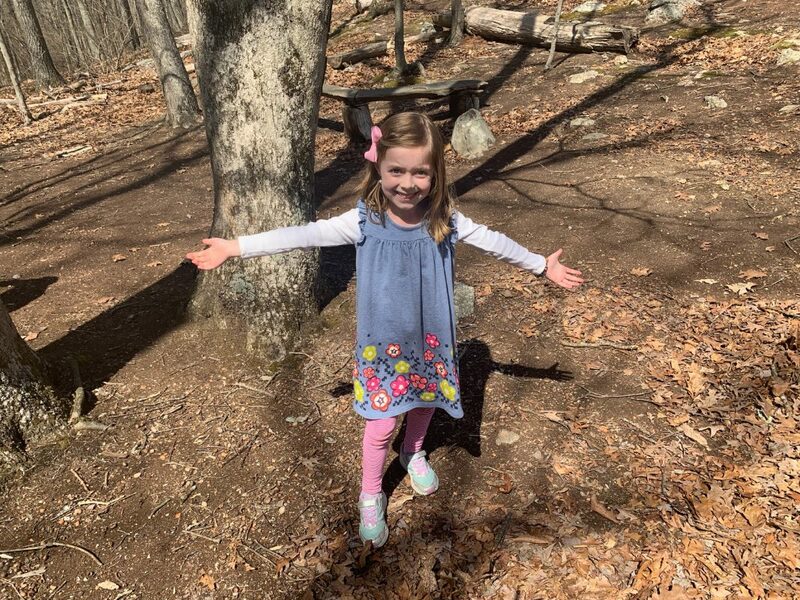 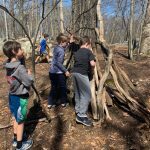 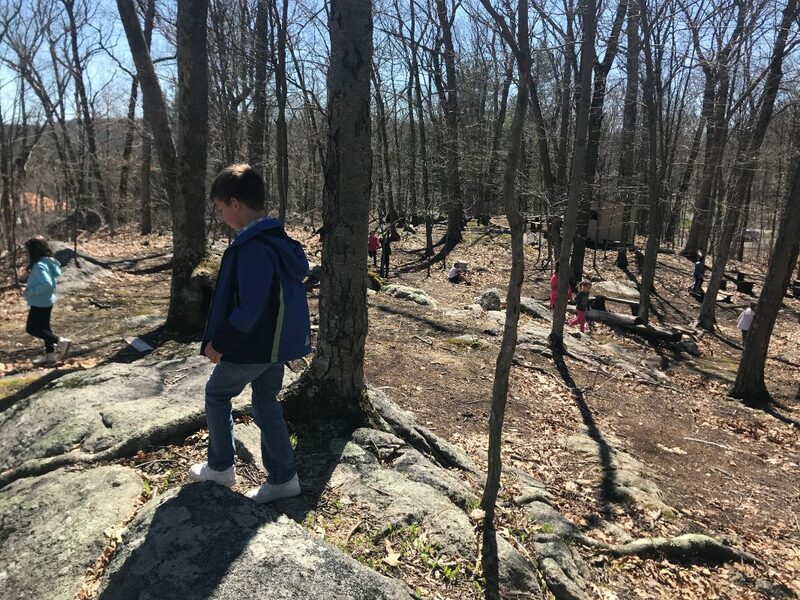 Lower Elementary: Lovin’ the Spring Weather! 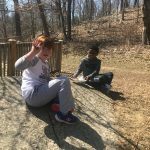 Spring has arrived and the weather is finally starting to warm up! 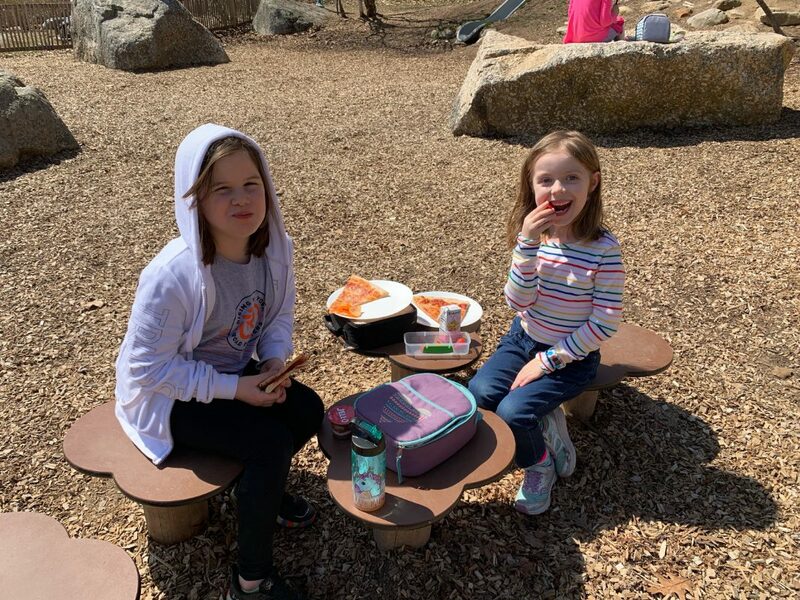 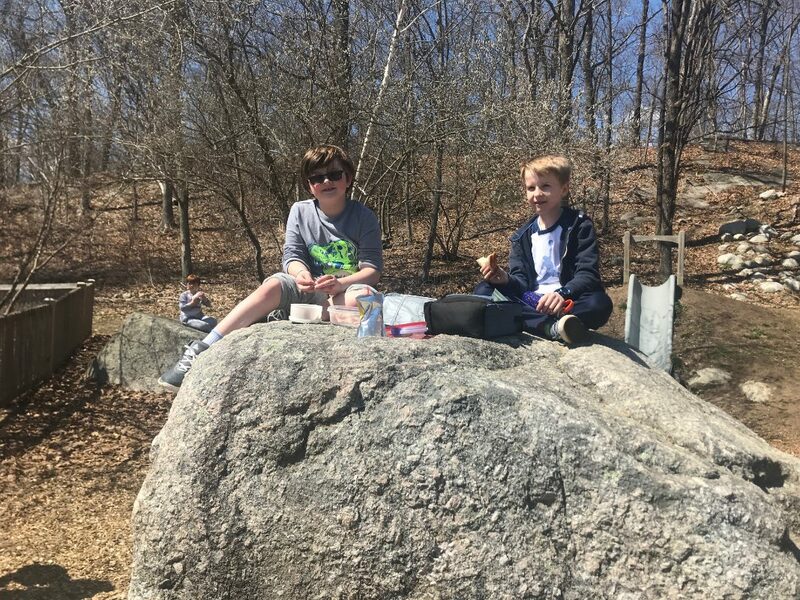 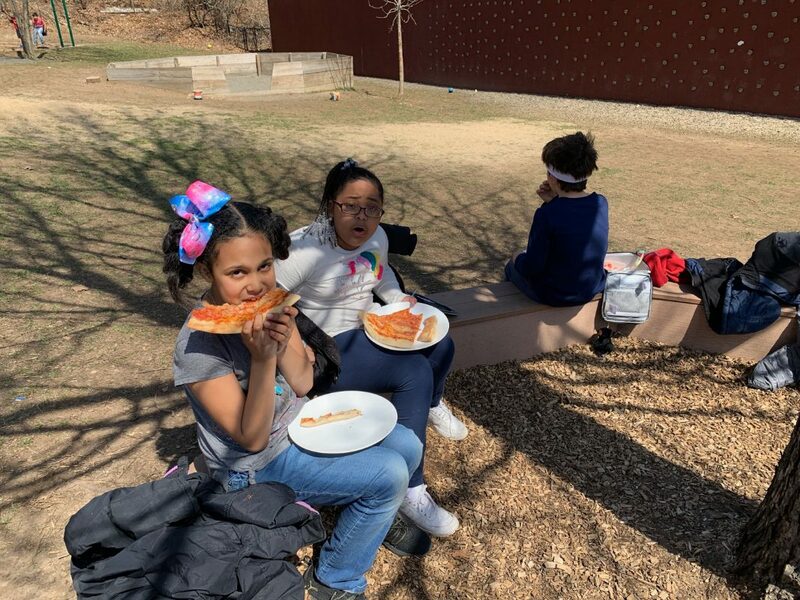 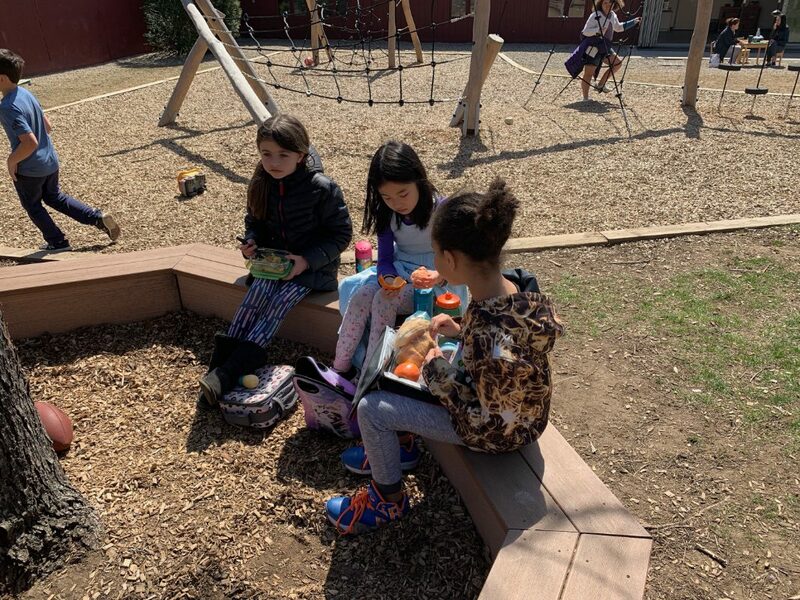 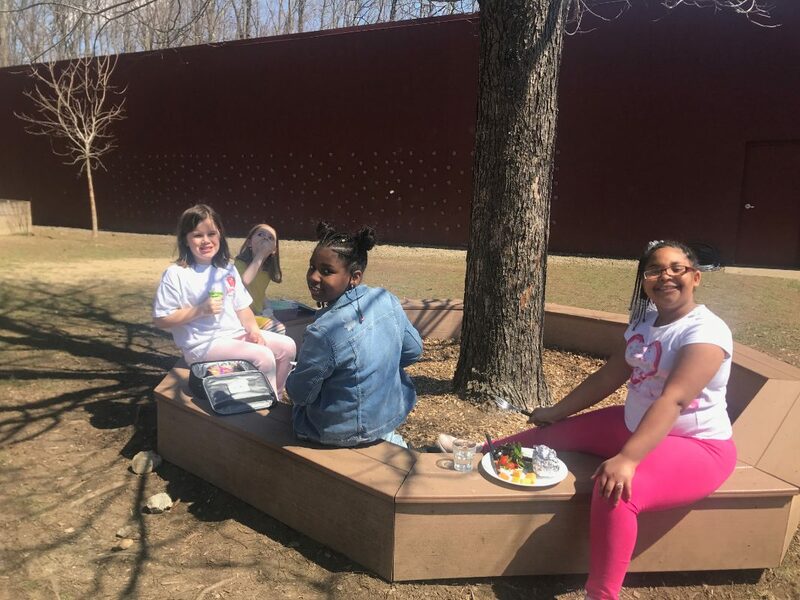 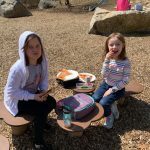 We have enjoyed spending extra time outside this week eating lunch. 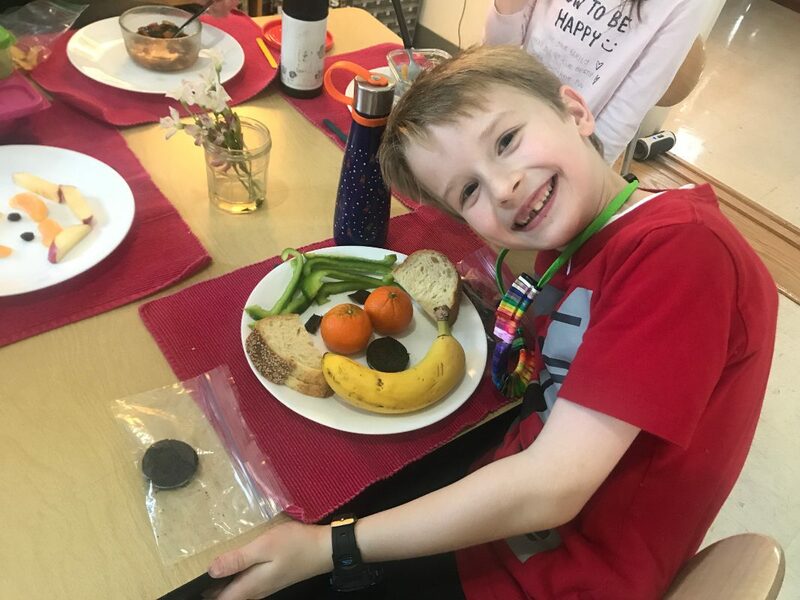 Amazingly, the children are finishing their lunches in about half the time they usually do! 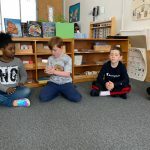 They’re enjoying the extra opportunities for movement before we start our afternoon lessons. 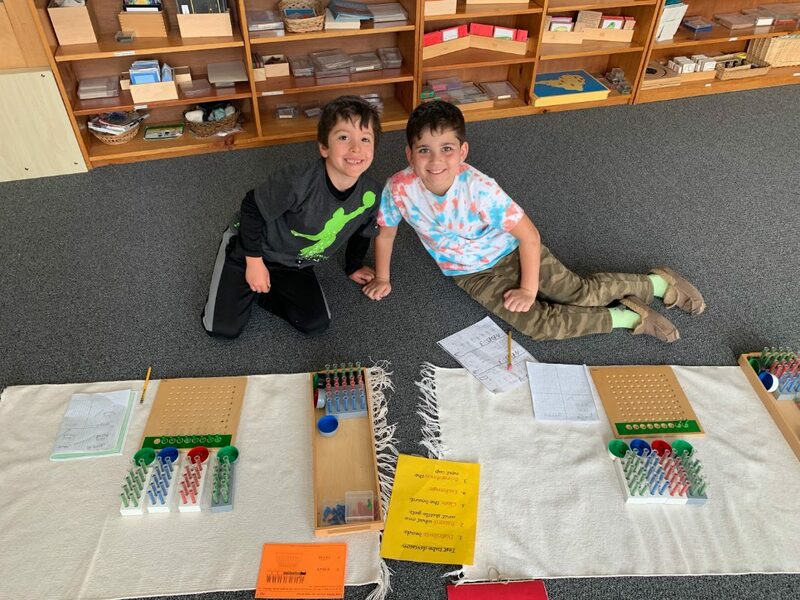 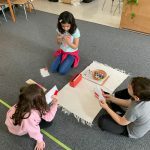 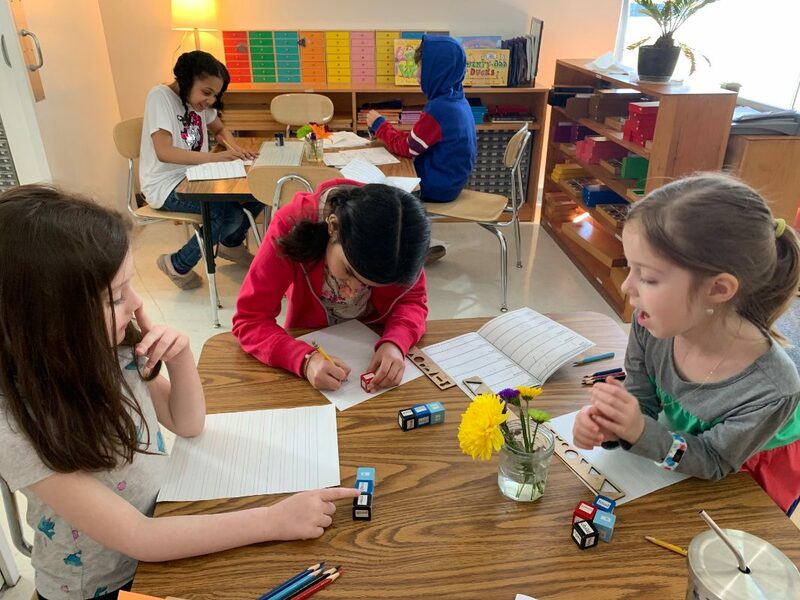 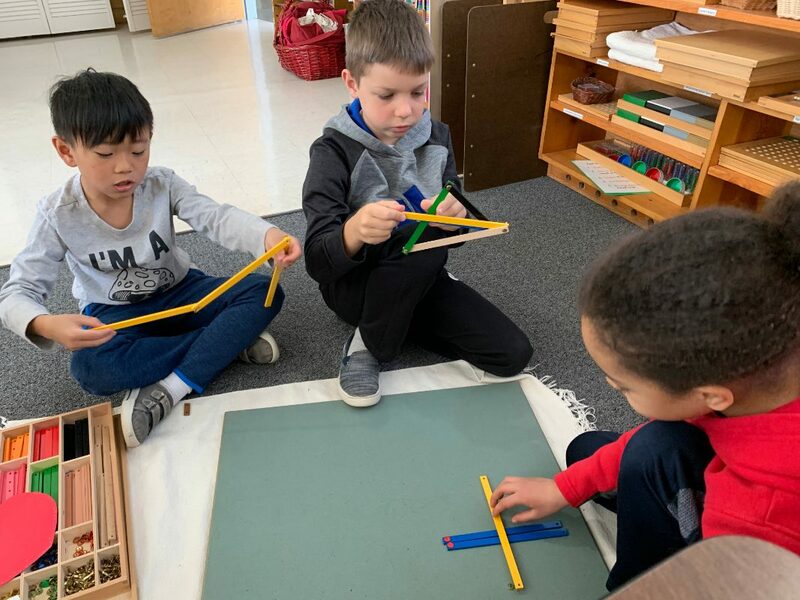 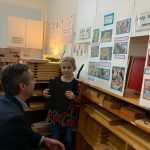 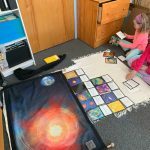 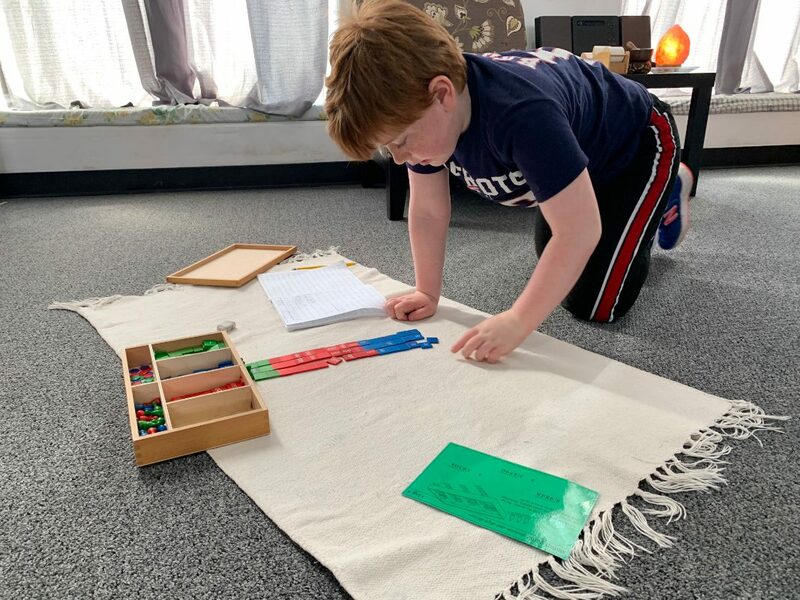 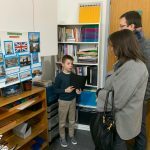 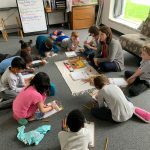 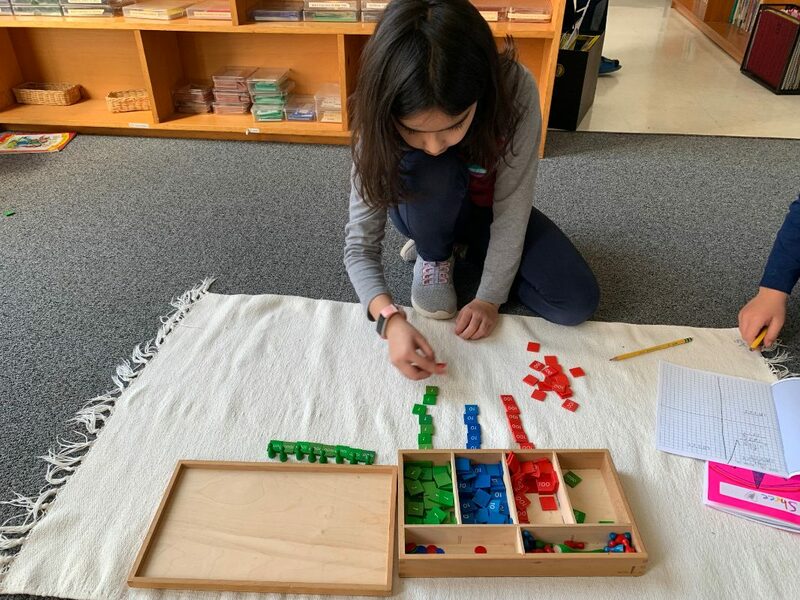 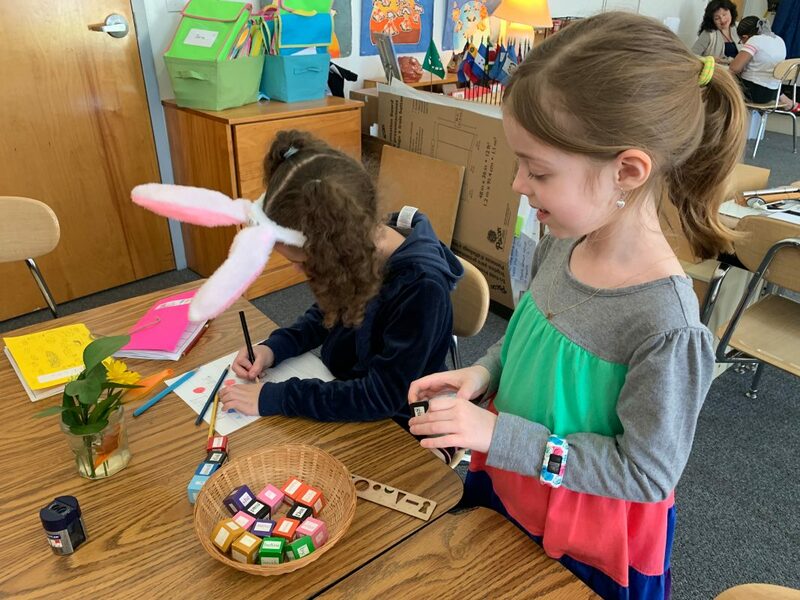 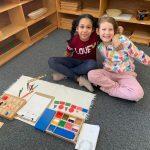 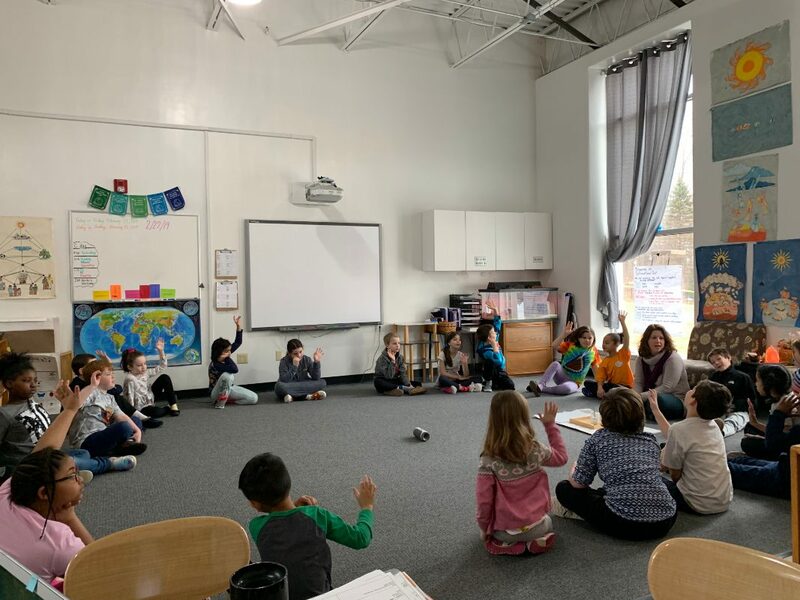 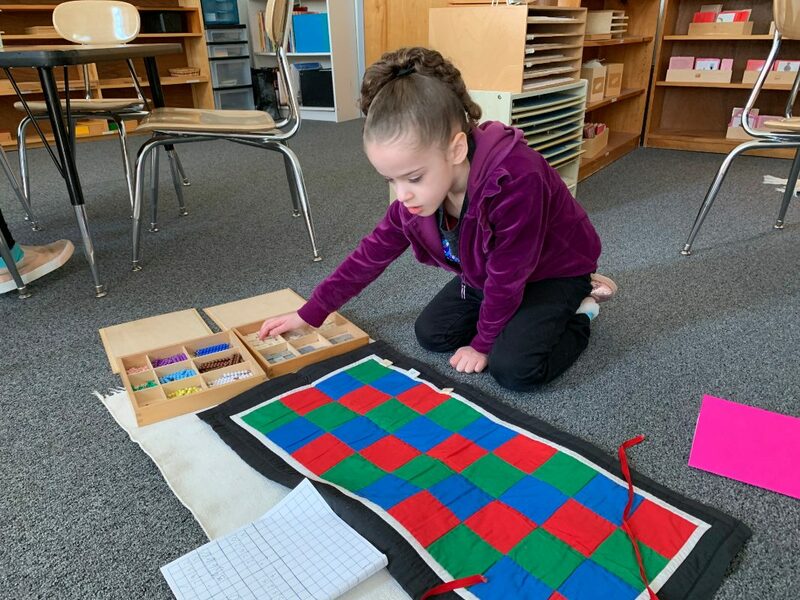 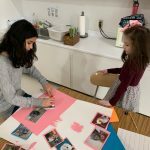 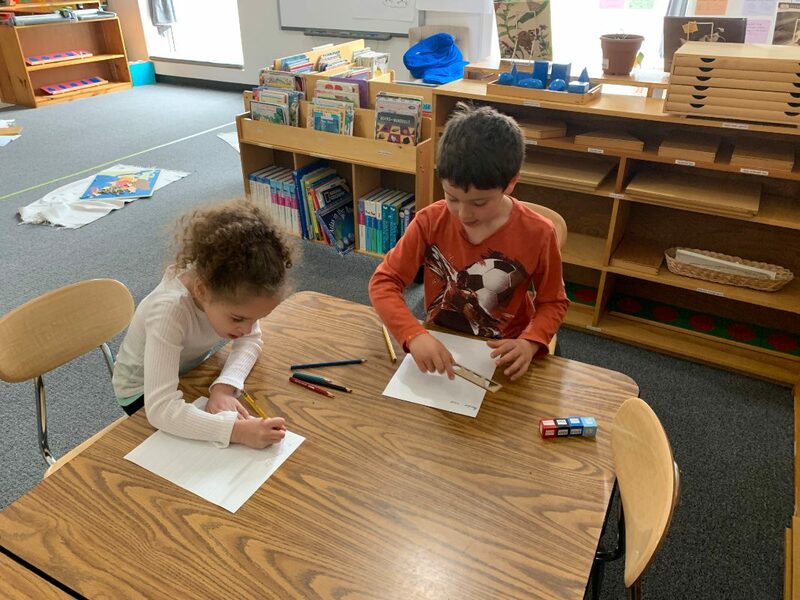 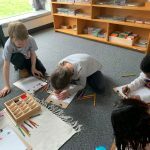 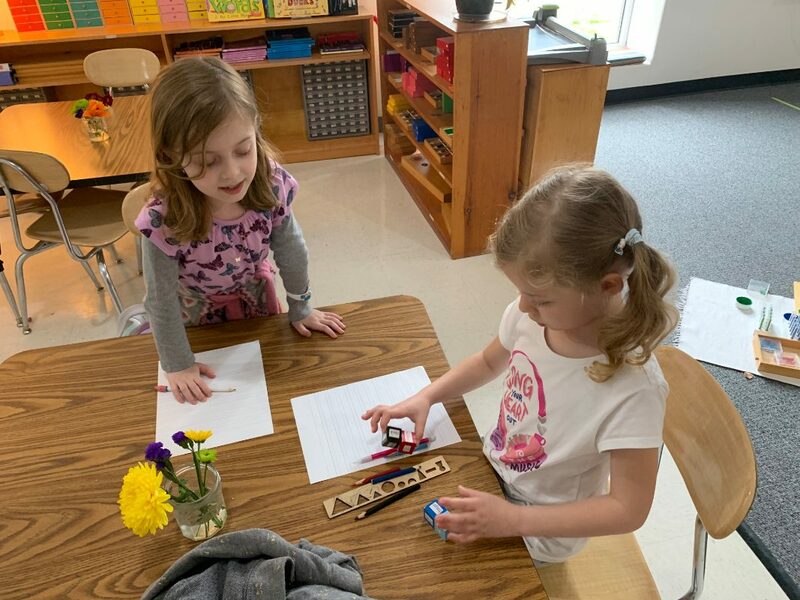 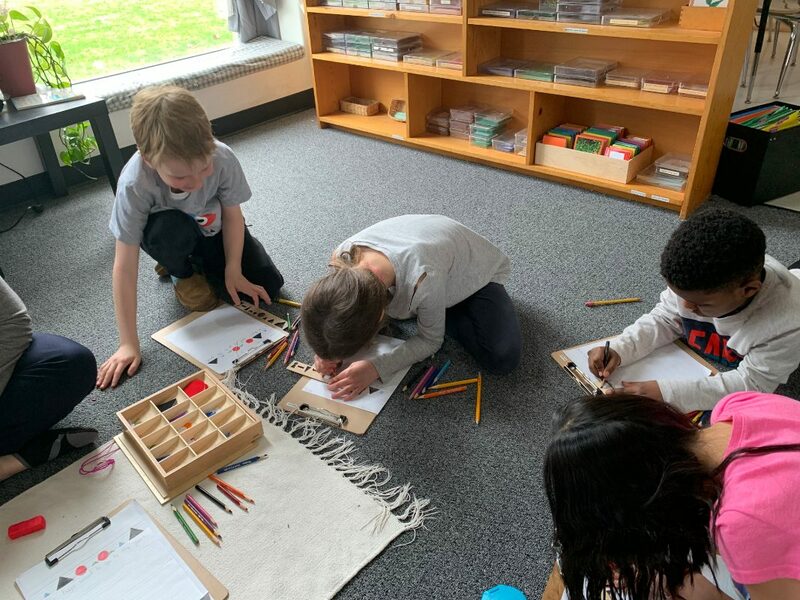 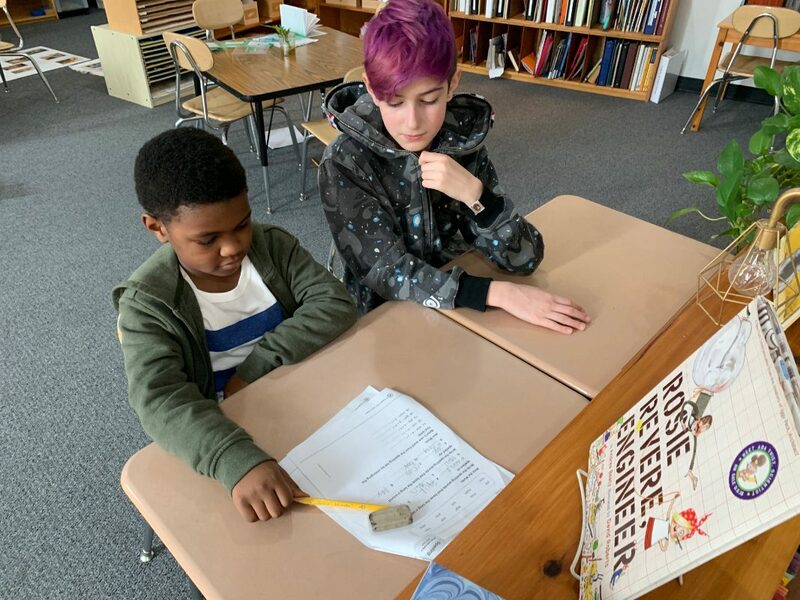 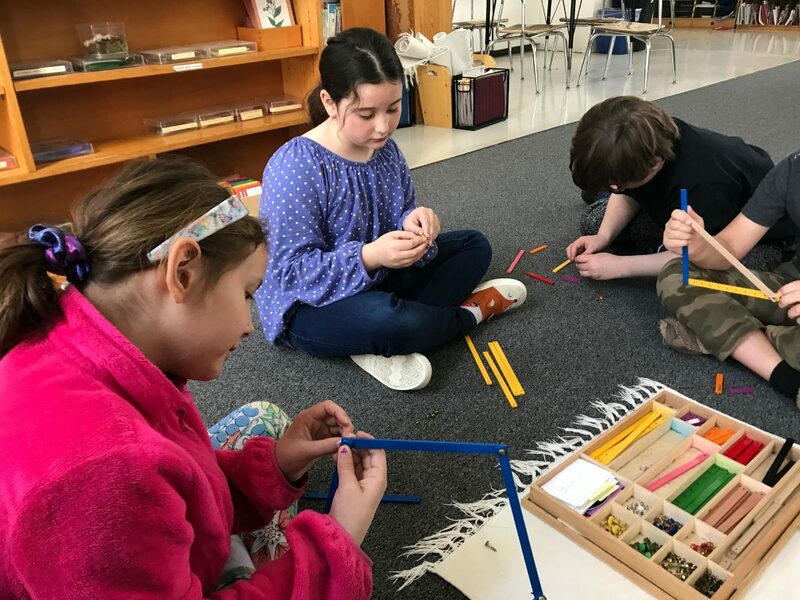 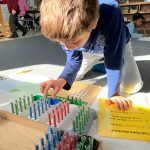 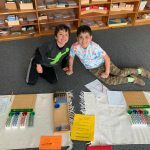 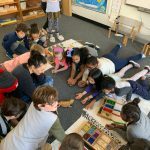 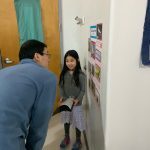 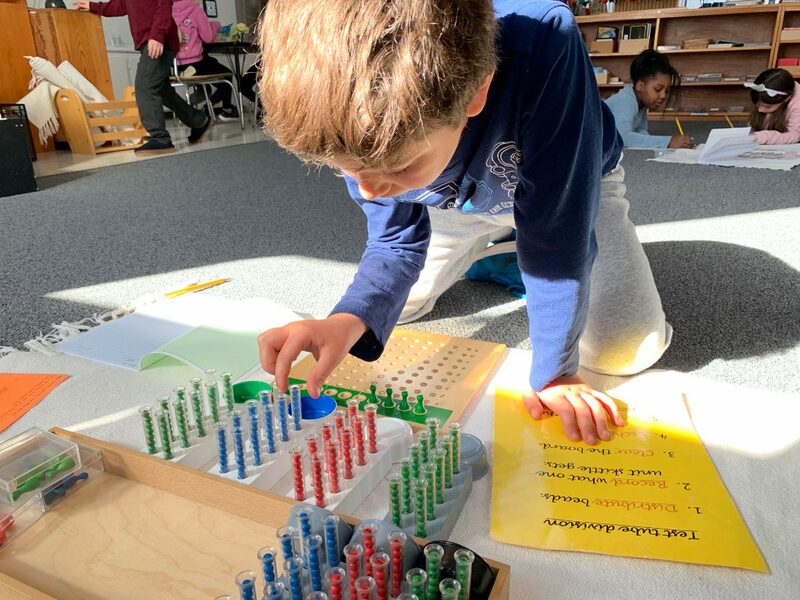 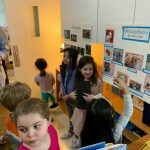 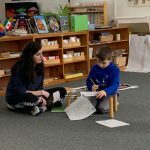 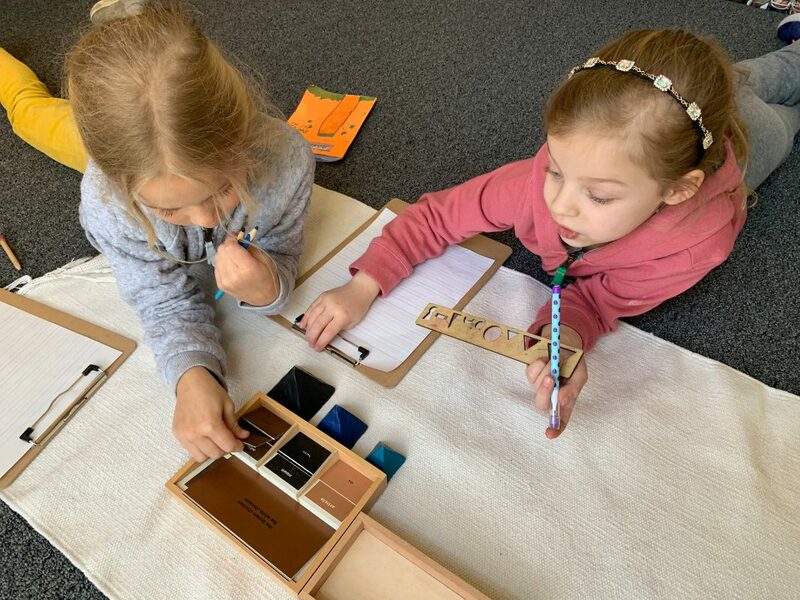 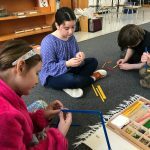 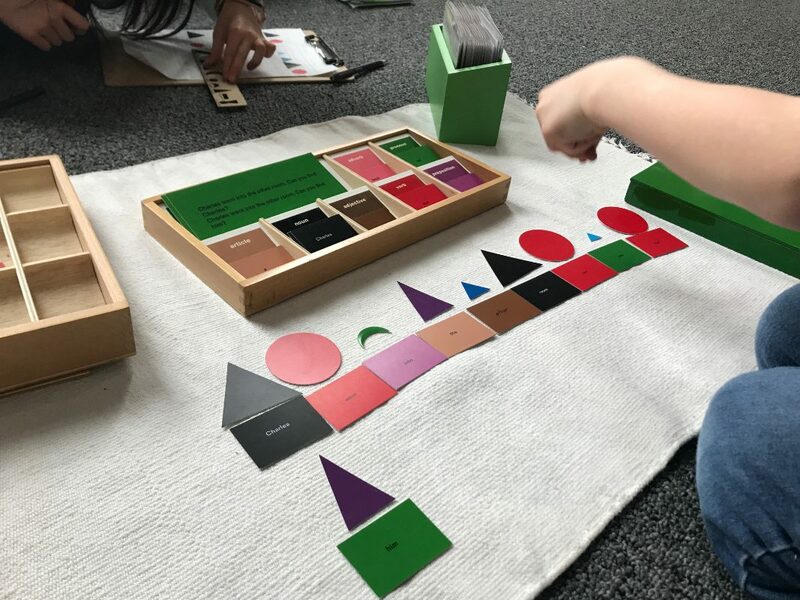 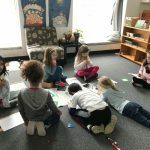 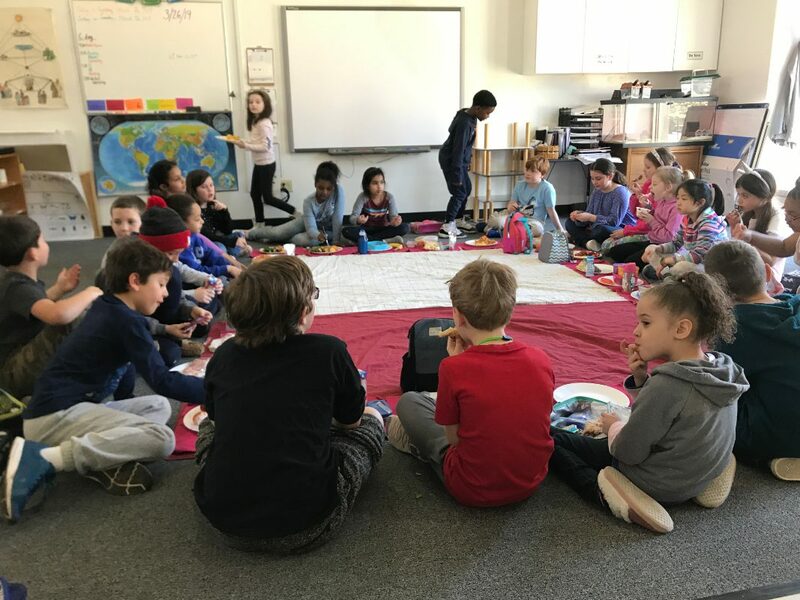 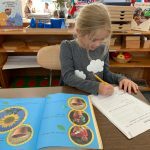 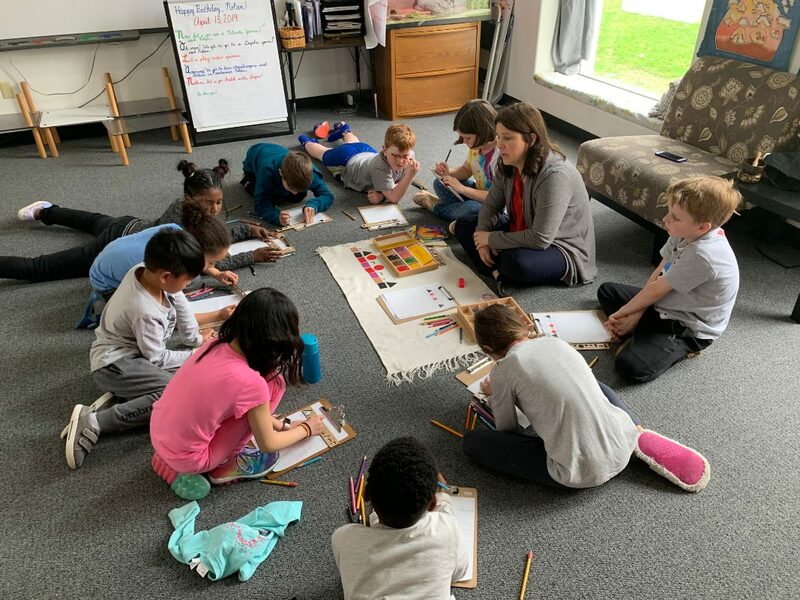 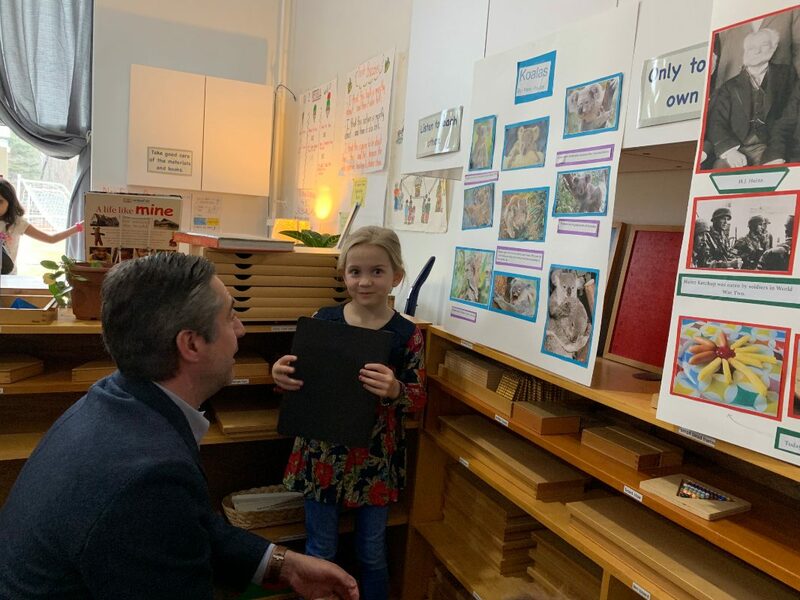 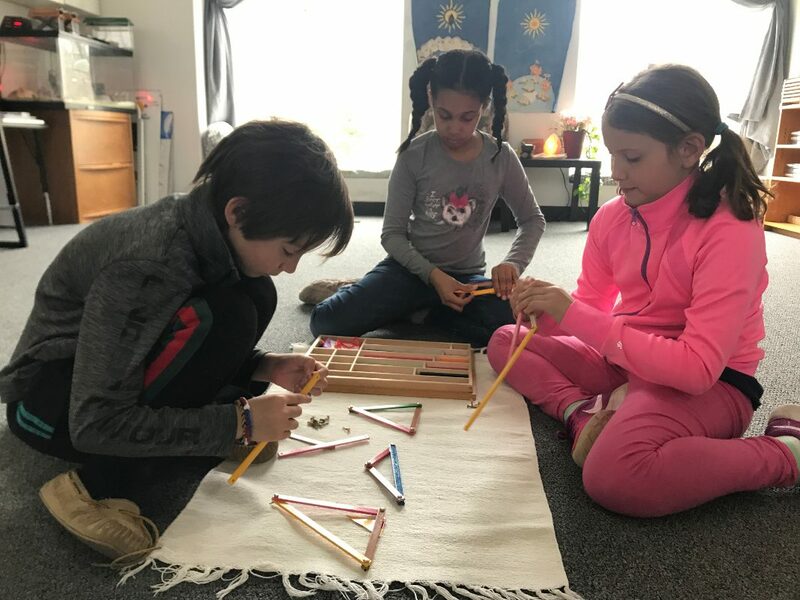 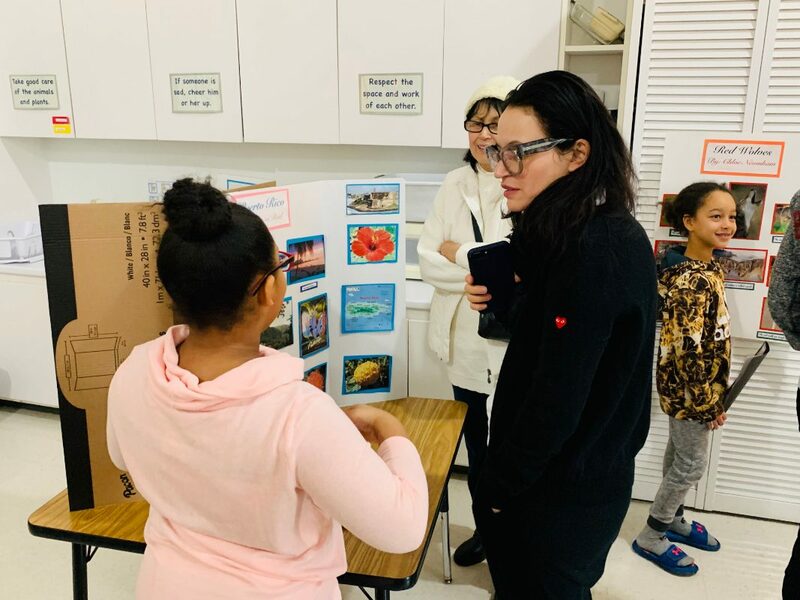 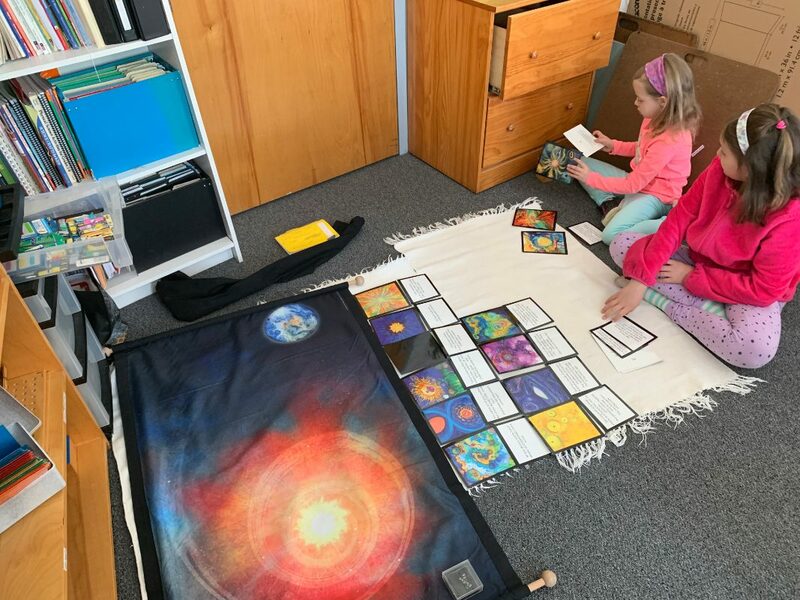 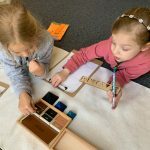 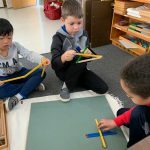 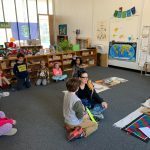 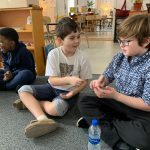 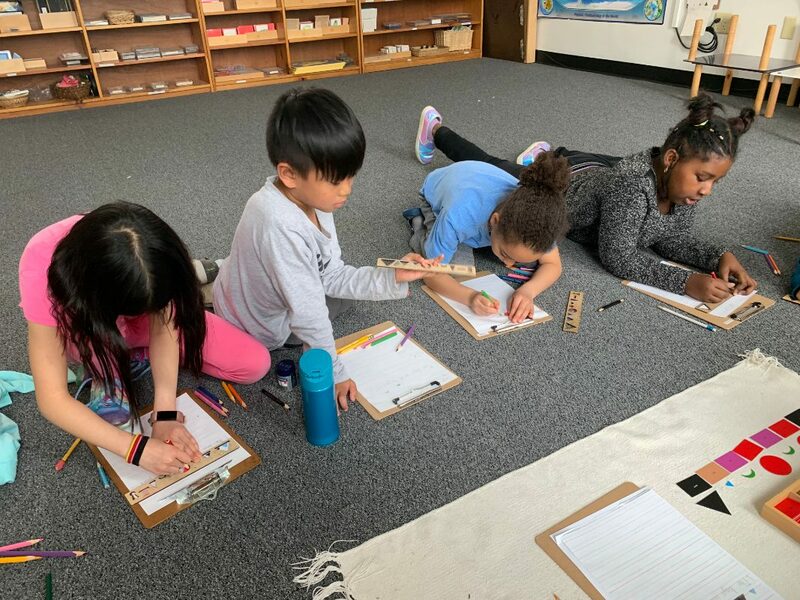 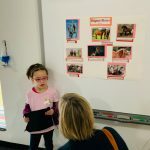 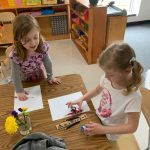 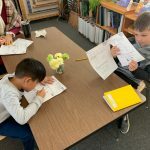 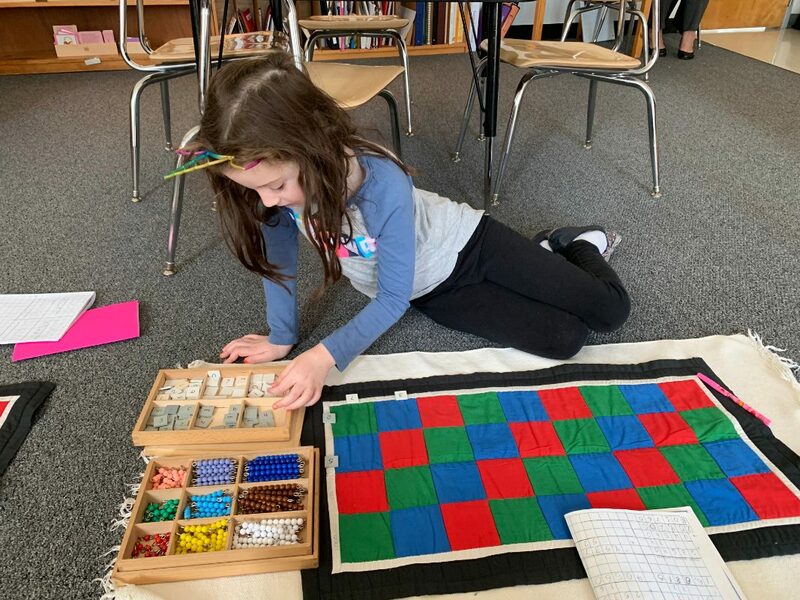 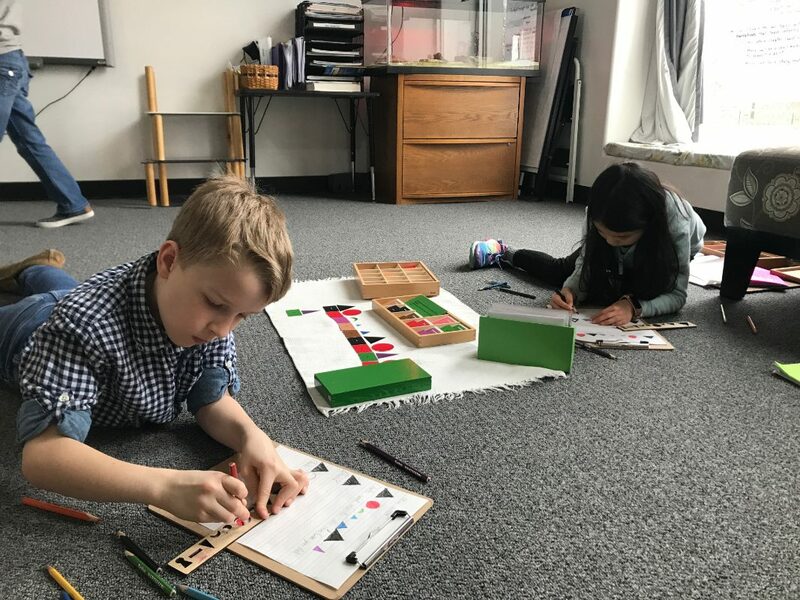 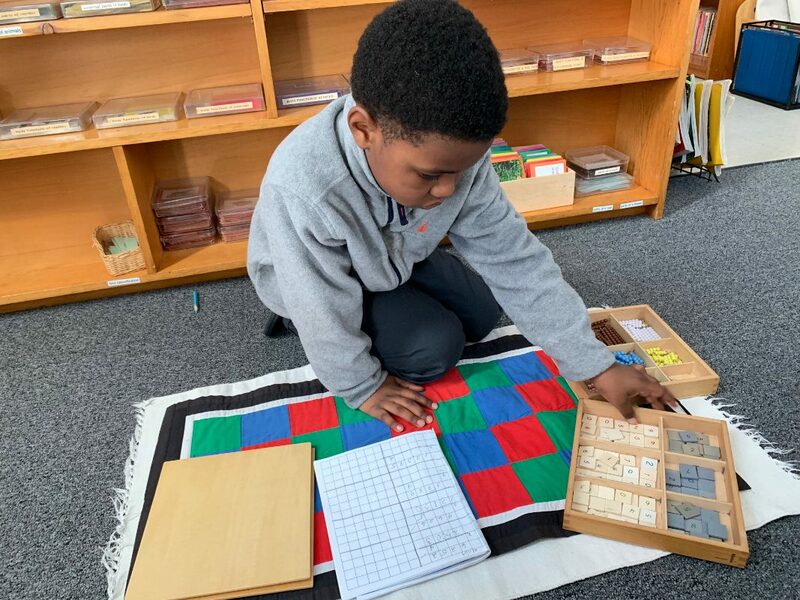 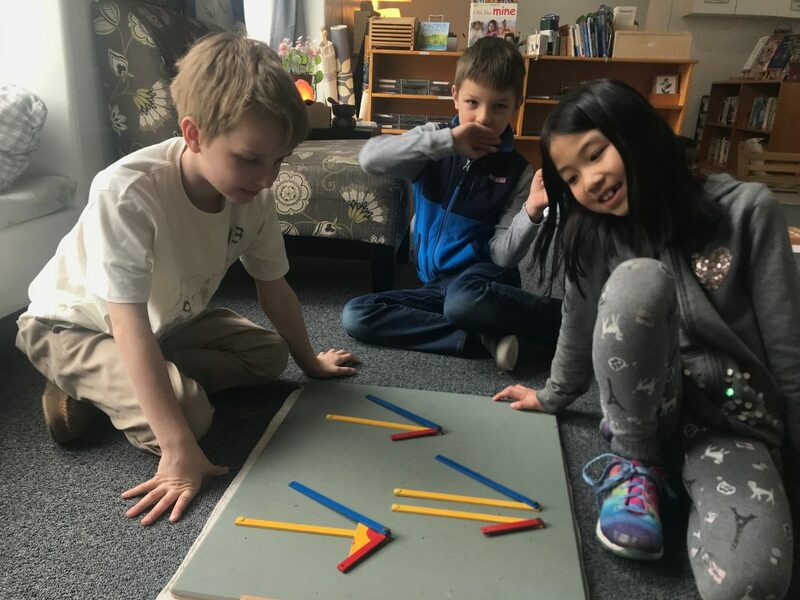 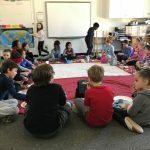 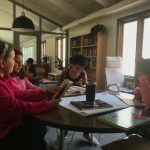 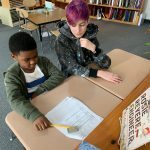 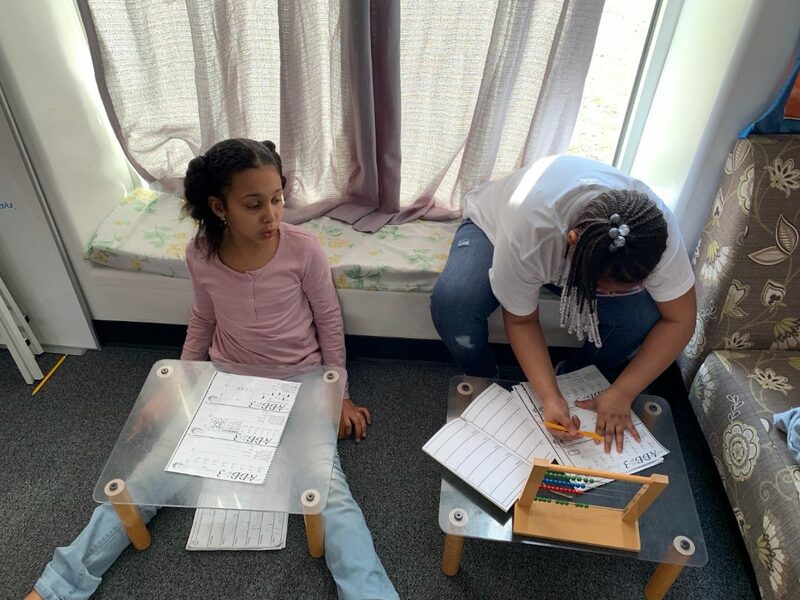 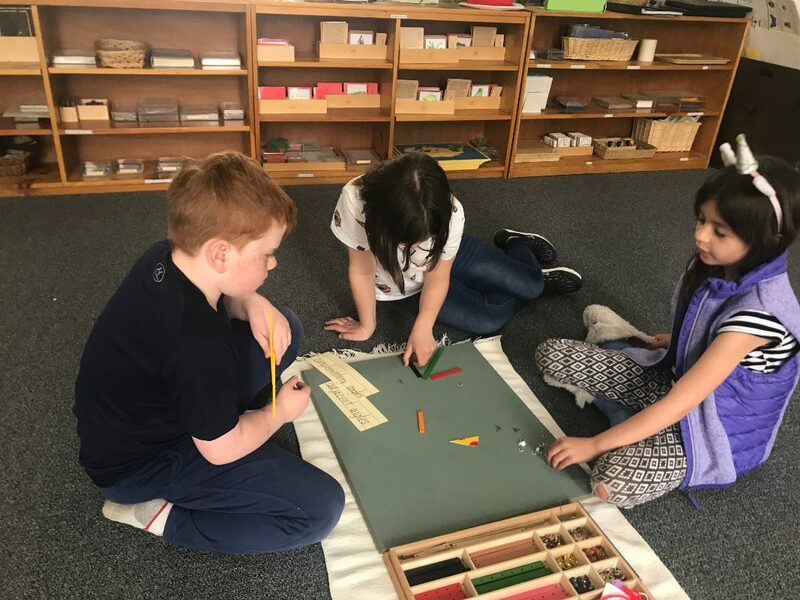 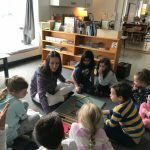 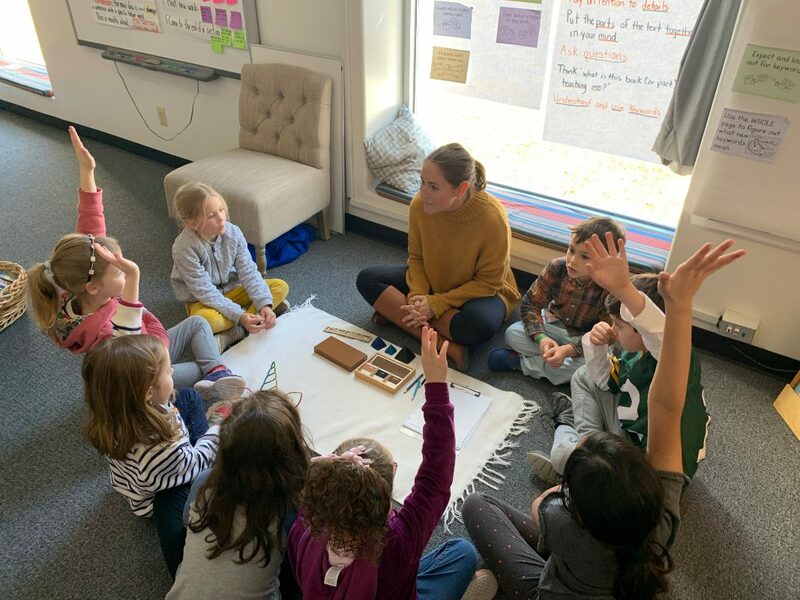 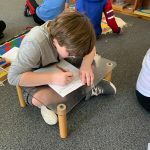 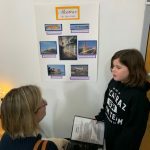 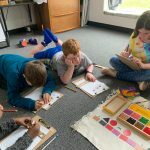 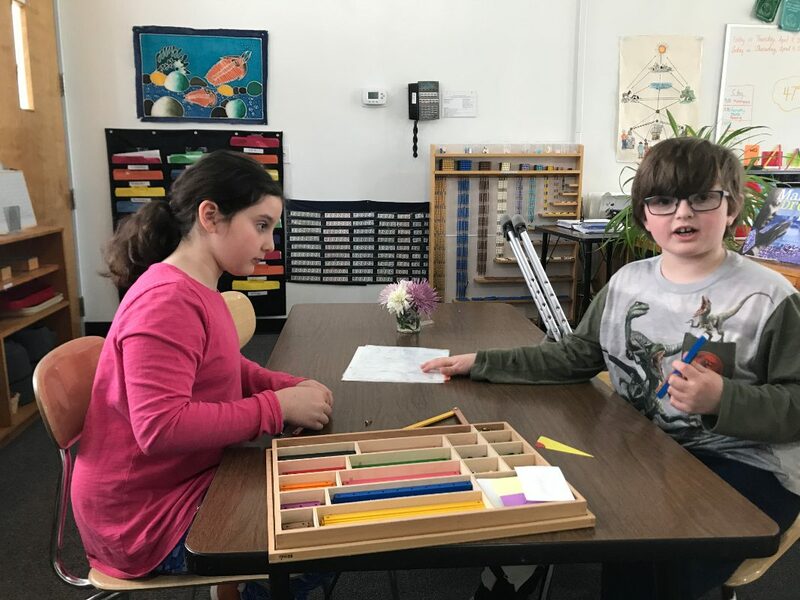 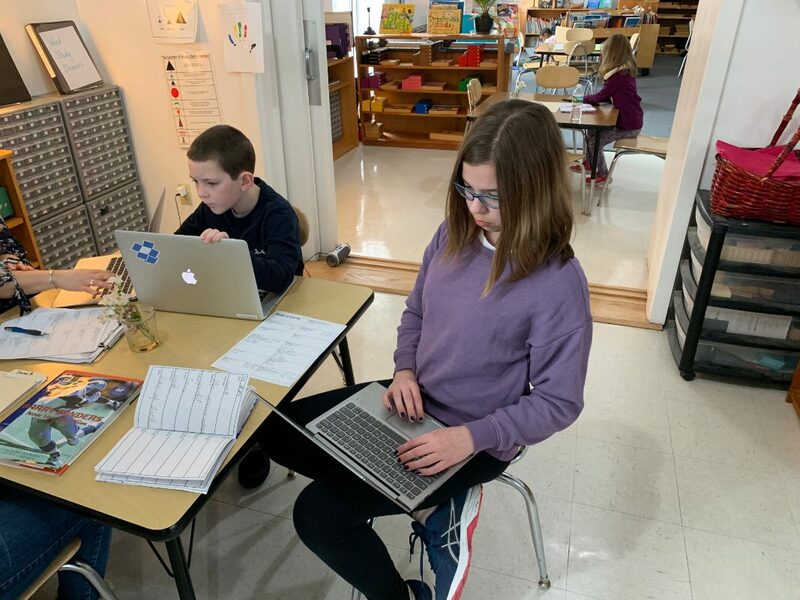 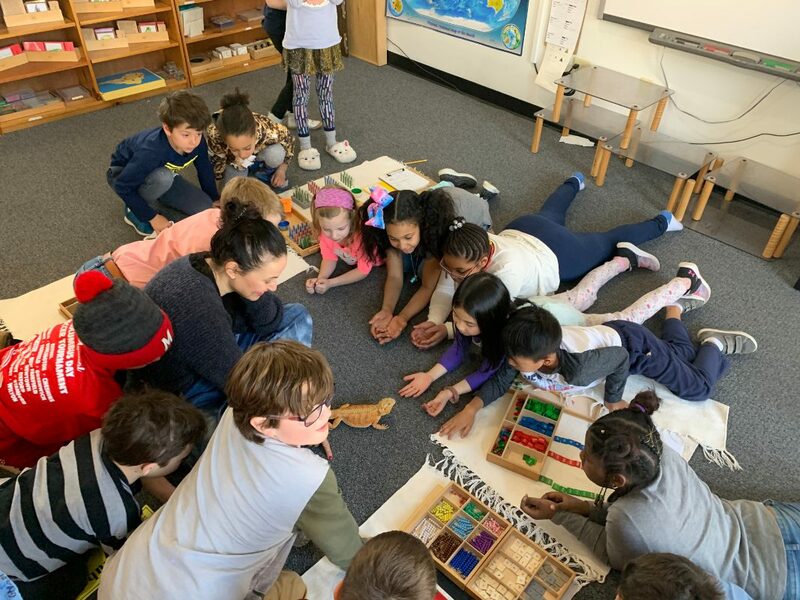 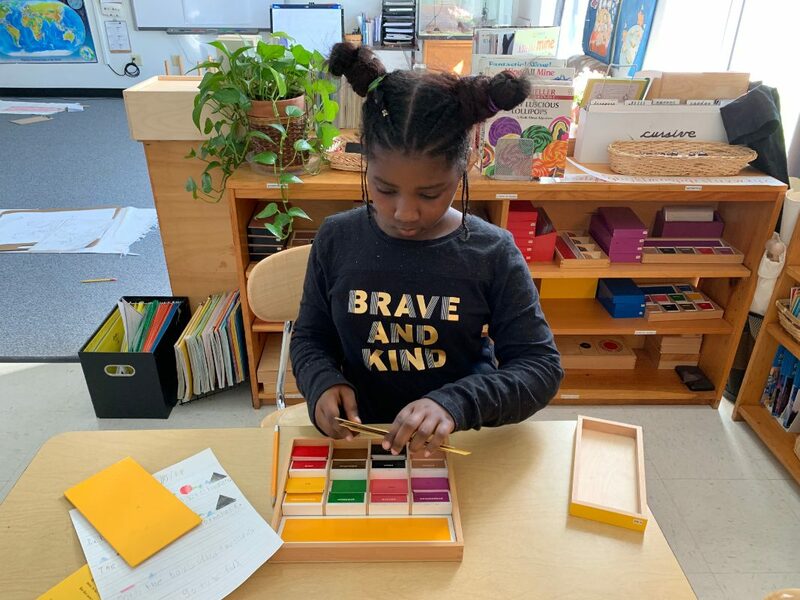 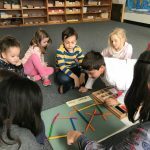 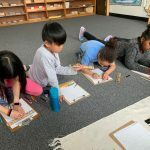 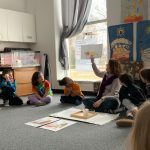 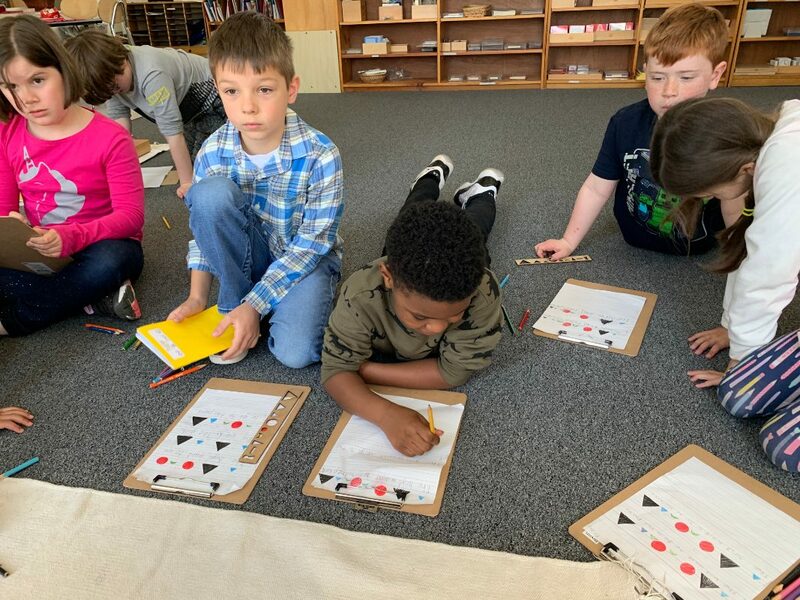 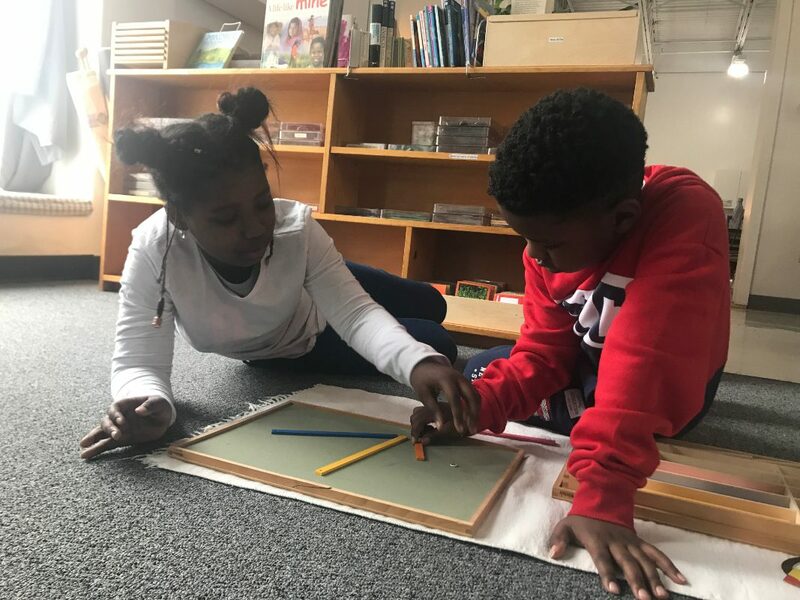 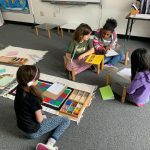 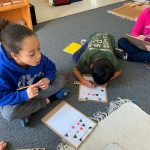 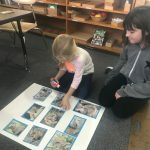 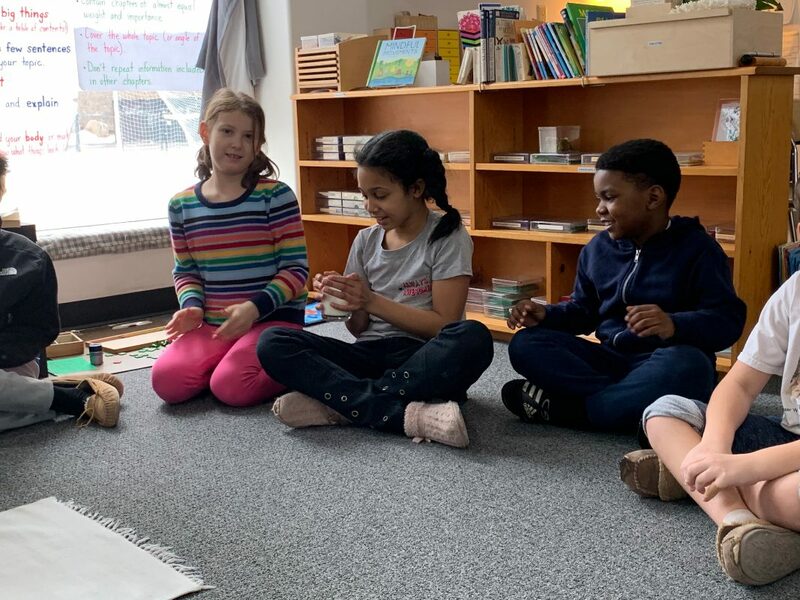 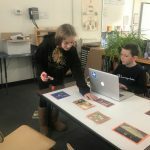 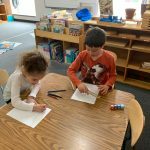 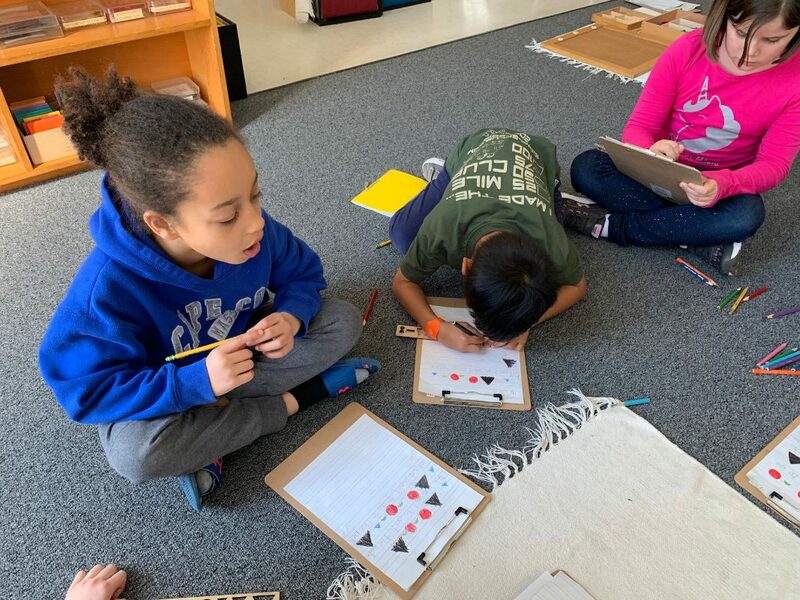 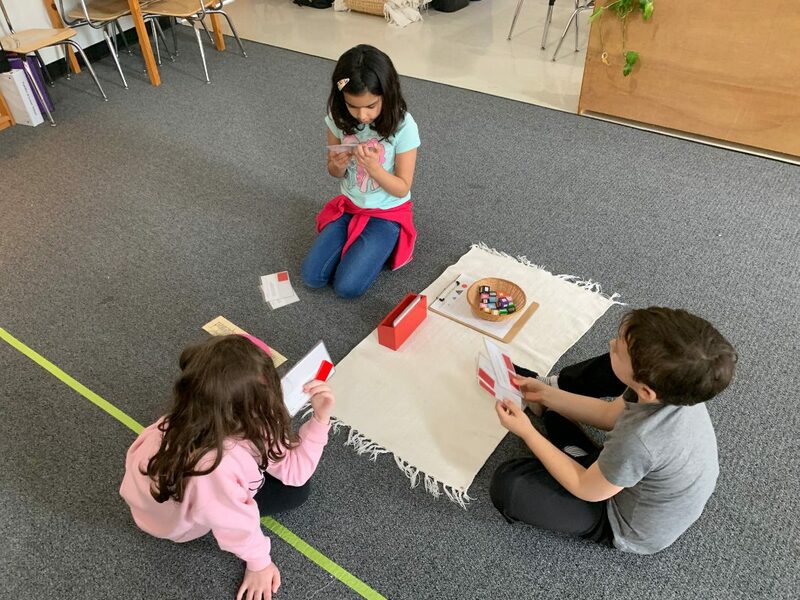 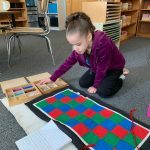 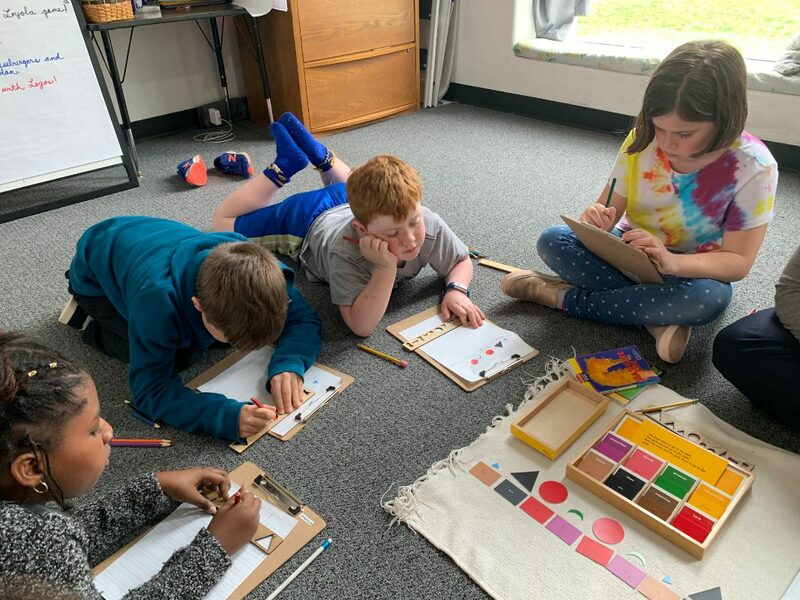 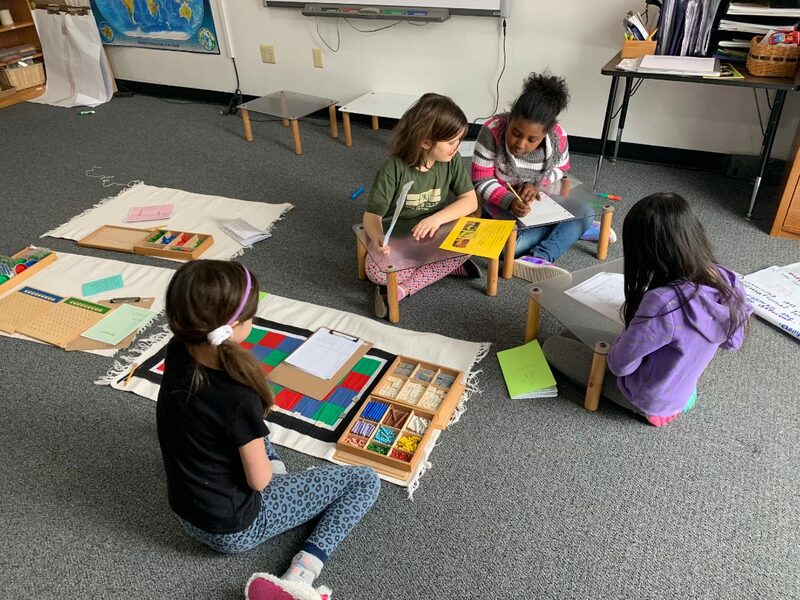 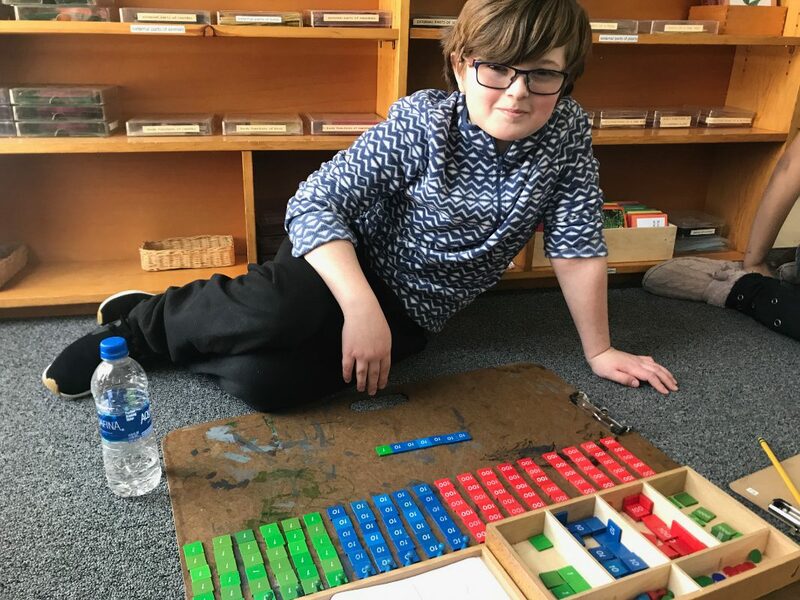 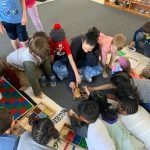 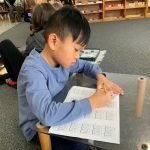 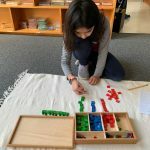 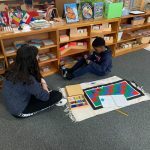 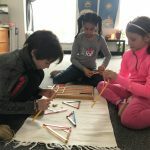 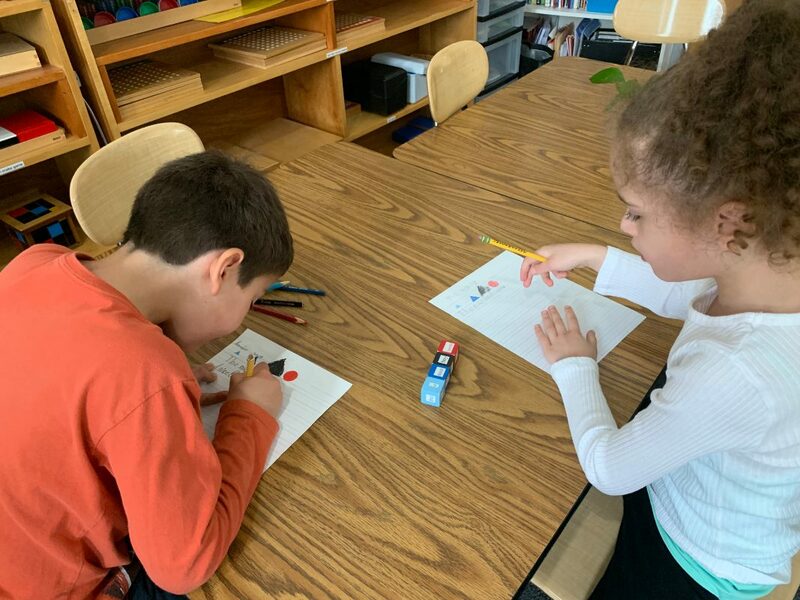 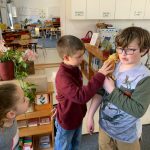 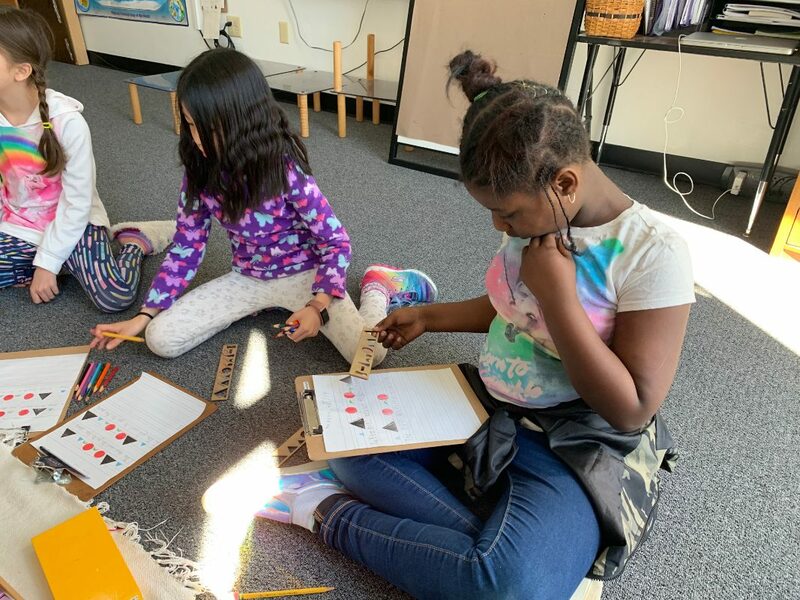 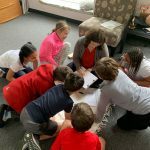 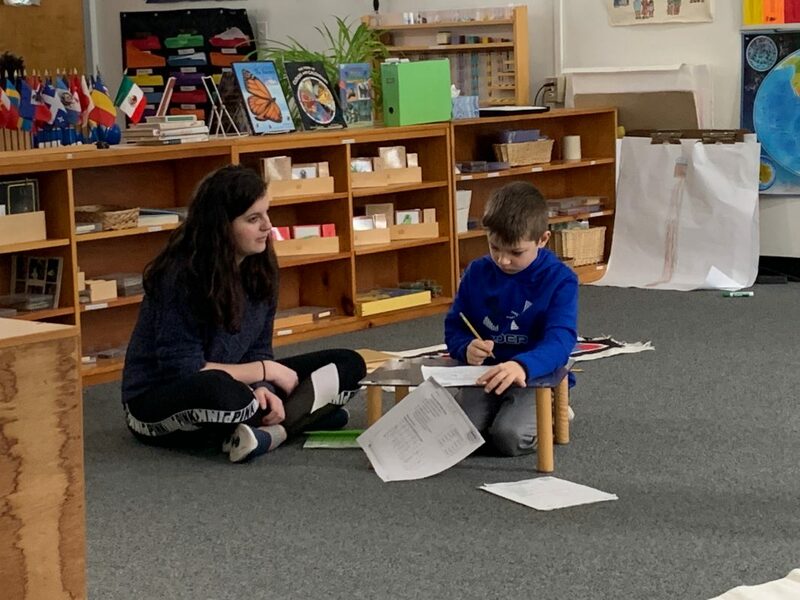 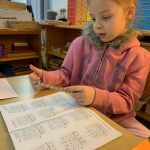 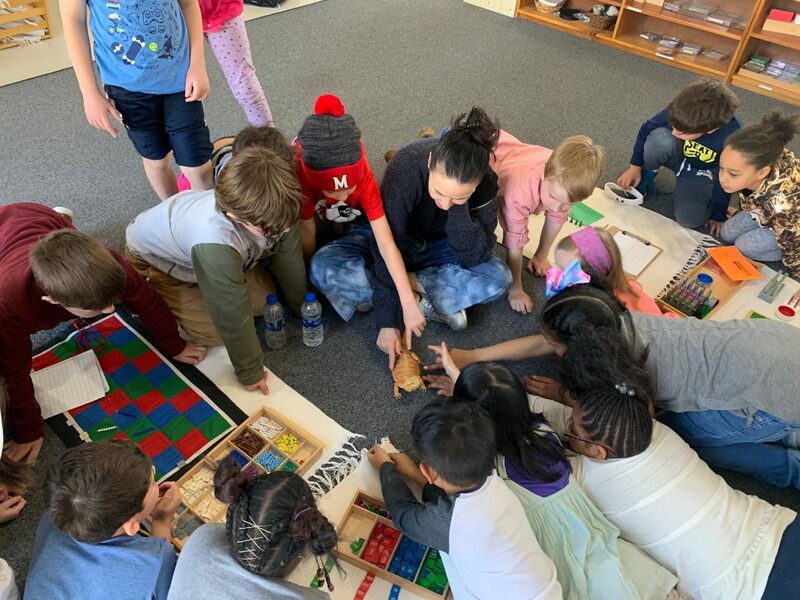 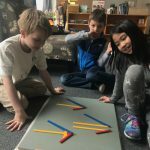 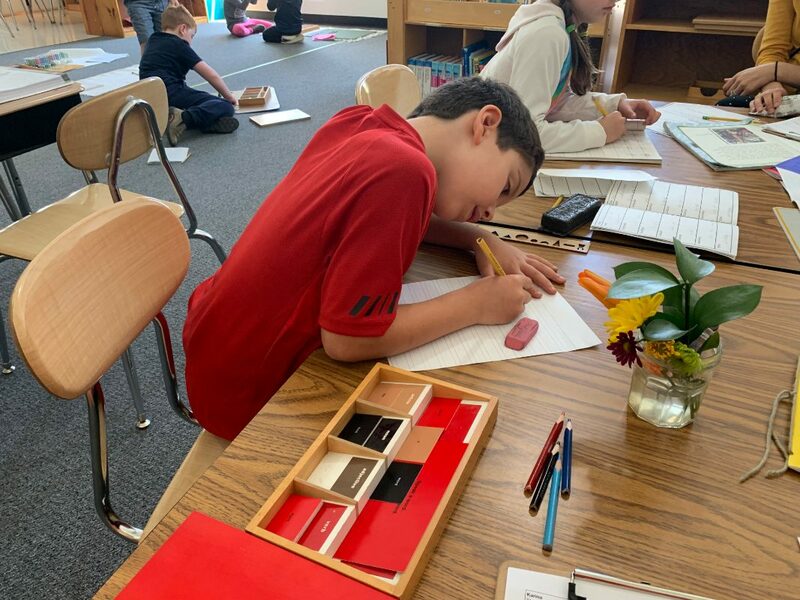 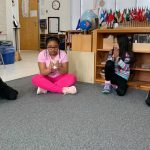 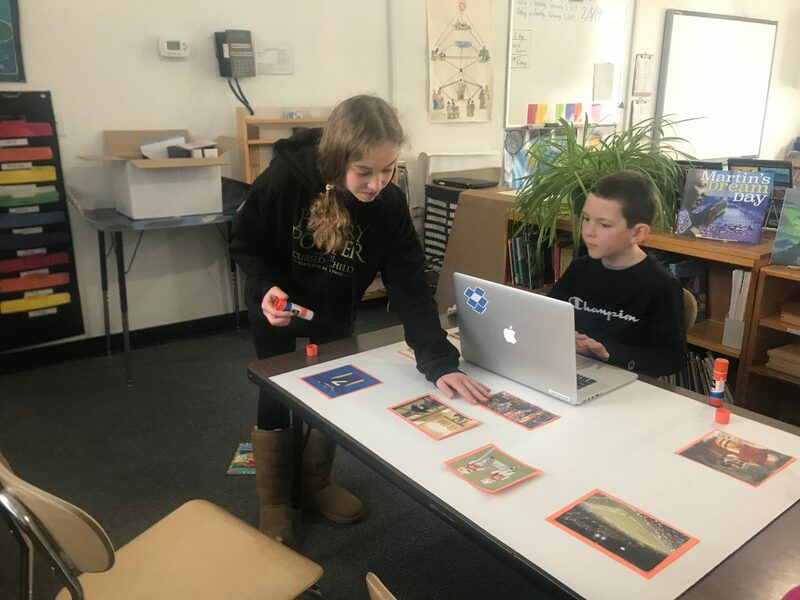 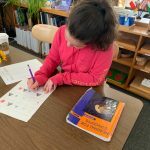 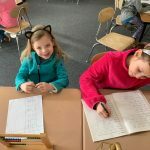 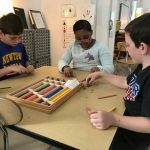 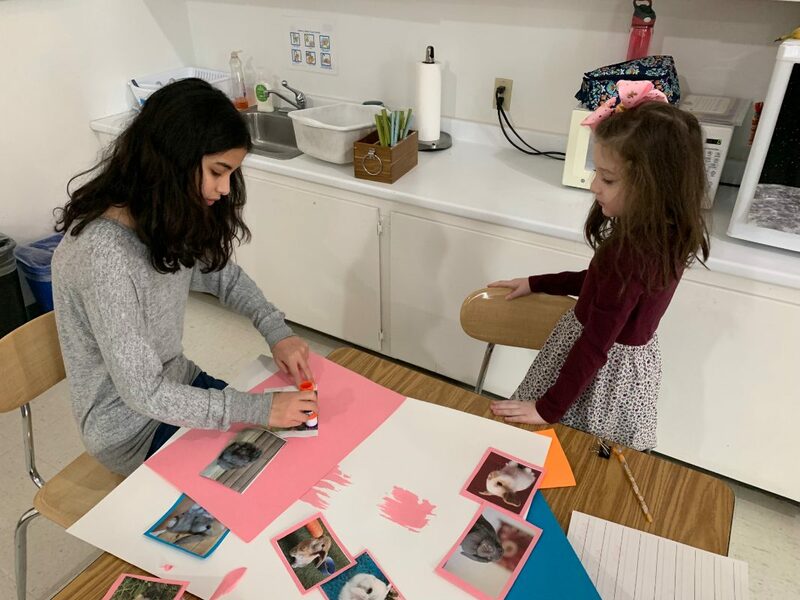 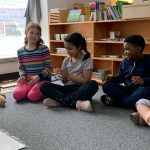 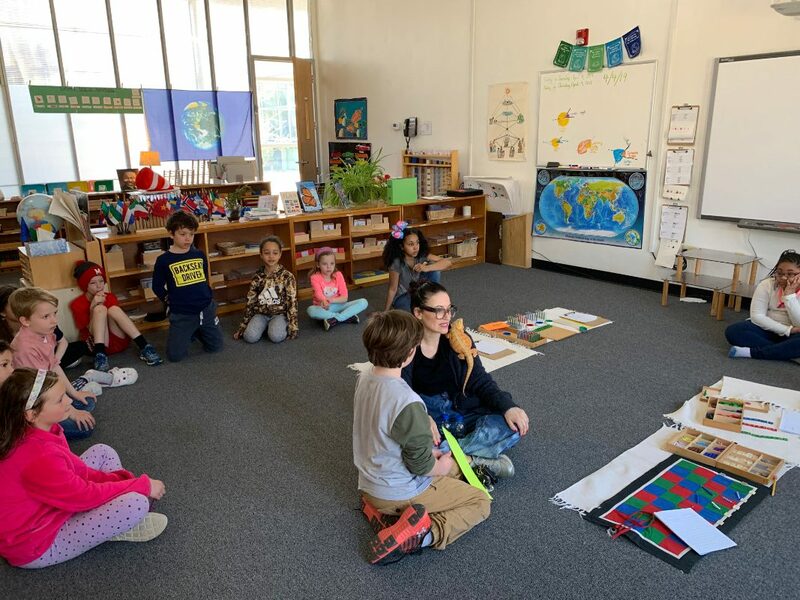 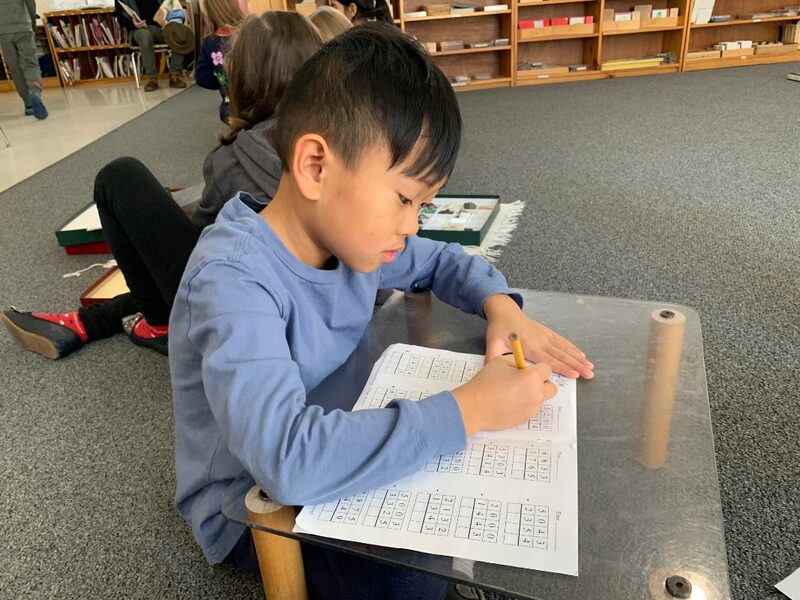 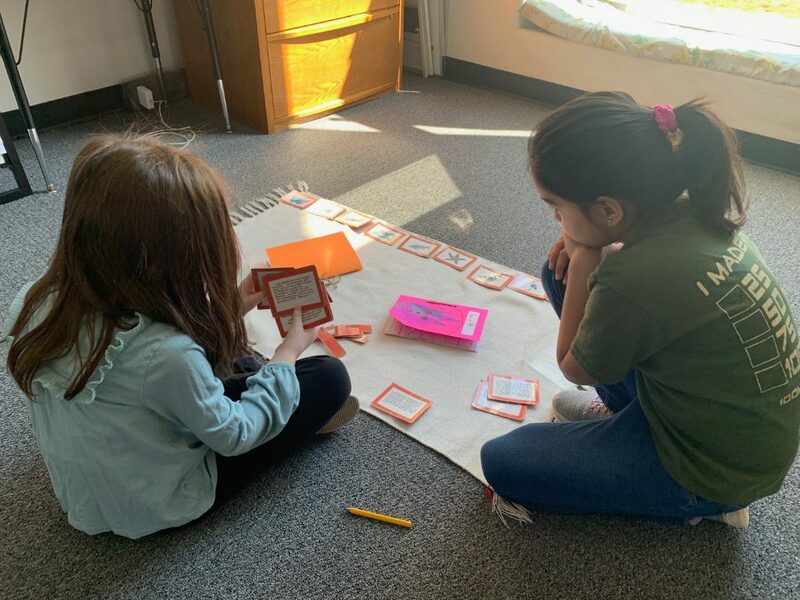 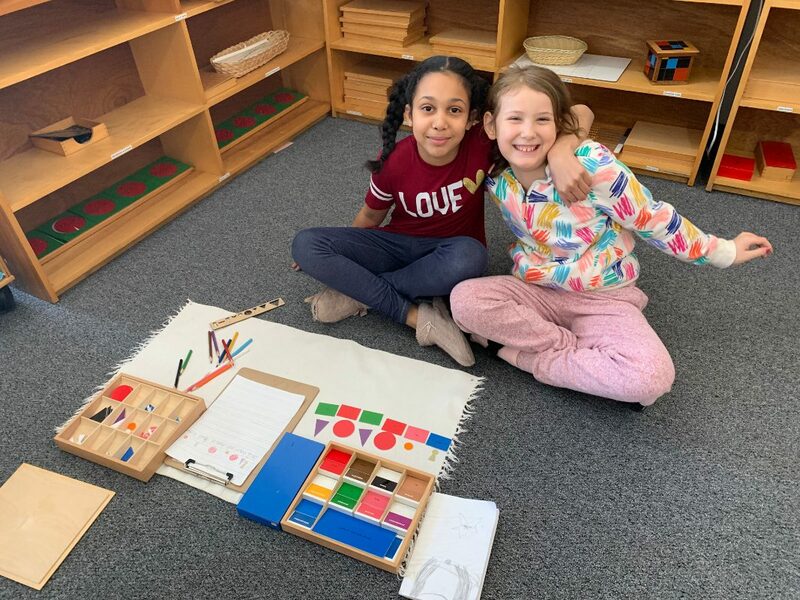 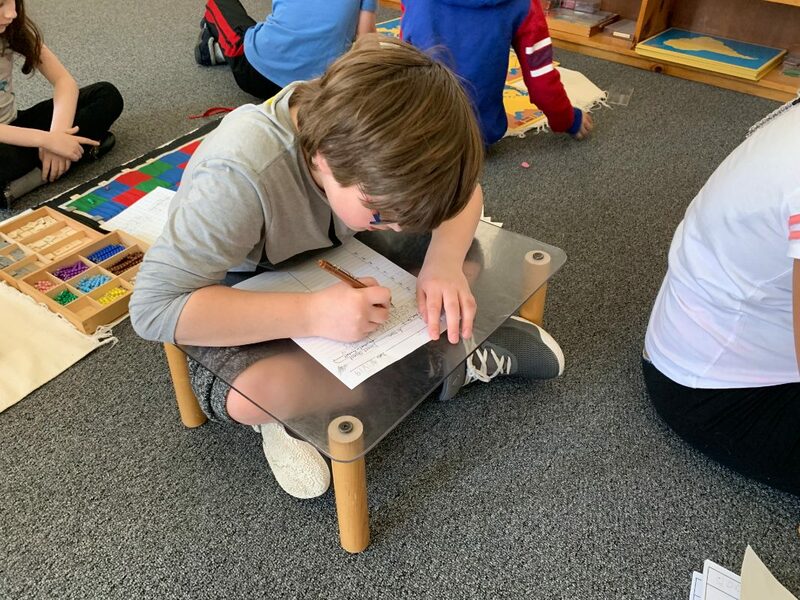 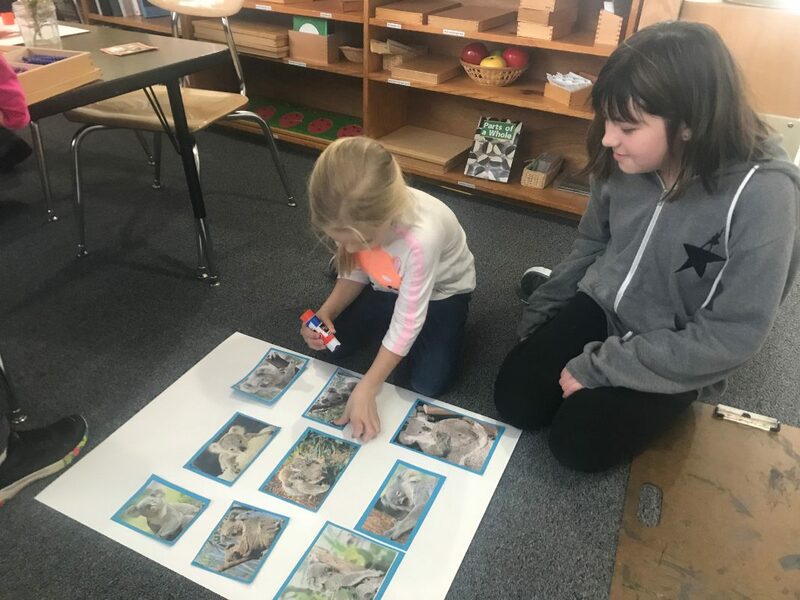 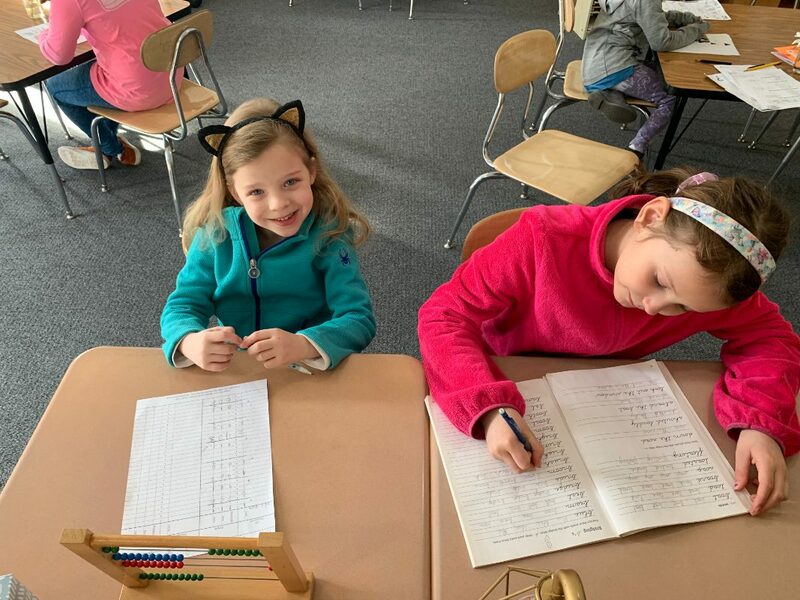 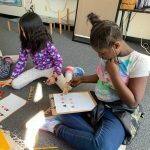 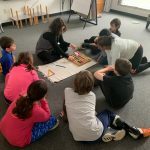 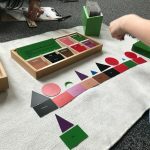 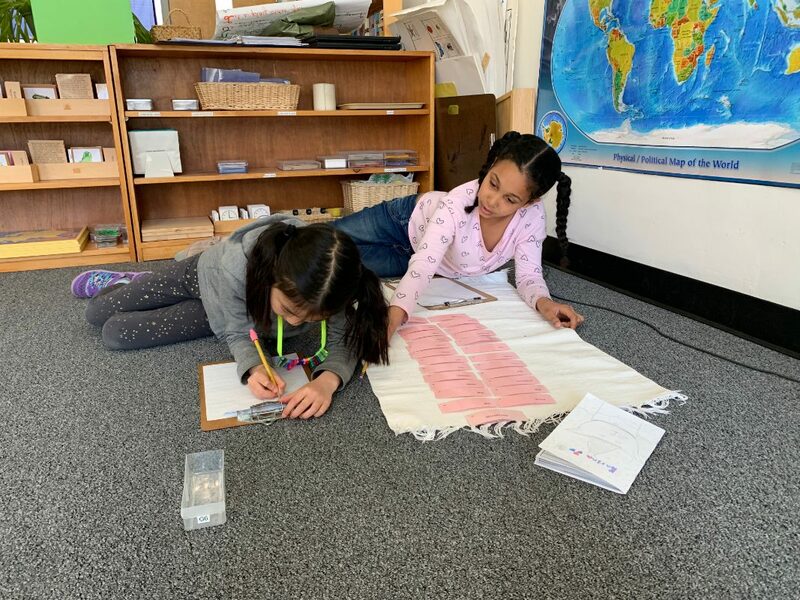 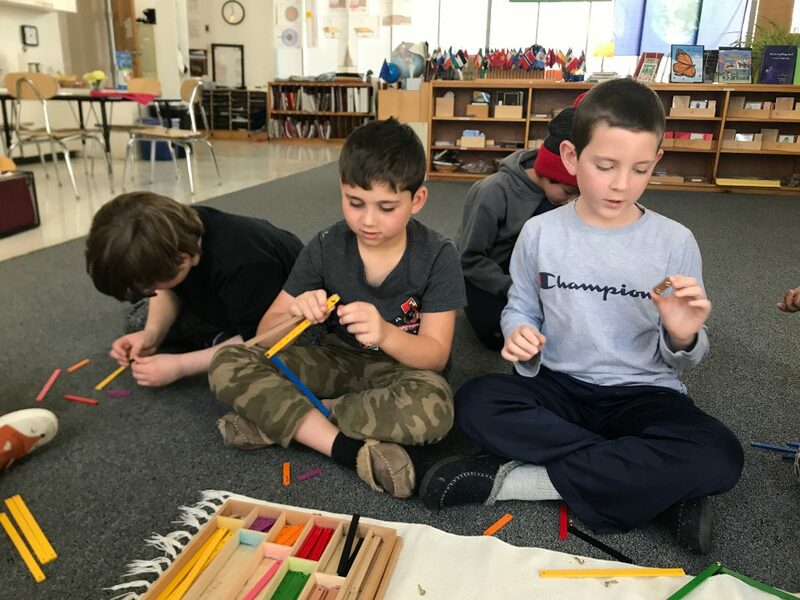 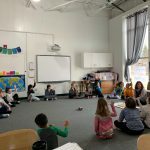 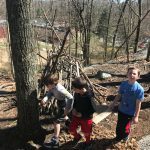 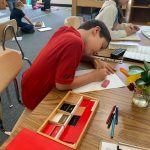 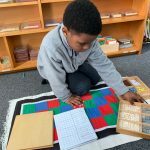 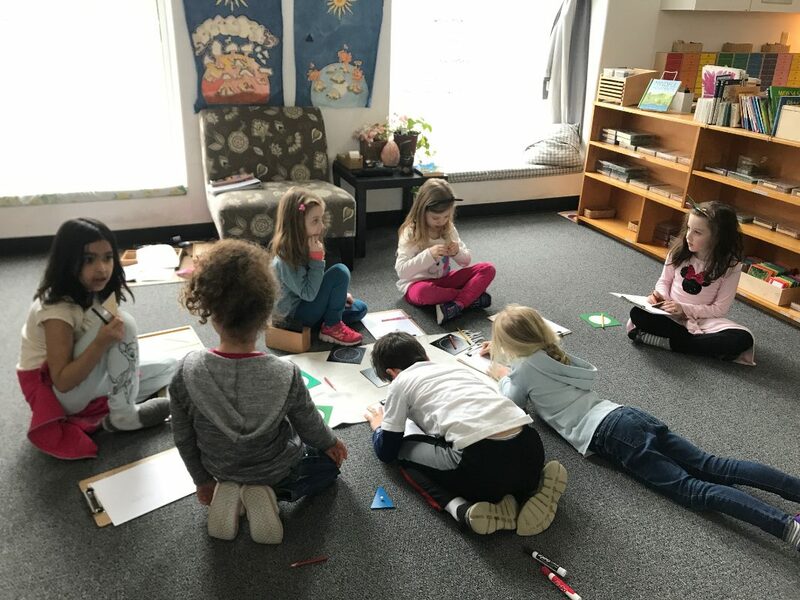 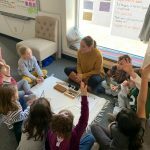 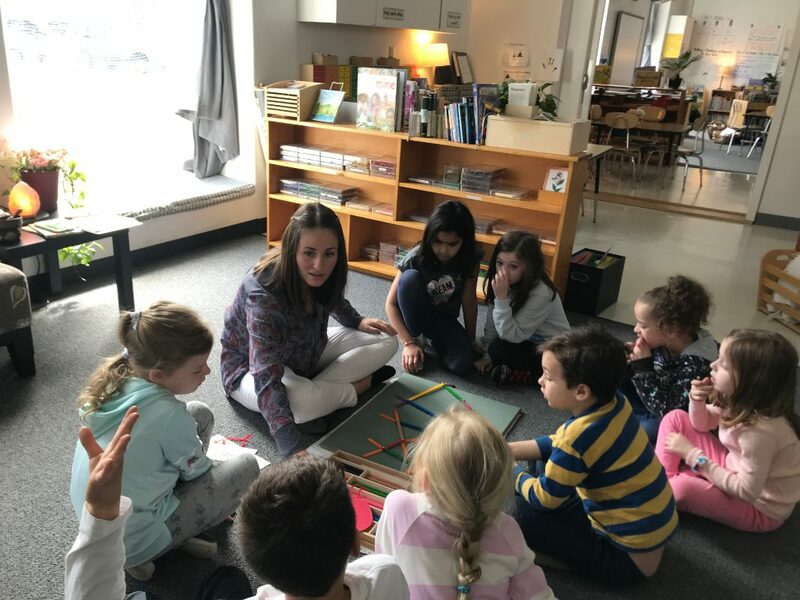 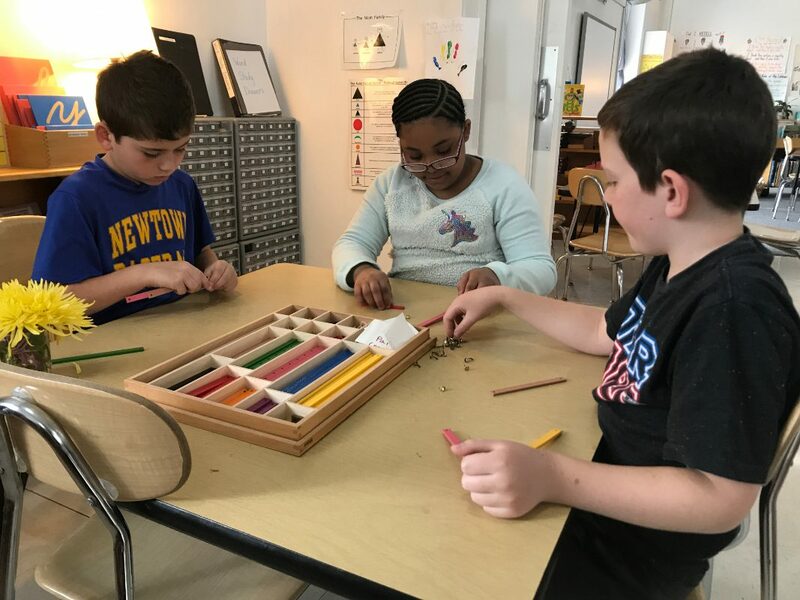 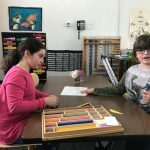 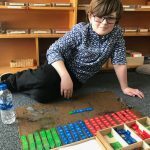 One of my favorite aspects about the Montessori curriculum is that it fosters autonomous learners, which means, children are learning the skills they need to be independent, successful citizens. 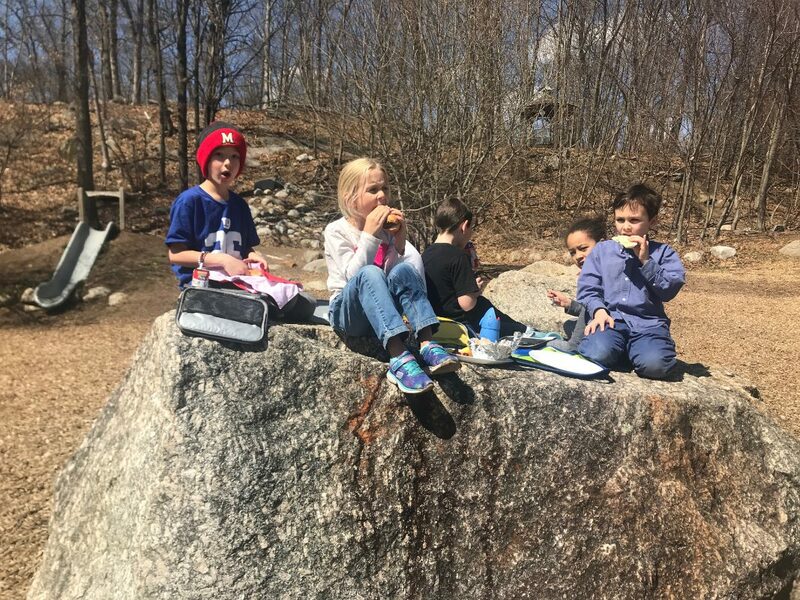 When children are provided with concrete experiences, both academically and emotionally, they are able to progress to abstract concepts. 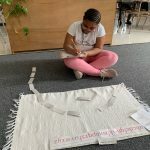 They learn the skills, they are able to reflect upon their strengths and learn from their weaknesses. 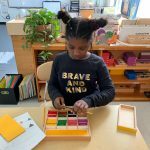 The goal we have for the children in our class is to be self- confident, empathetic individuals. 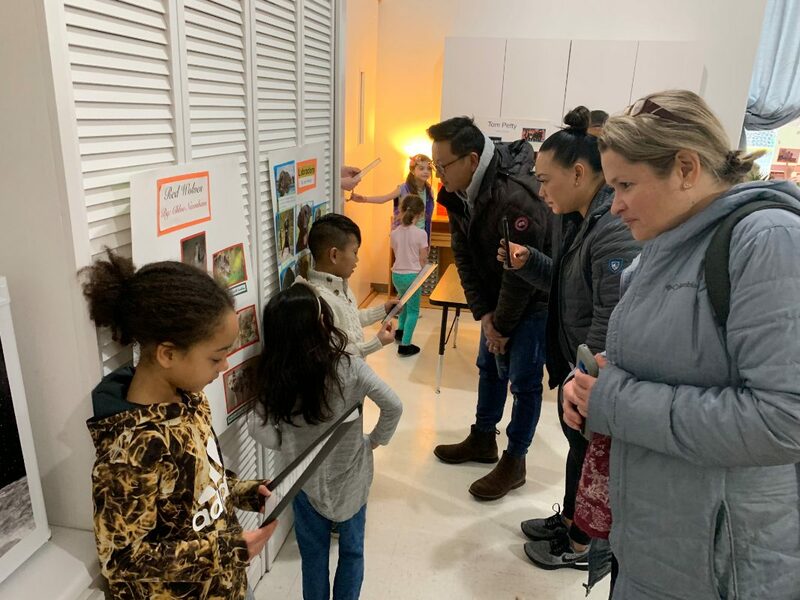 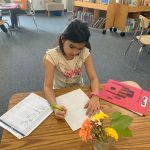 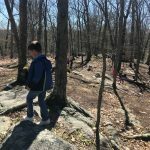 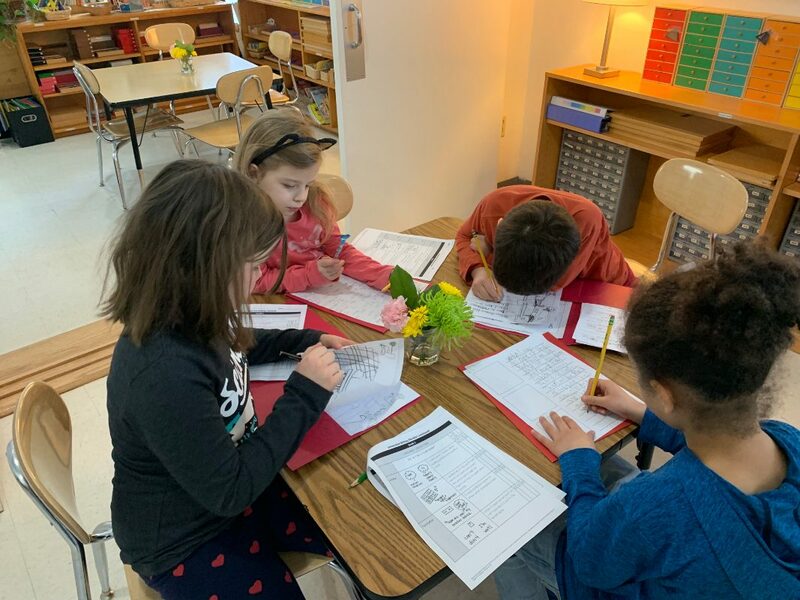 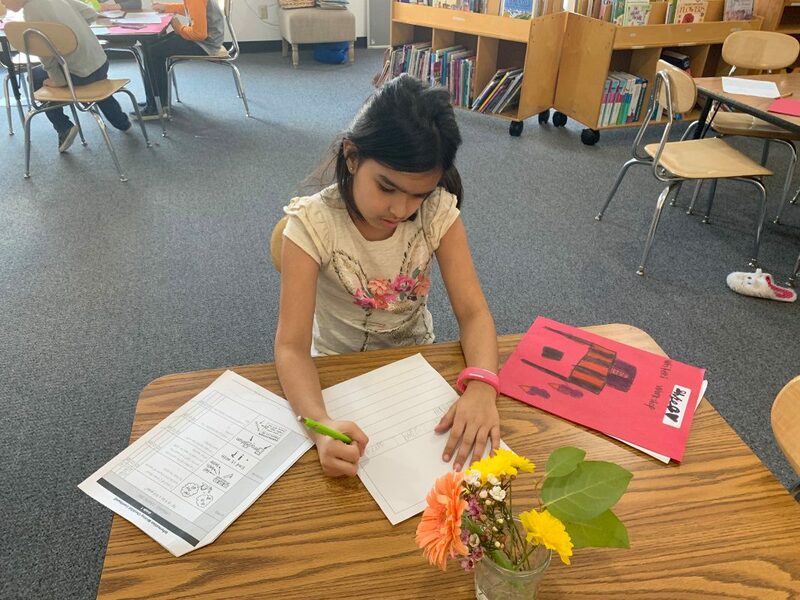 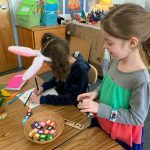 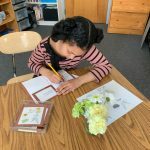 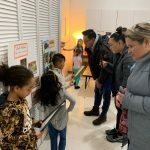 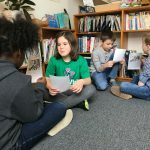 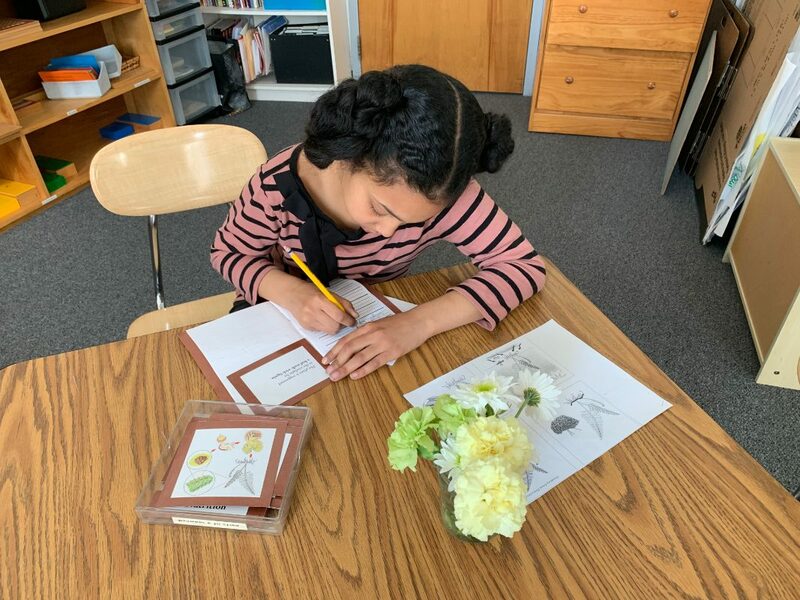 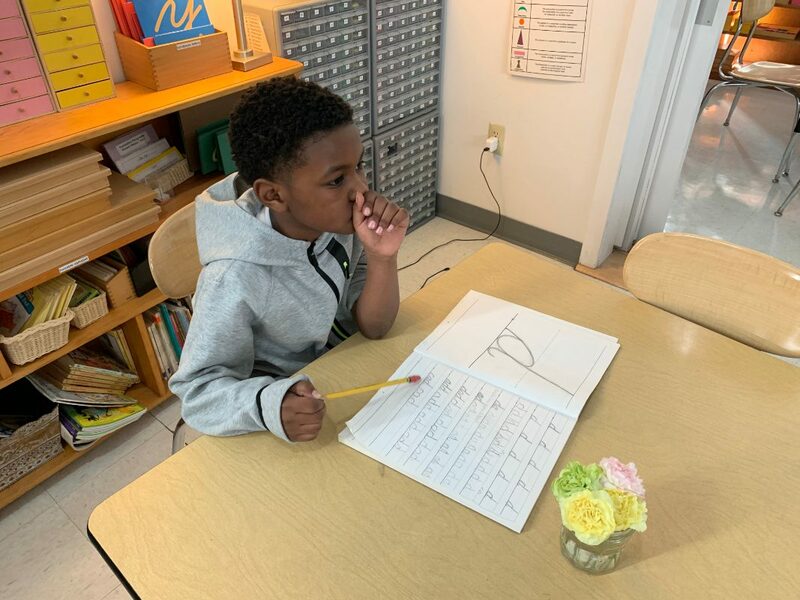 As we enter April, the end of the year seems right around the corner, and we can’t help but reflect on each child’s progress throughout the year. 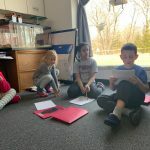 We are so pleased to see what a compassionate, kind-hearted, intelligent group of students we have in our classroom! 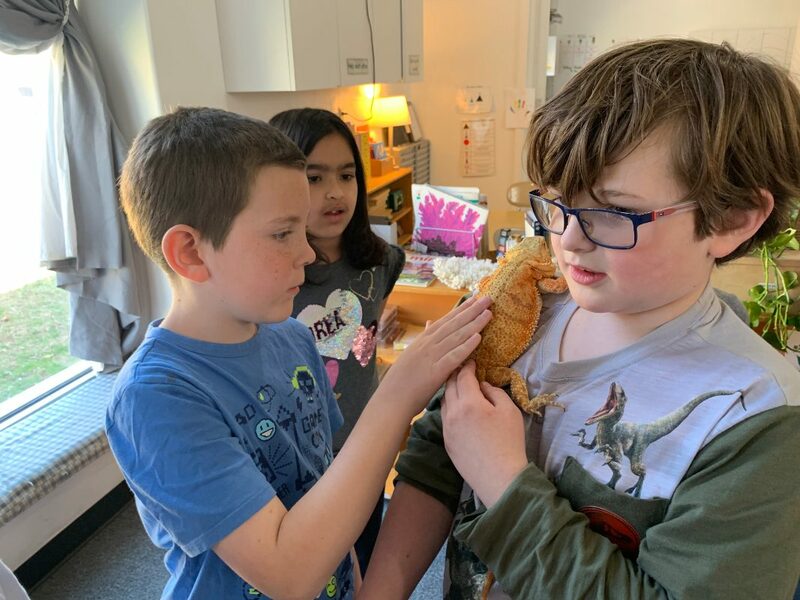 We also had a scaly visitor in our classroom this week. 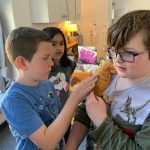 Rexy, a third-year student’s bearded dragon, came to help us learn more about our reptile studies. 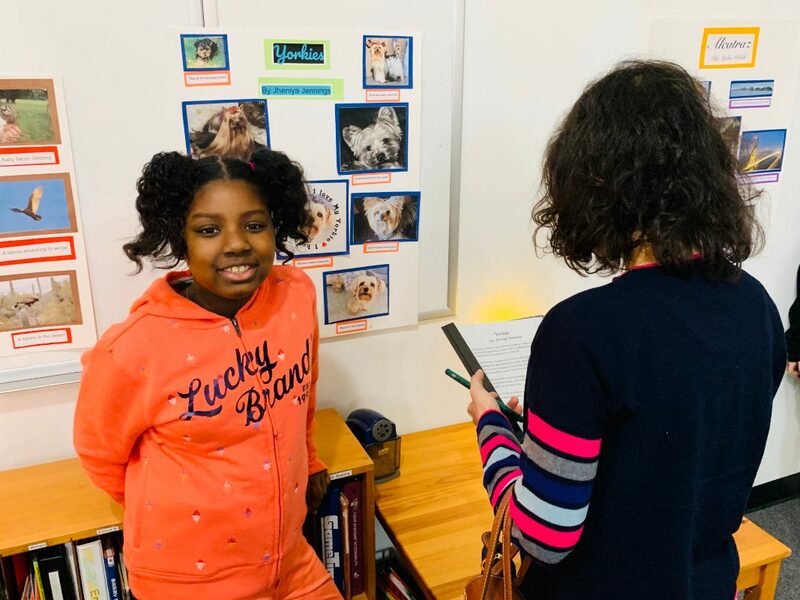 The students had a blast engaging in conversation about her, observing her and having the chance to pet her. 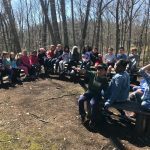 What an awesome week we had! 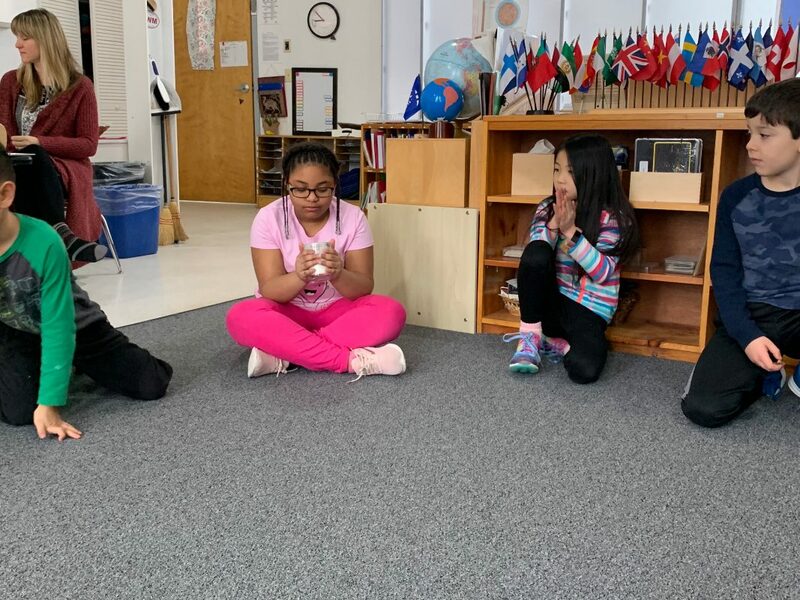 This time of year, after March Break is over and our play preparations have begun, is so energizing for all of us! 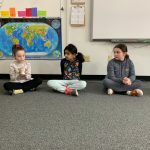 We have begun our mornings with our Upper Elementary friends. 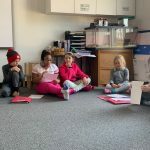 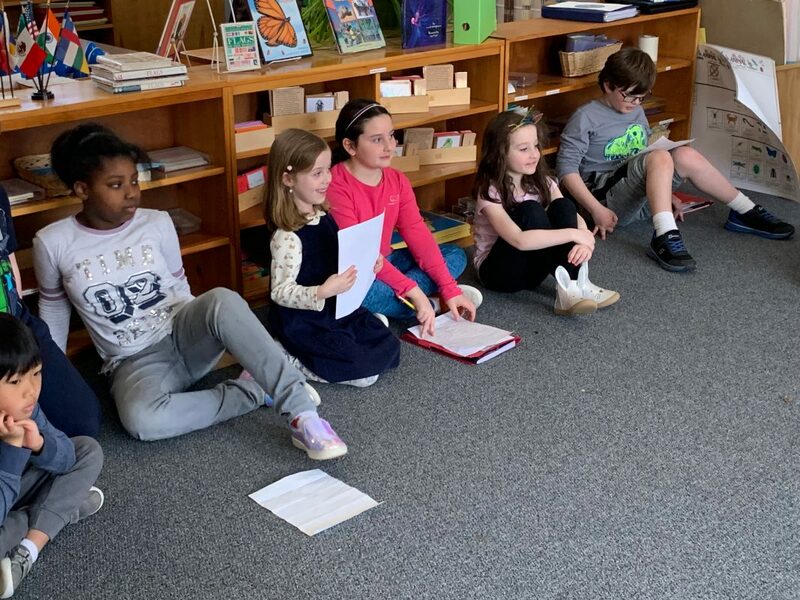 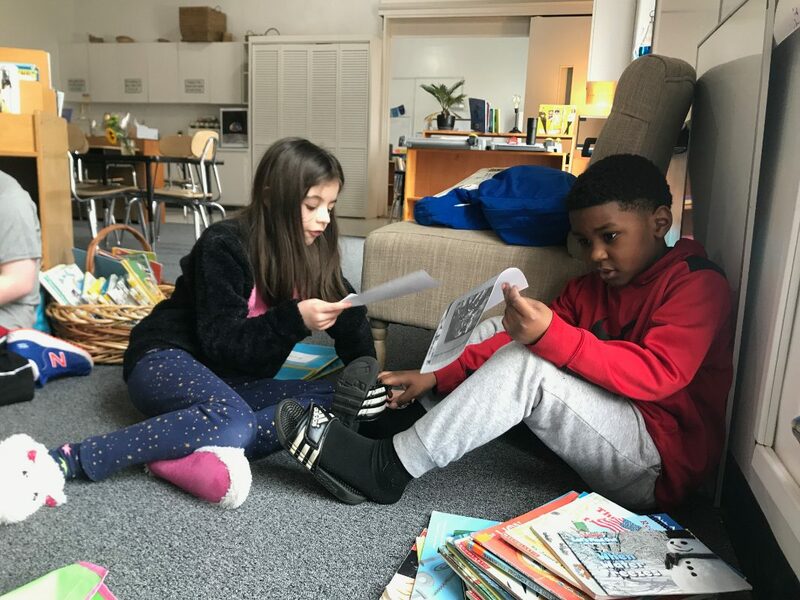 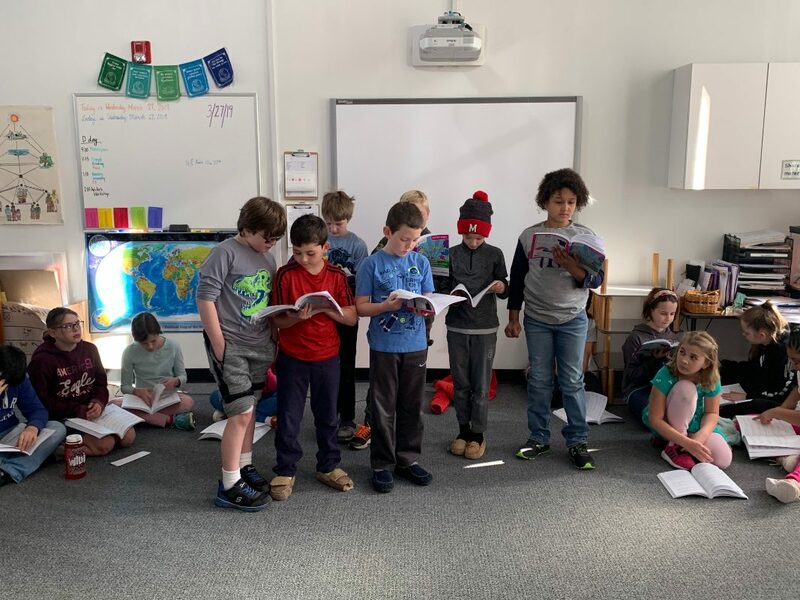 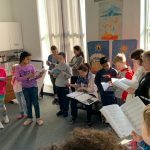 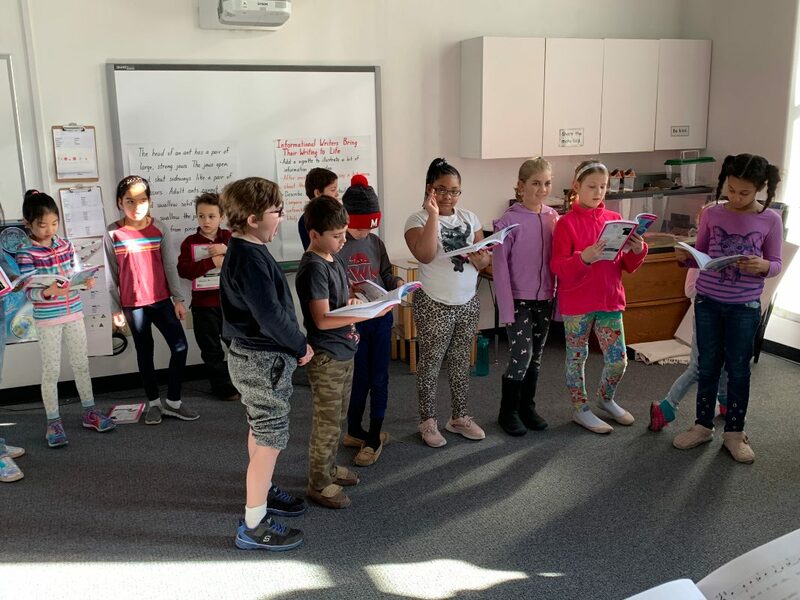 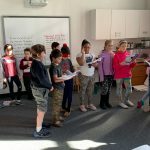 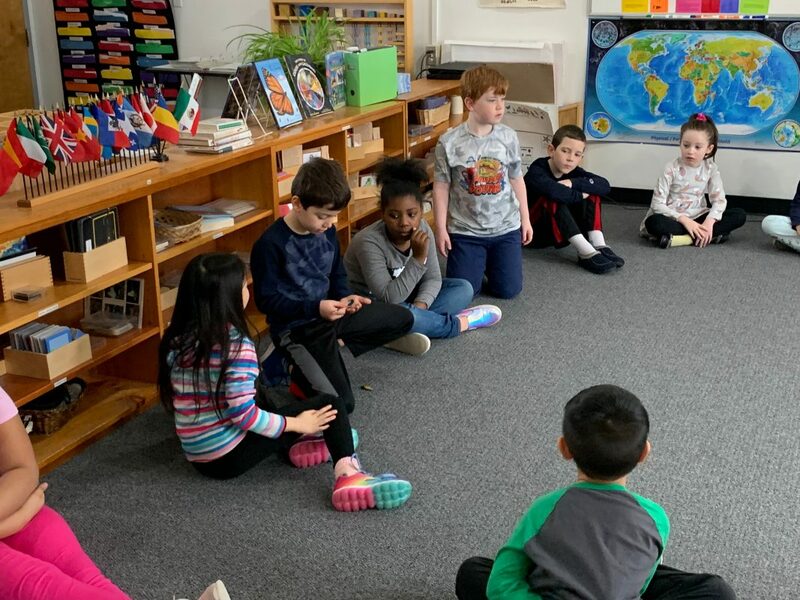 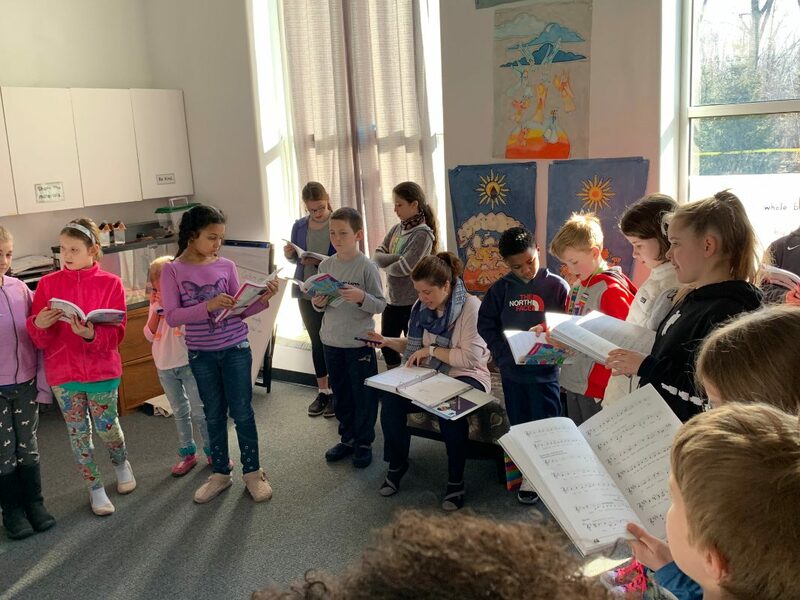 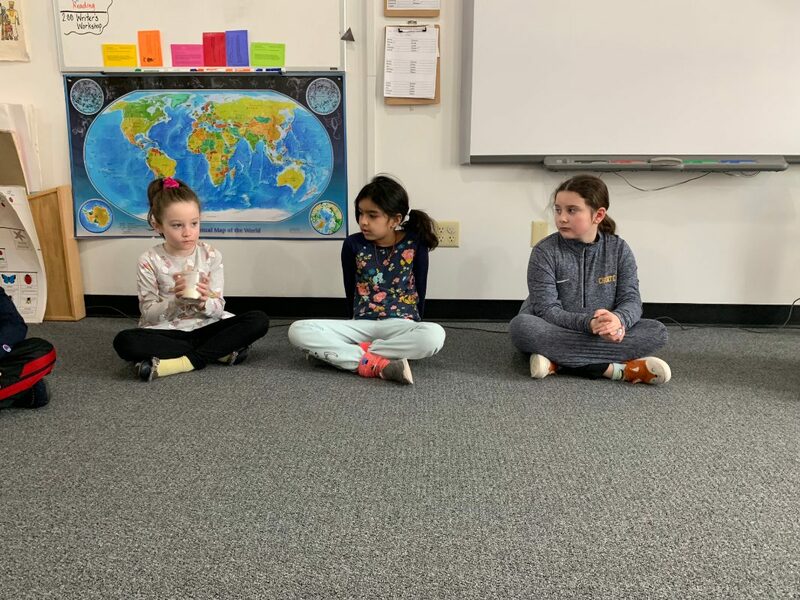 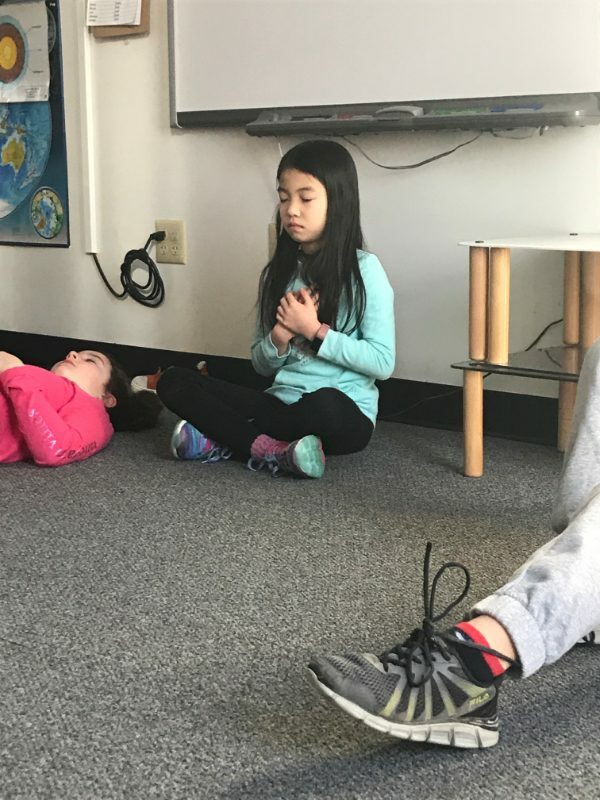 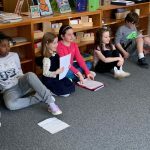 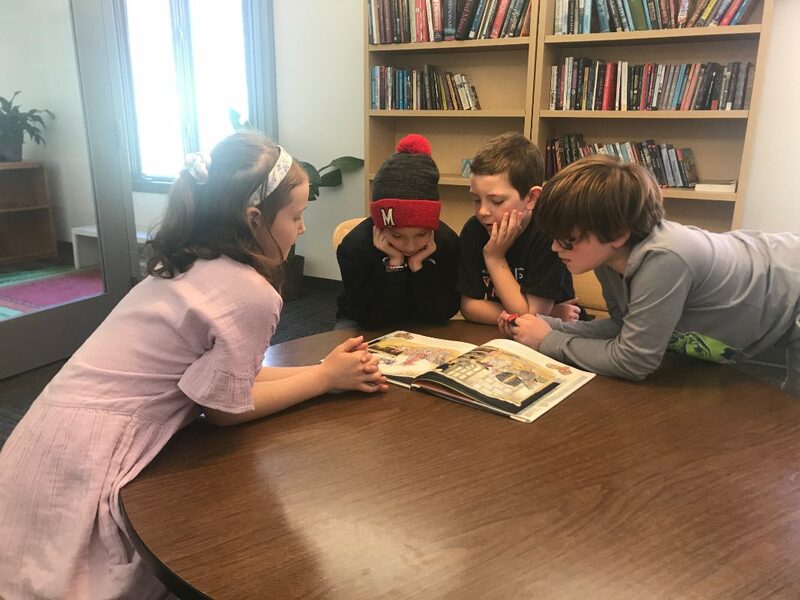 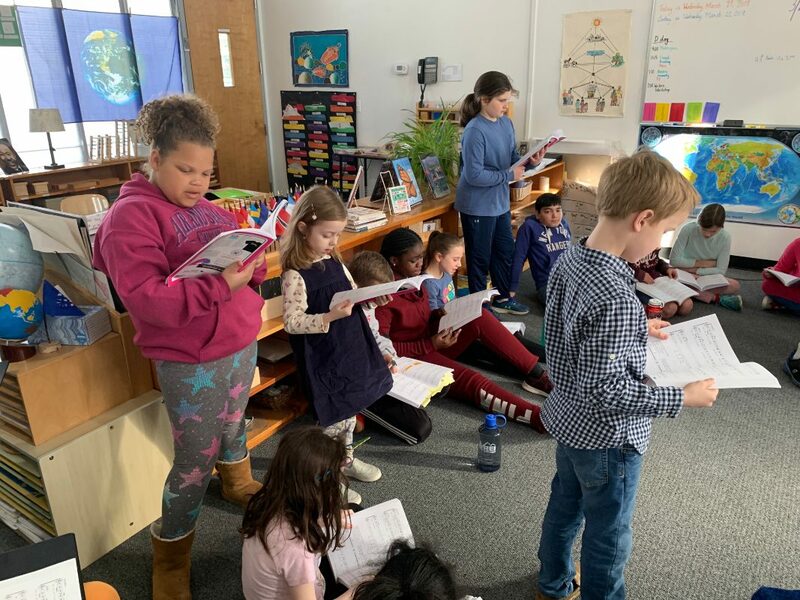 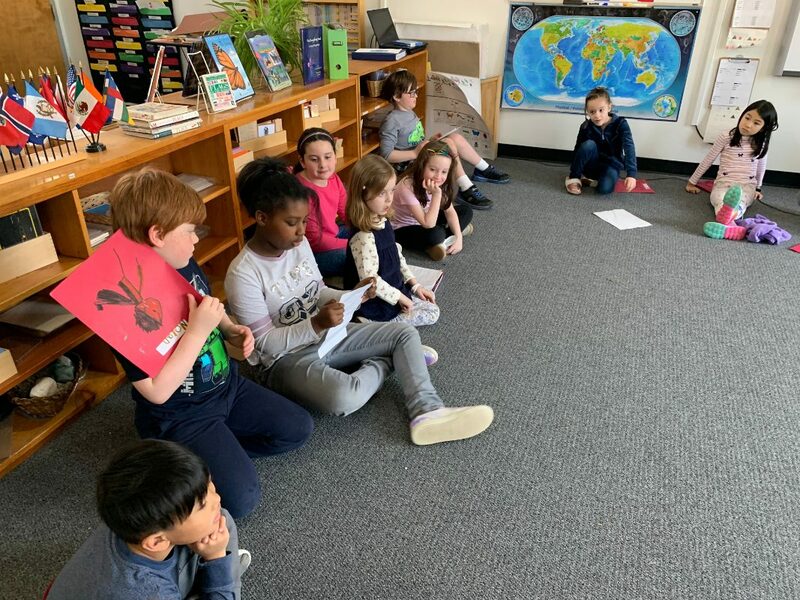 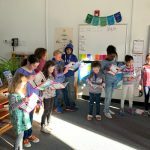 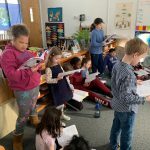 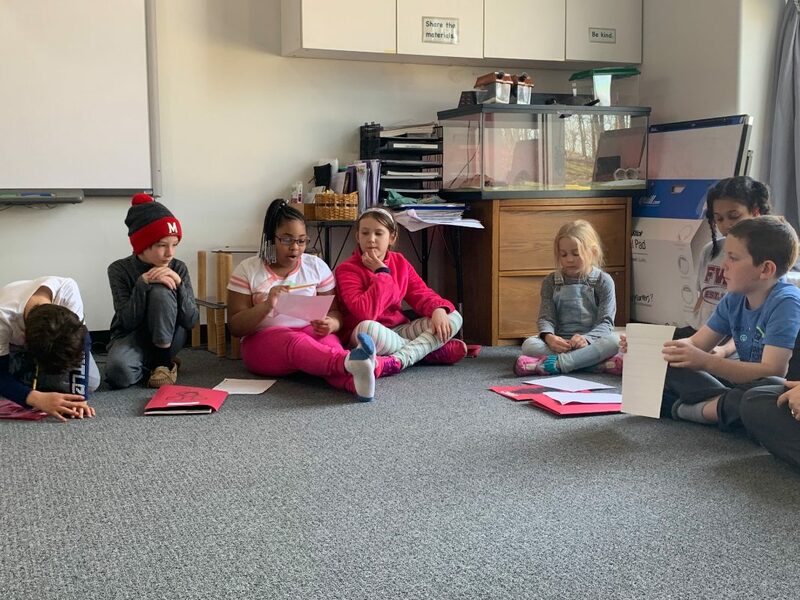 The children are immersing themselves in learning the songs for Seussical the Musical and their sweet voices can be heard singing during work cycle, in the hallway on the way to enrichment classes, during dismissal, and many times in between. 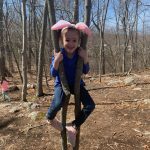 We will be sending out an email this coming week with a list of props needed and what your children will need from home for their costumes. 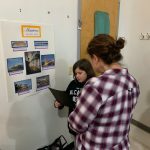 We will also be looking for parent volunteers to help with the organization of props and costumes. 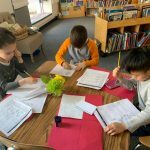 We wrapped up our Writer’s Workshop unit on nonfiction and began our new unit this week. 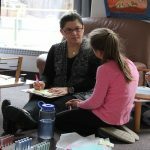 First year students will be writing fiction, second years – poetry, and third years will be writing fairy tales. 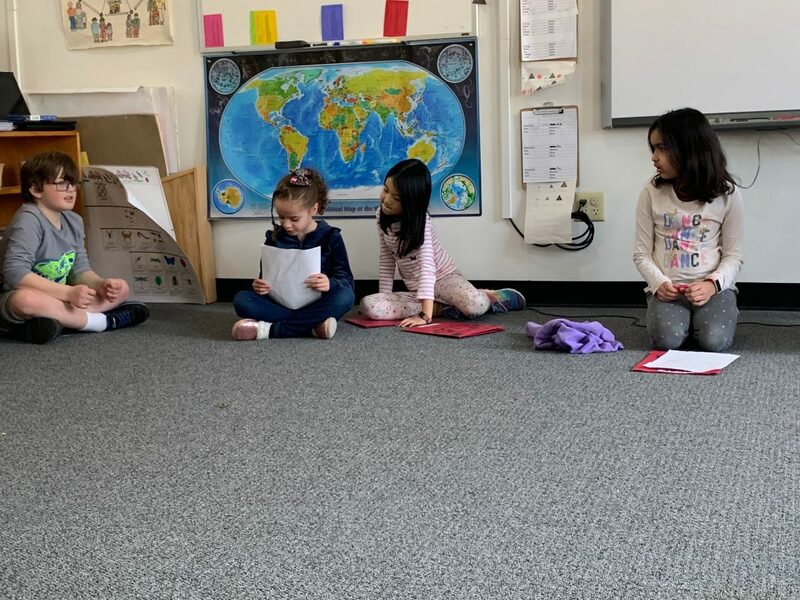 We began with everyone writing a fiction story and having the opportunity to share the story with the class. 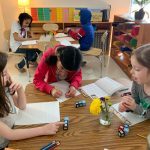 We are all very excited about our new units. 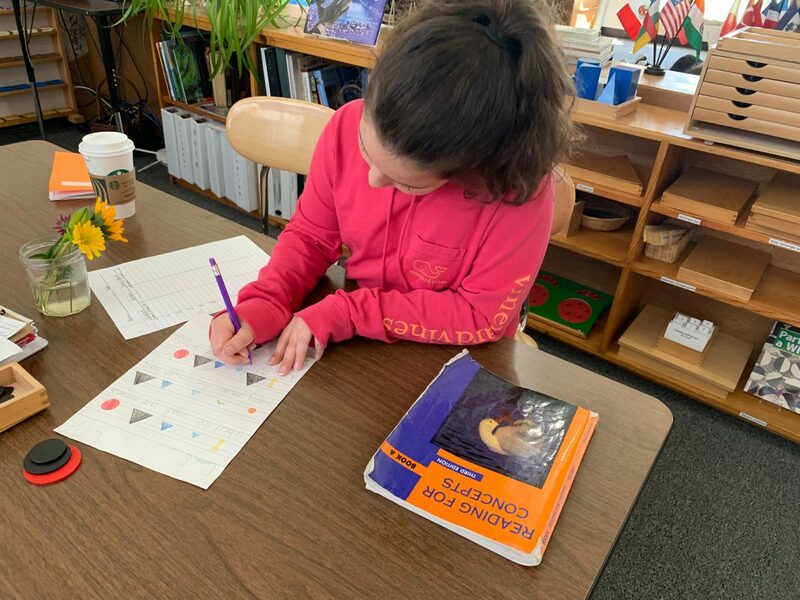 Each grade level also had lessons this week in biology and geometry. 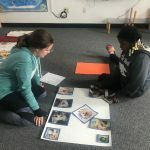 In biology, first and second year students learned about reptiles. 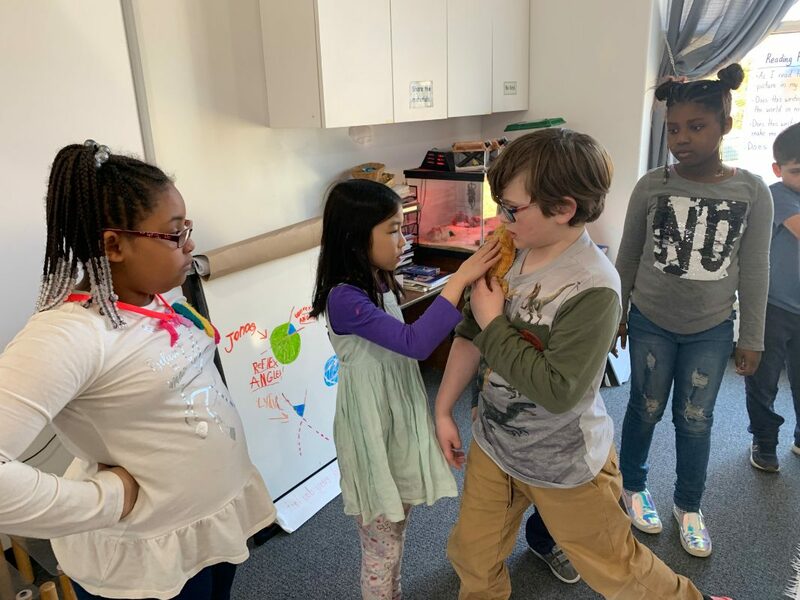 Firsts focused on the parts of reptiles and seconds on the body functions. 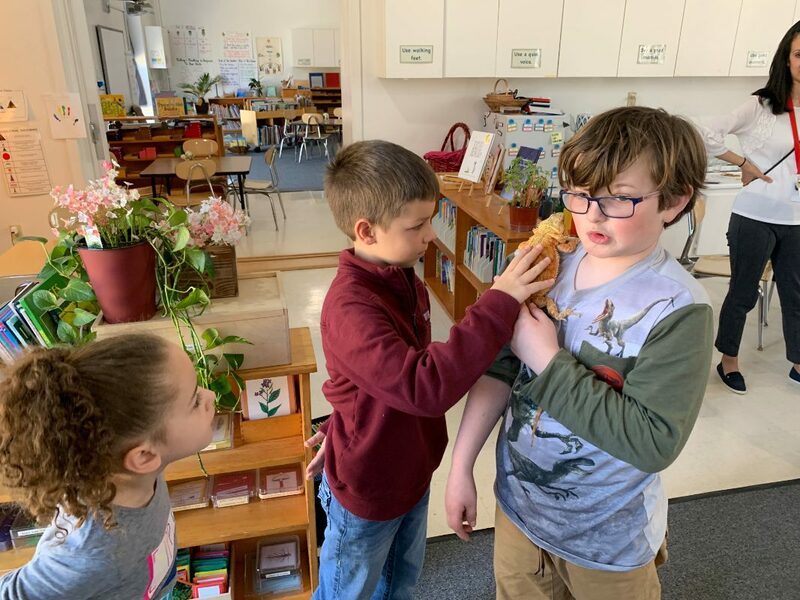 The first year students enjoyed holding our class pet, Rocky, and observing and discussing her body parts. 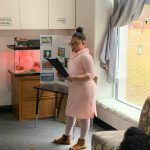 Third year students learned about ferns. 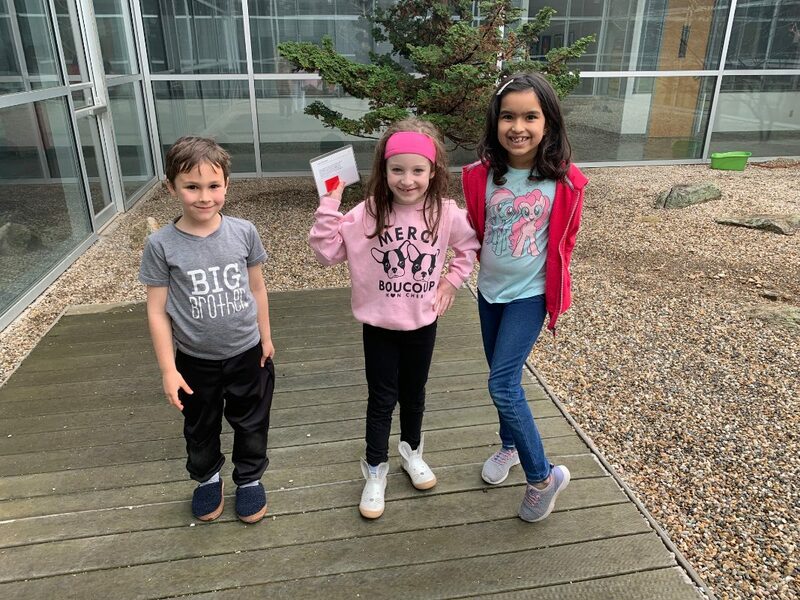 We took a walk into the woods to find and dig up a fern to look at with a magnifying glass. 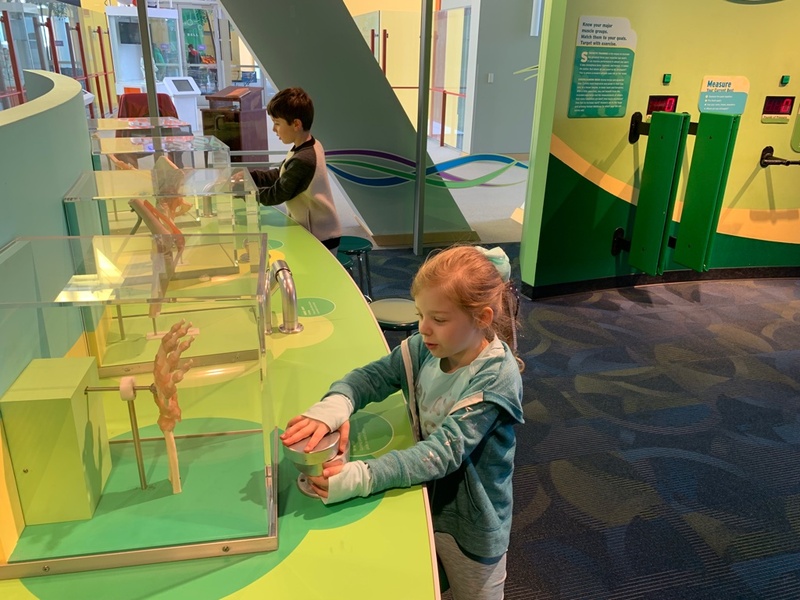 We were pleased to be able to see all of the different parts, even the tiny sori on the underside of the leaves, which make the spores. 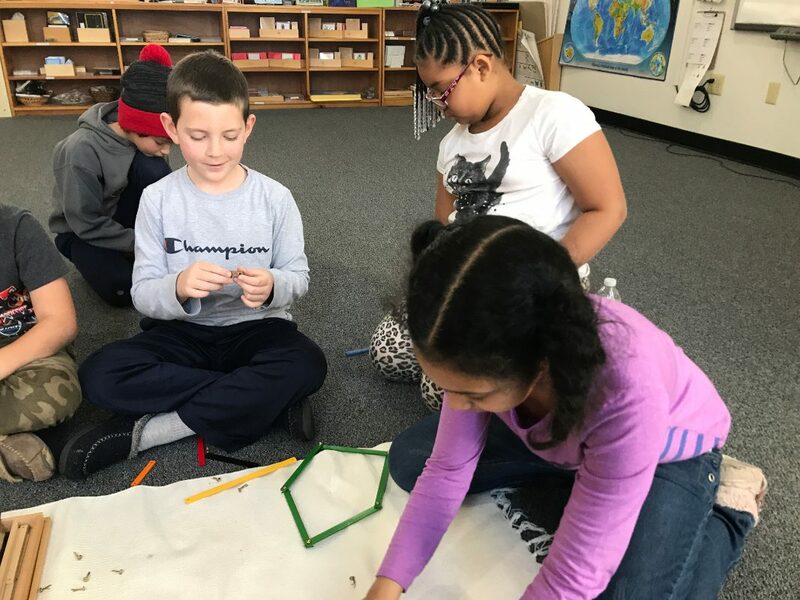 In geometry, the firsts learned about simple closed curved regions and polygons. 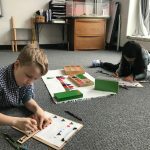 They enjoyed using the box of sticks to make their own polygons. 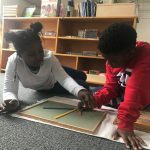 The seconds wrapped up their lessons about two lines on the same plane crossed by a third line by learning about corresponding angles. 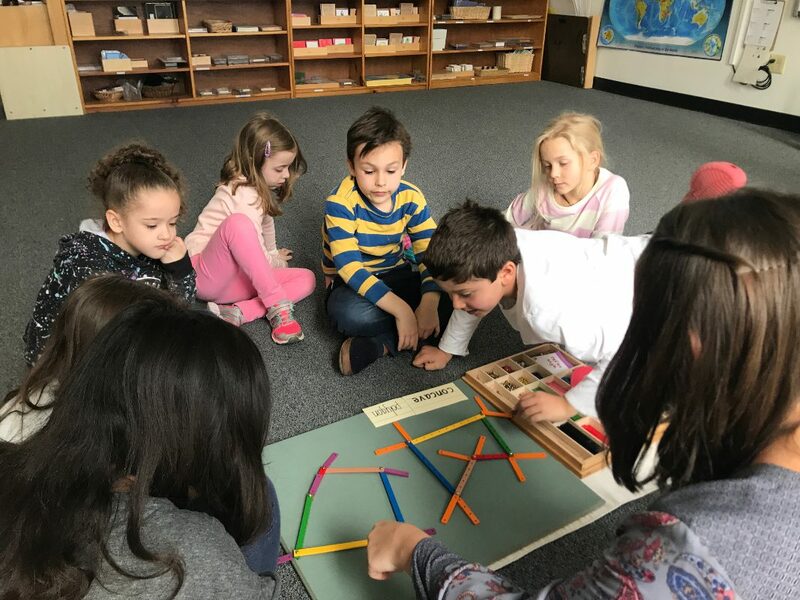 The third year students used the box of sticks to learn about the differences between regular and irregular polygons. 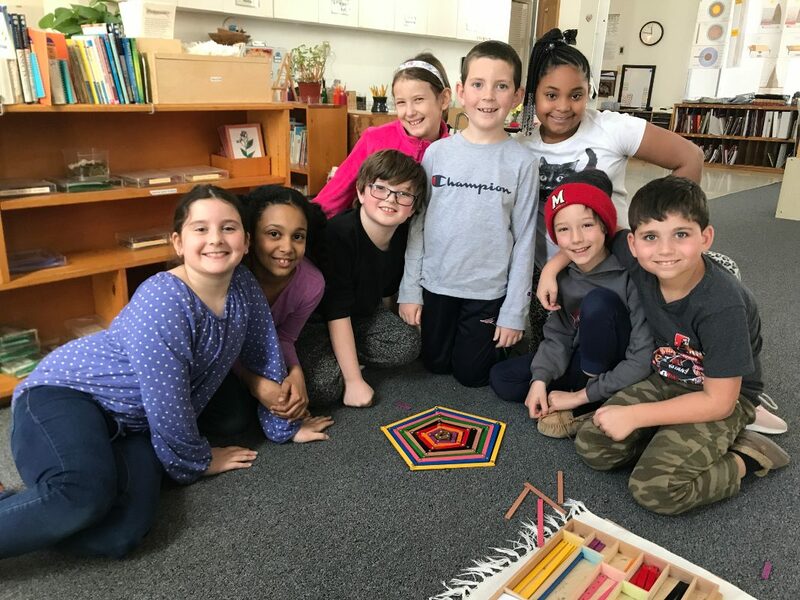 They enjoyed collaborating with each other to make a polygon design after their lesson was over. 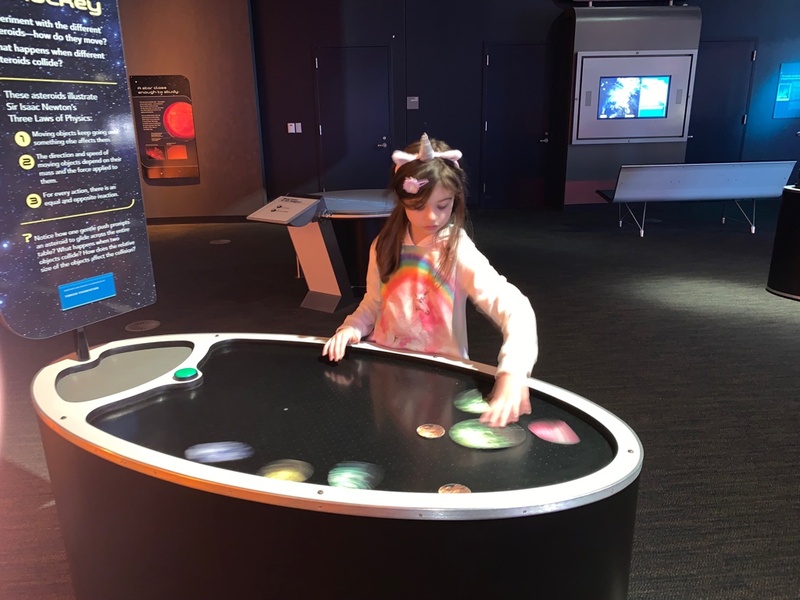 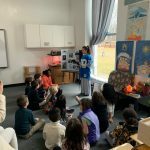 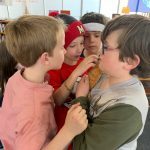 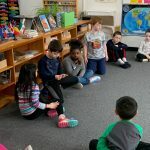 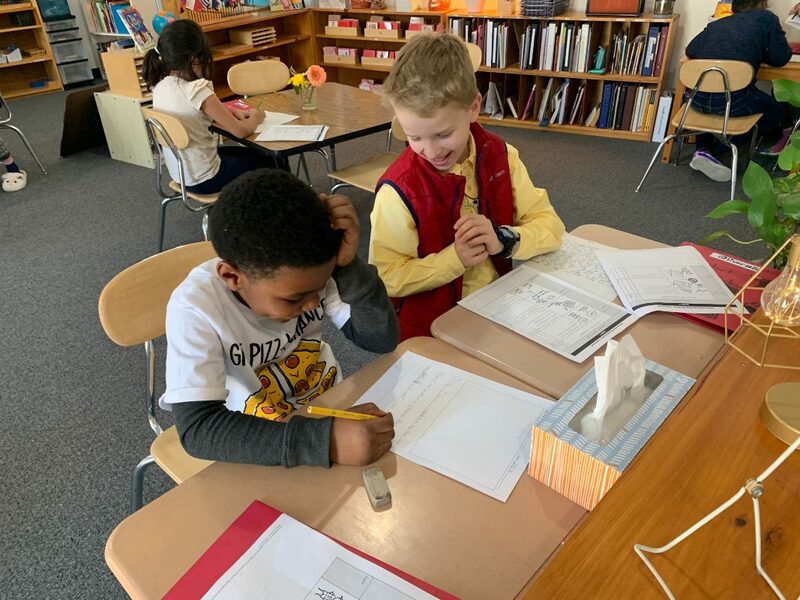 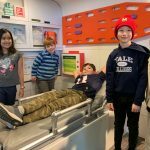 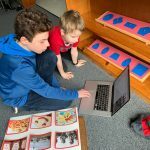 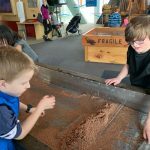 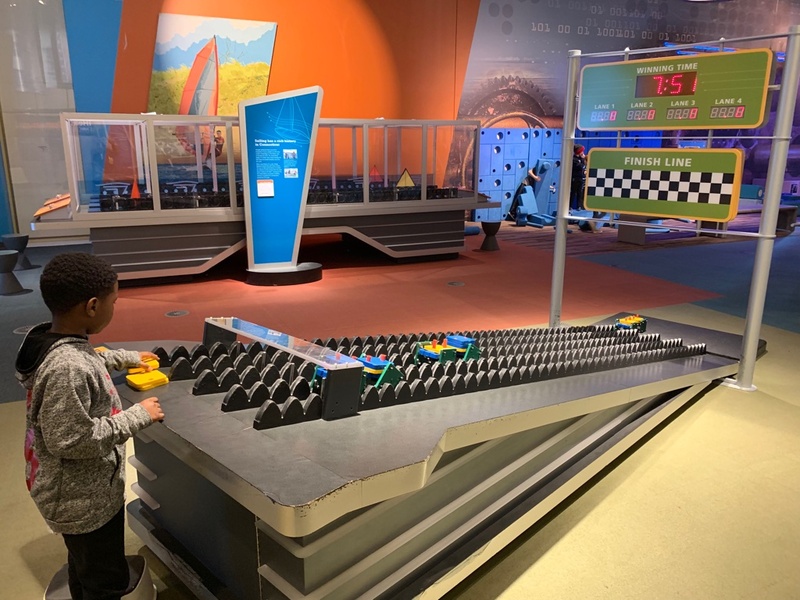 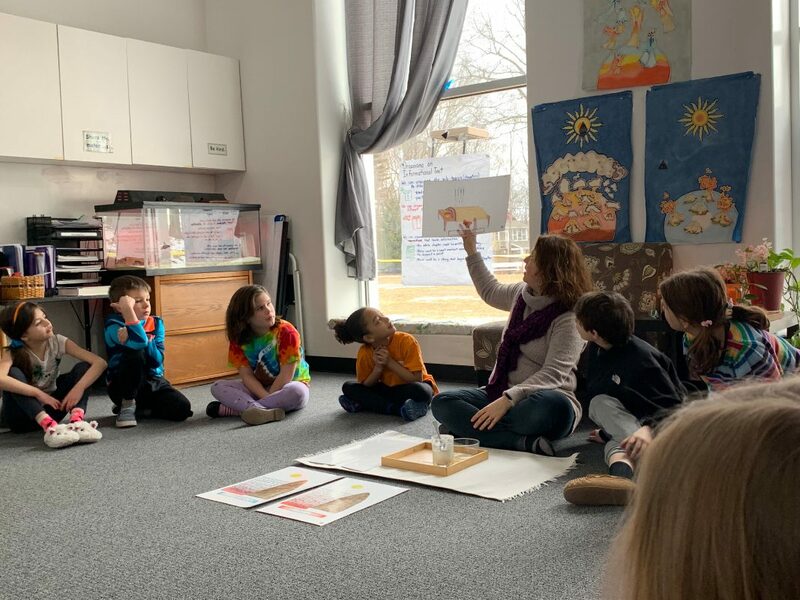 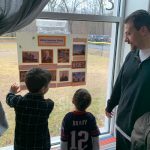 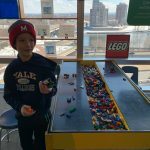 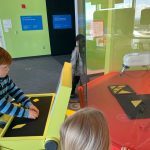 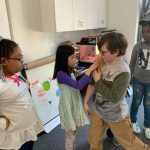 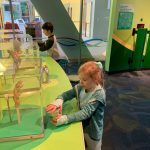 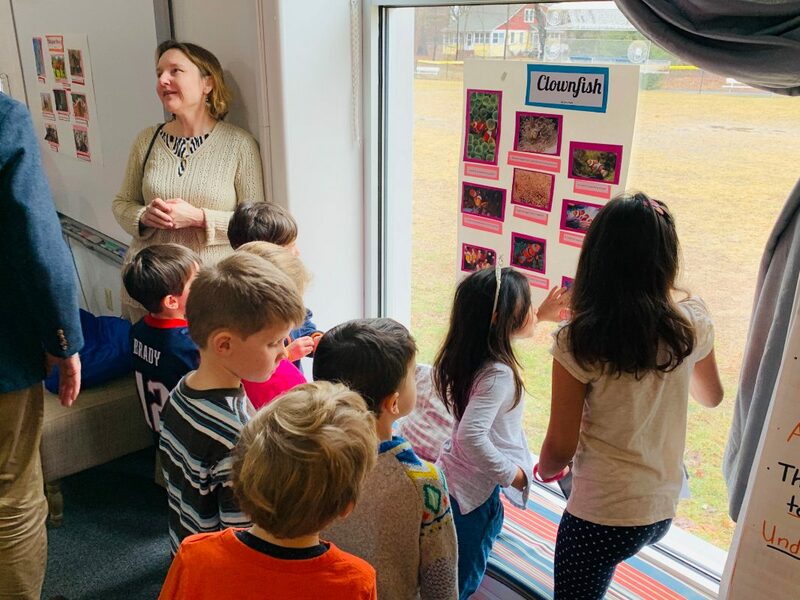 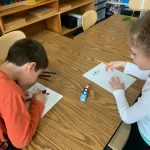 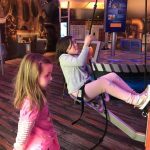 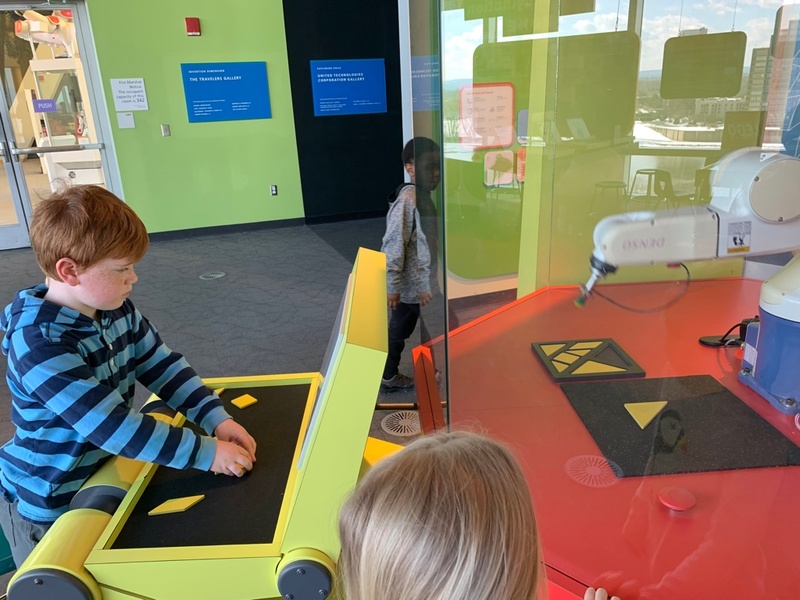 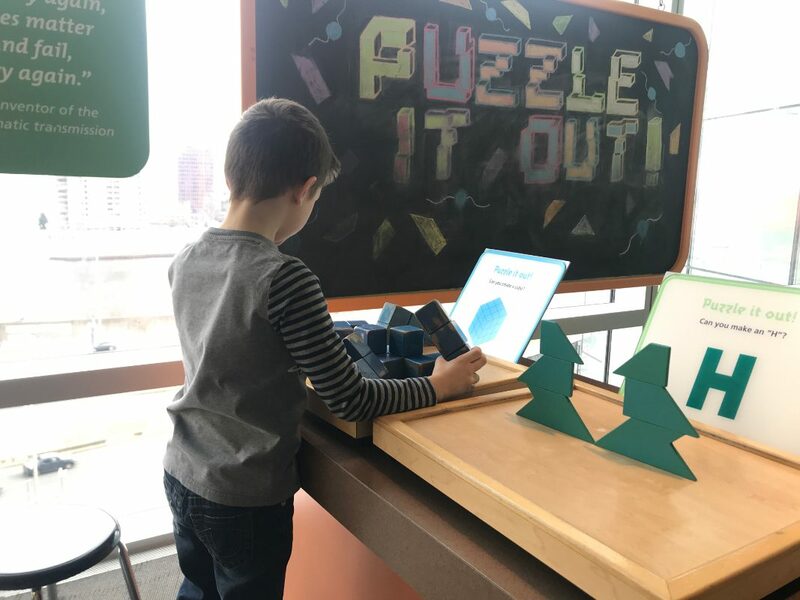 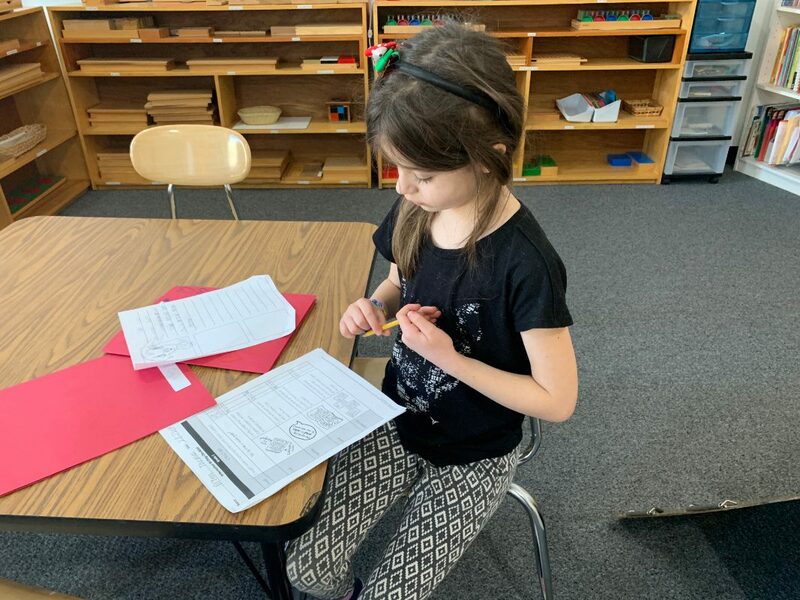 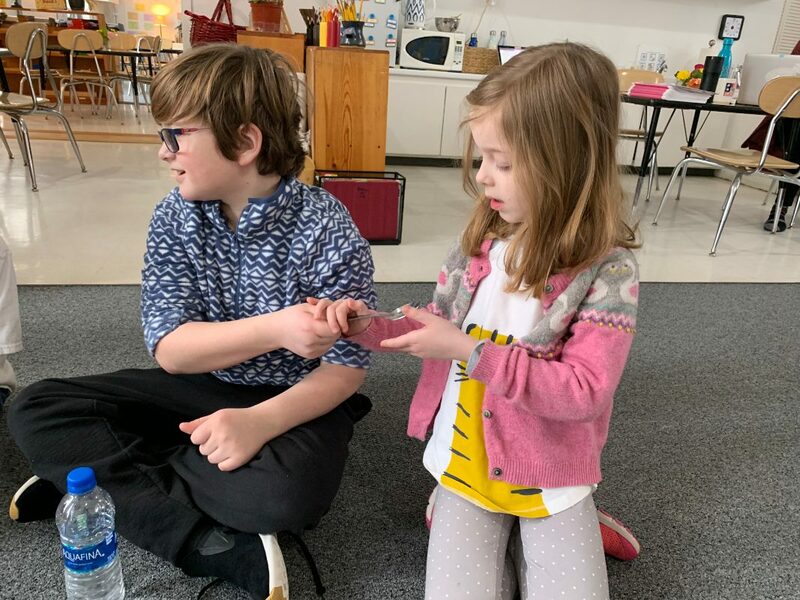 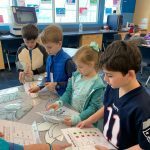 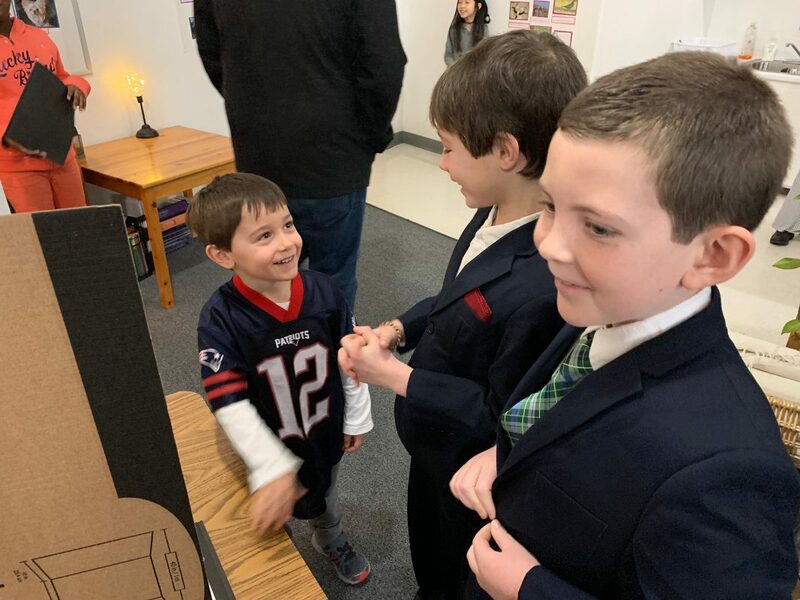 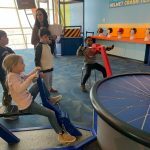 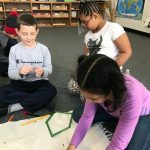 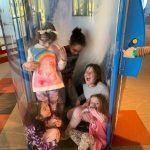 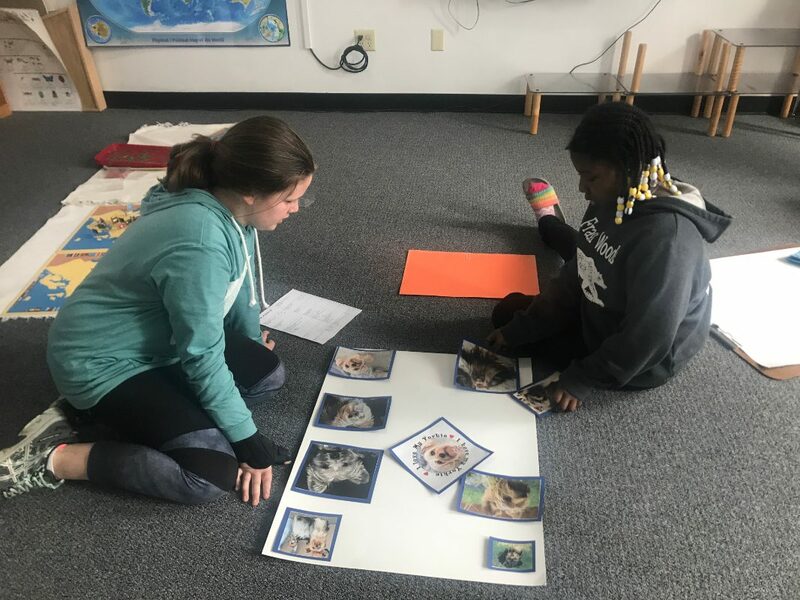 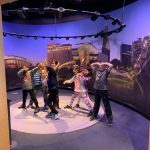 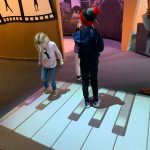 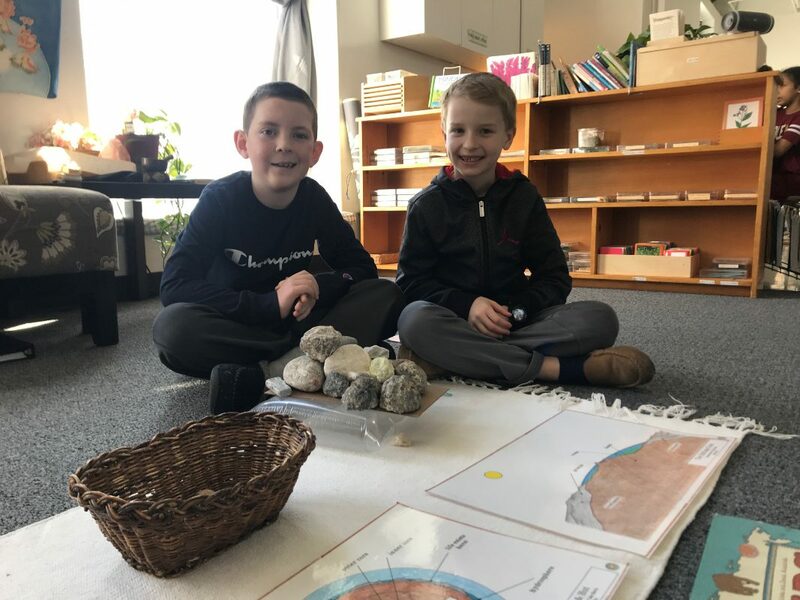 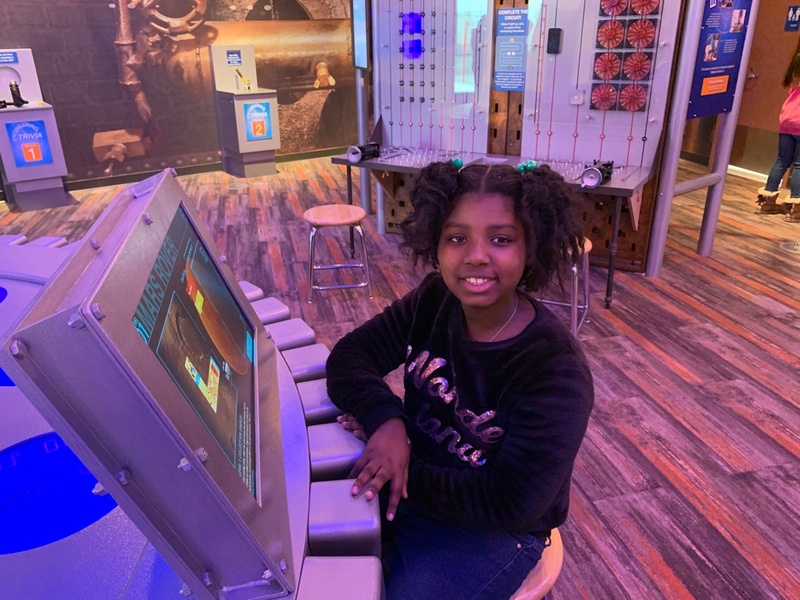 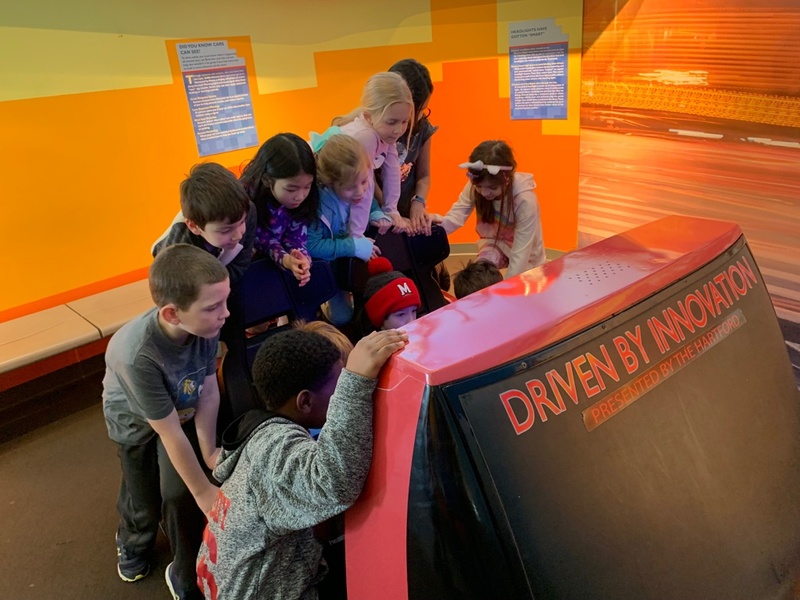 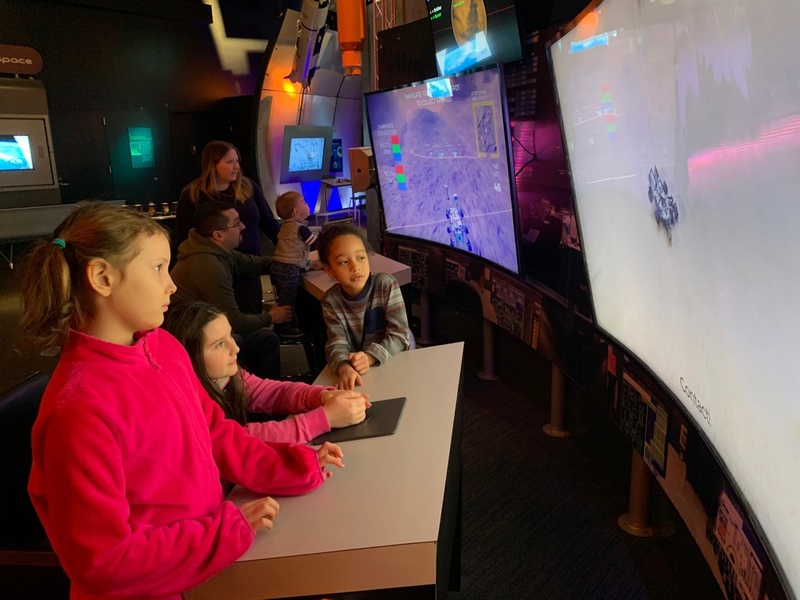 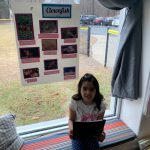 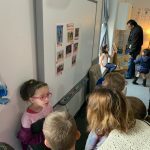 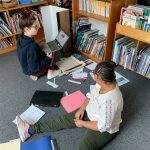 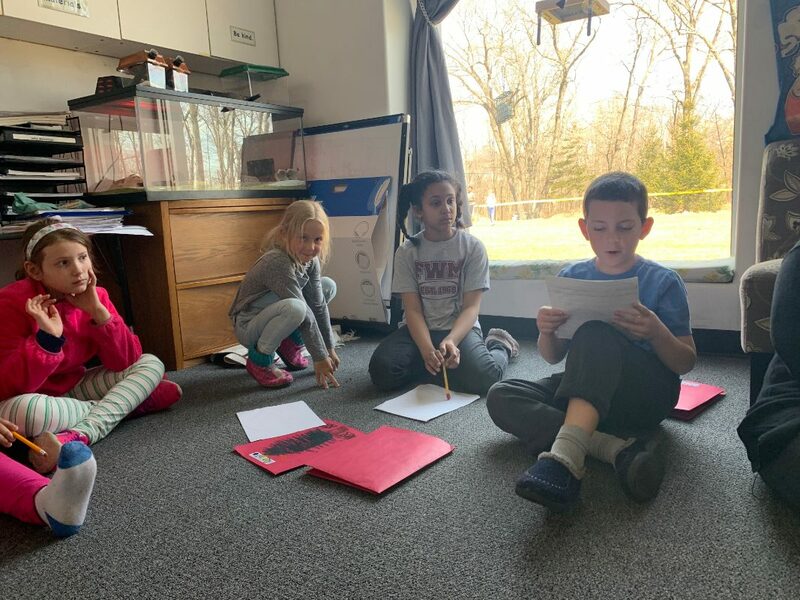 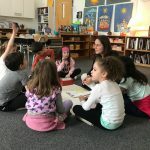 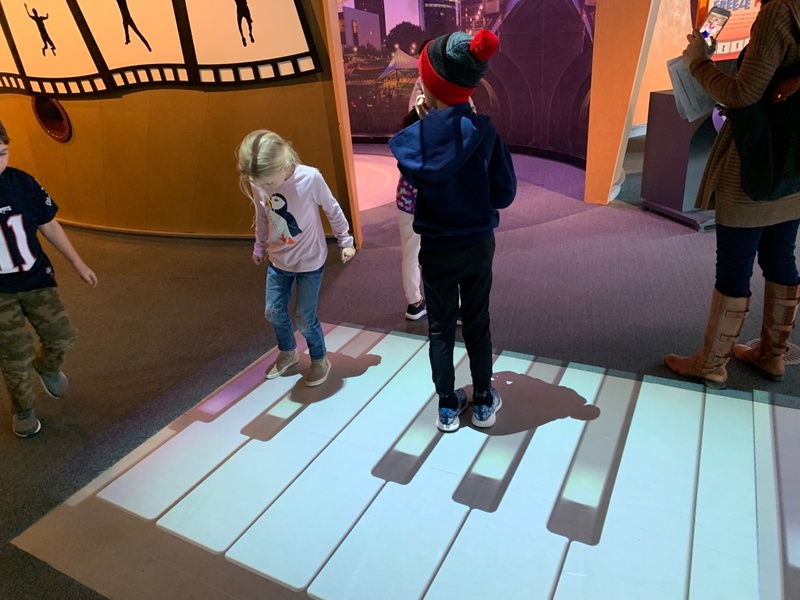 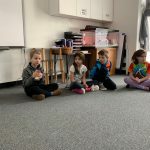 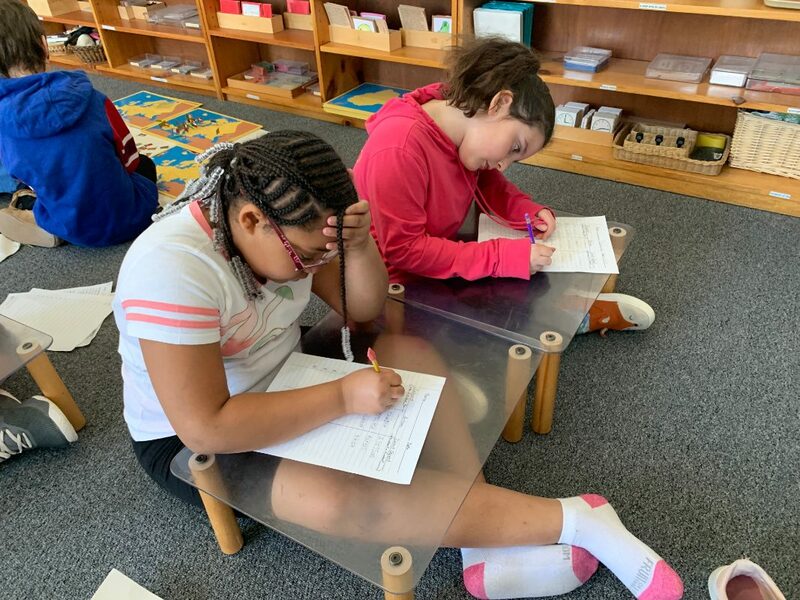 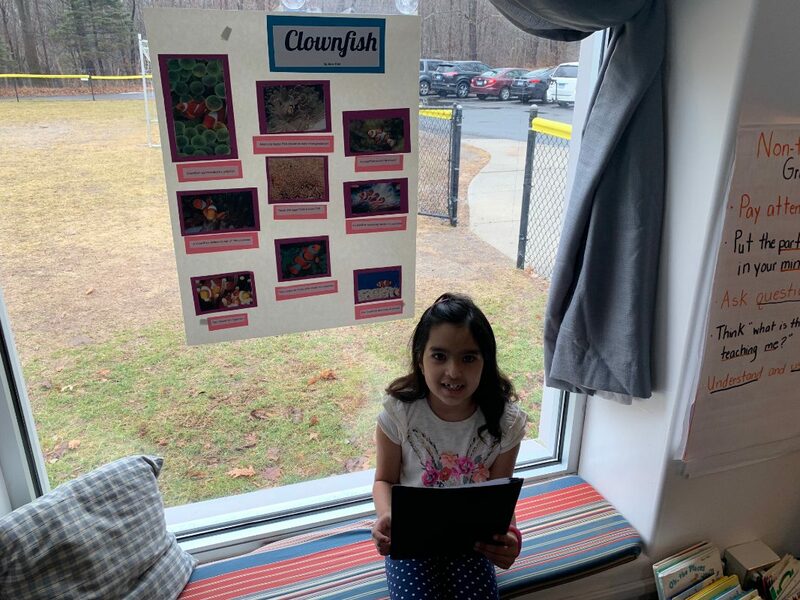 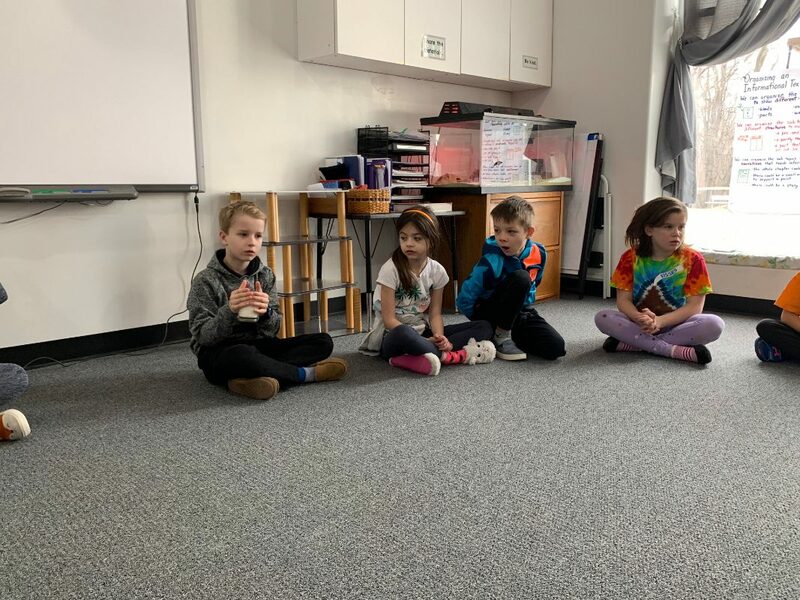 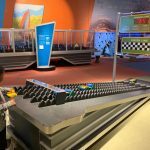 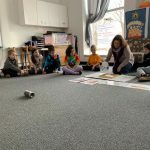 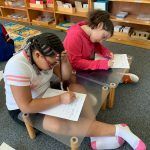 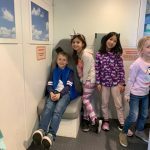 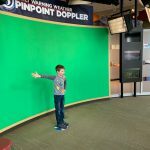 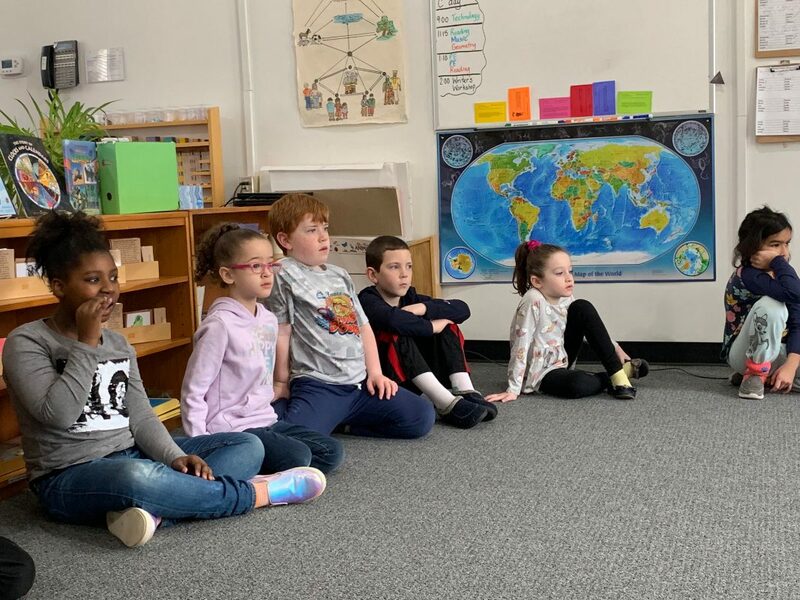 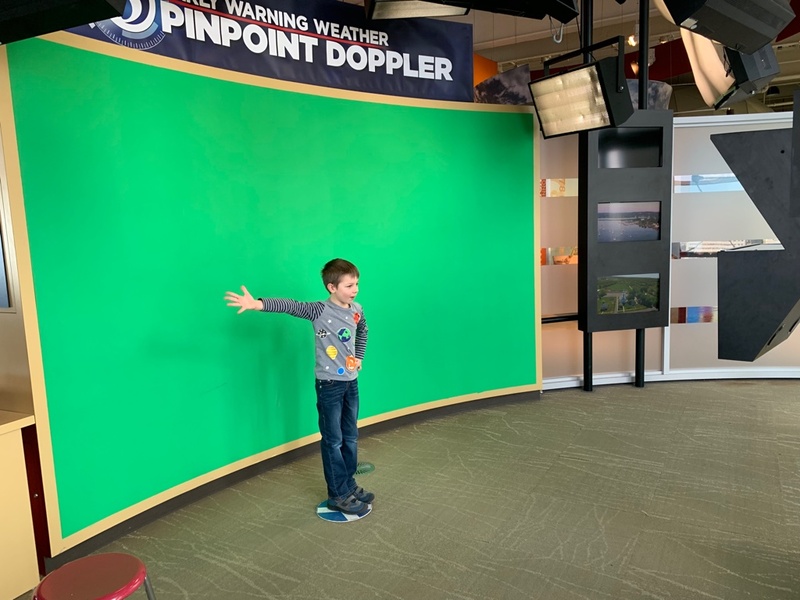 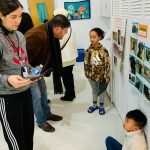 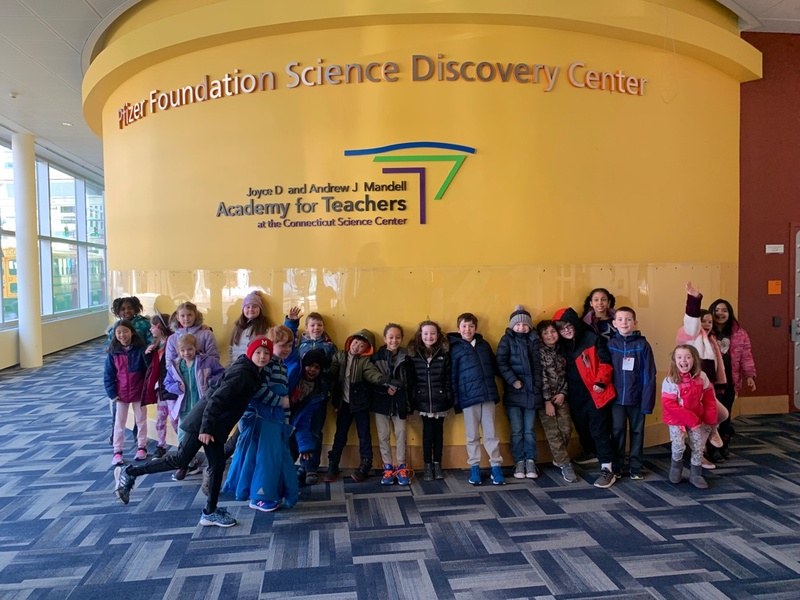 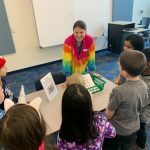 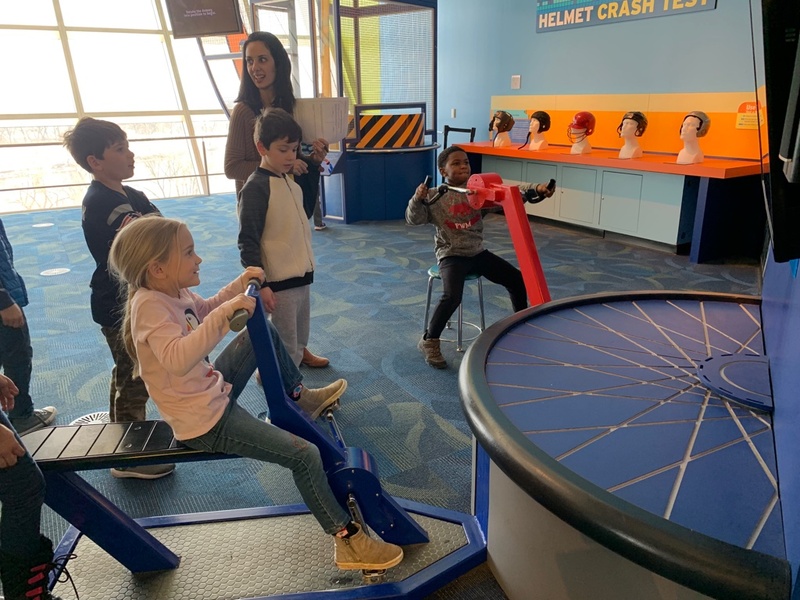 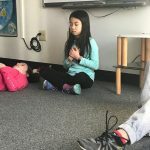 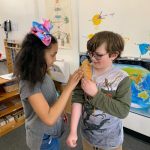 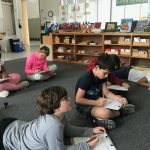 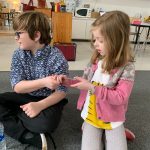 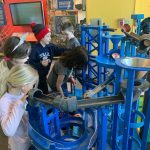 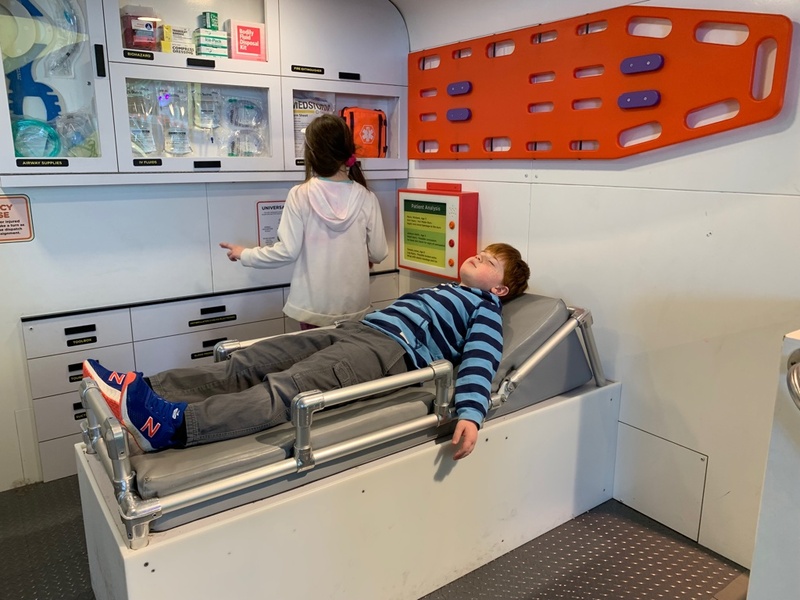 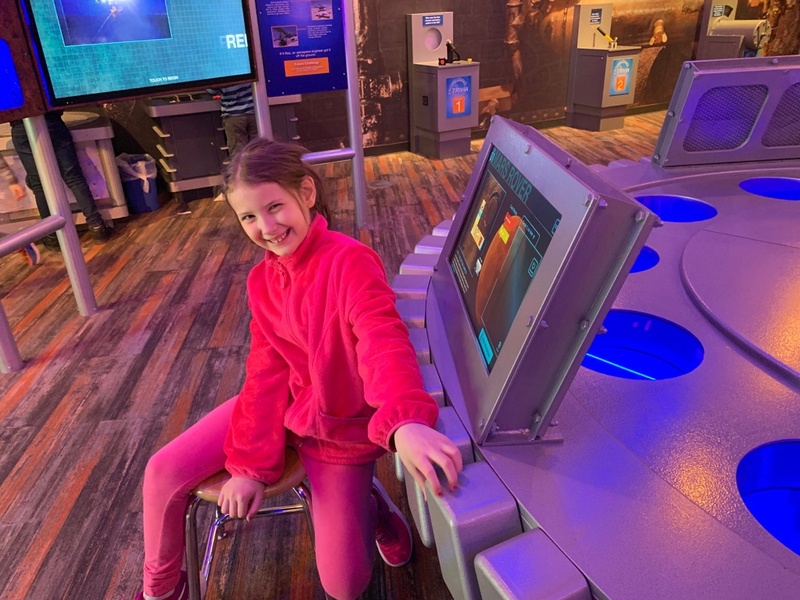 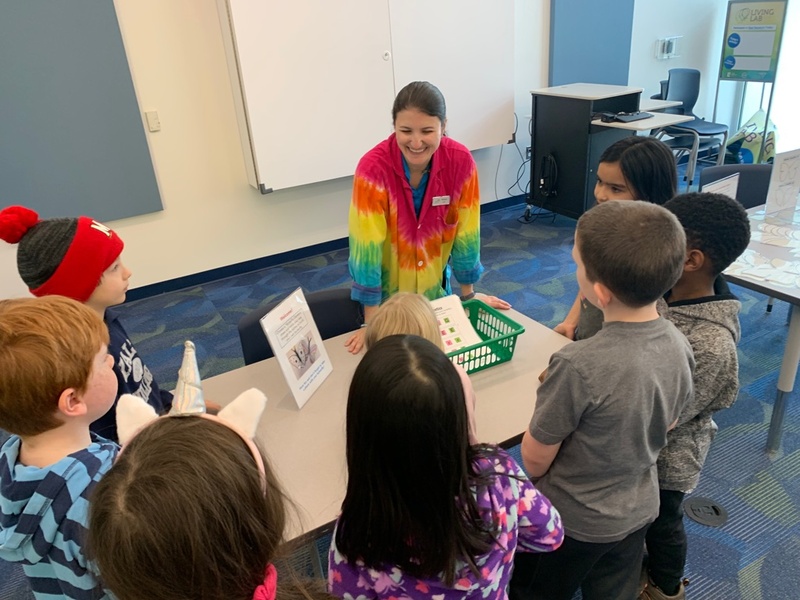 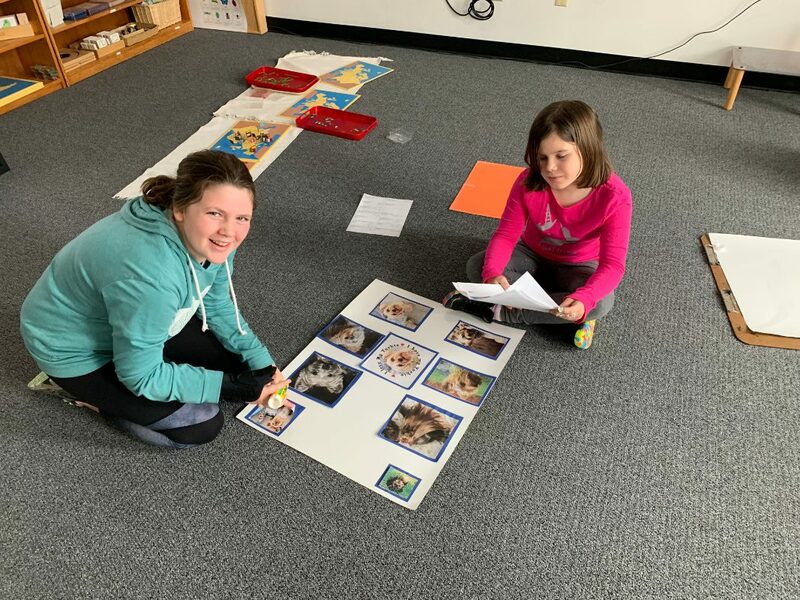 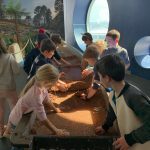 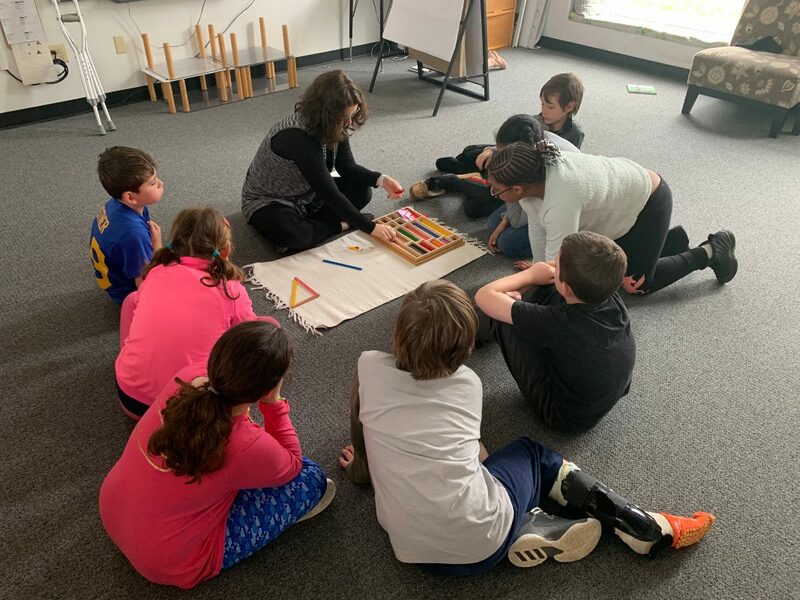 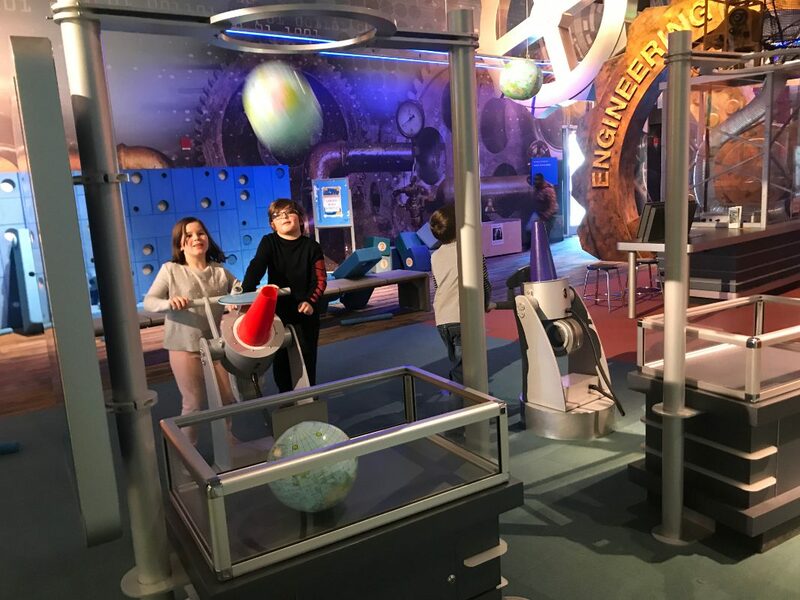 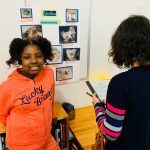 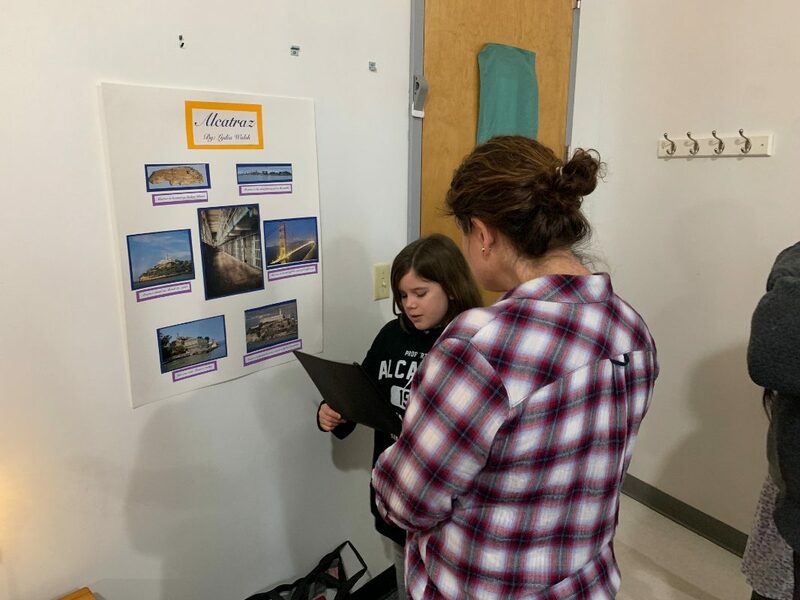 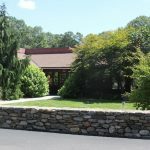 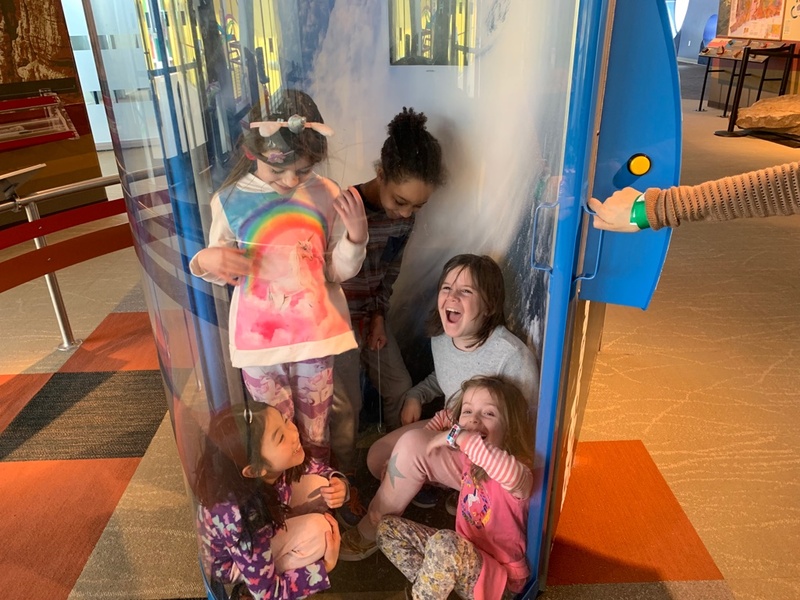 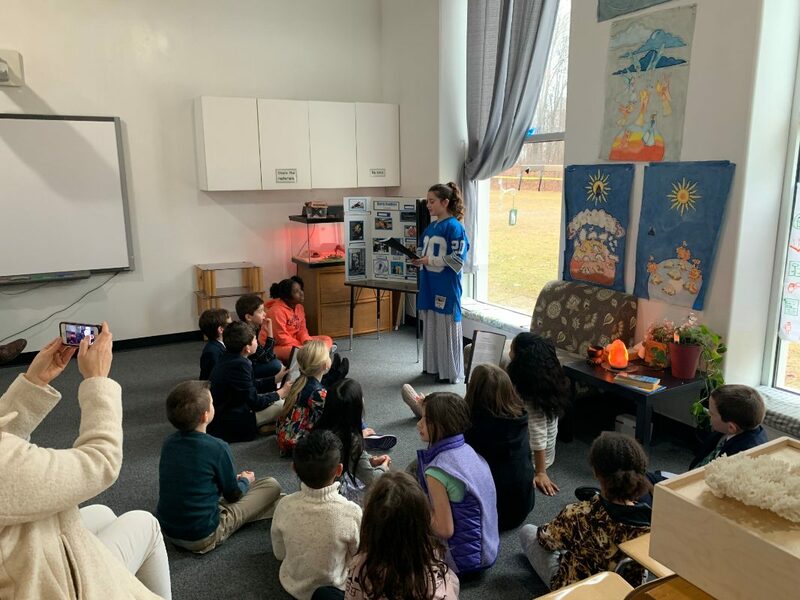 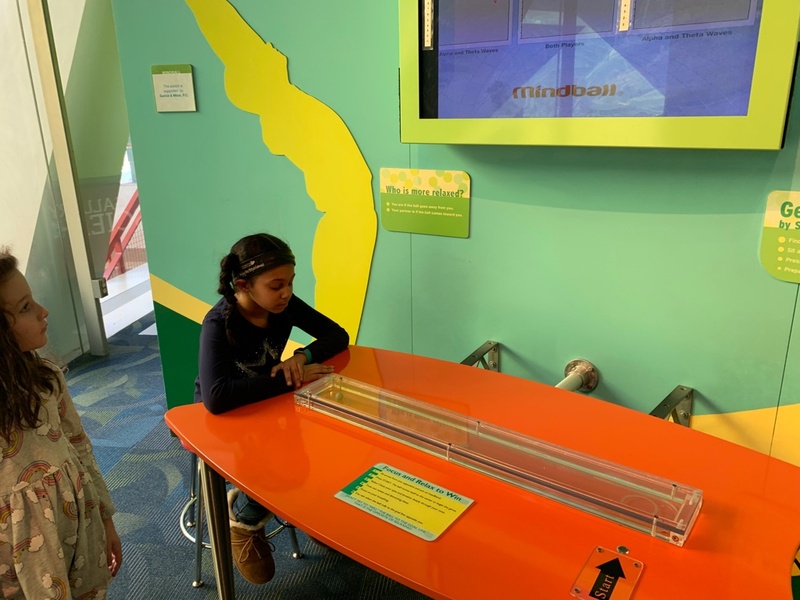 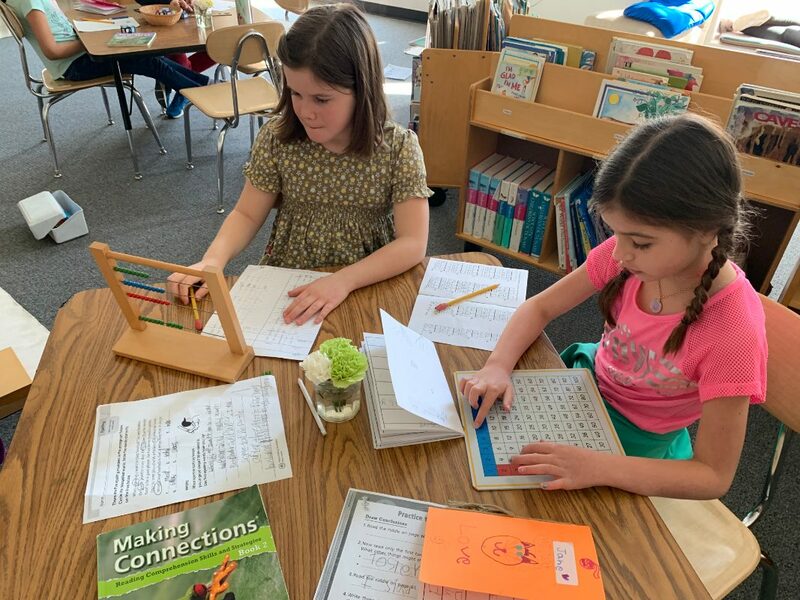 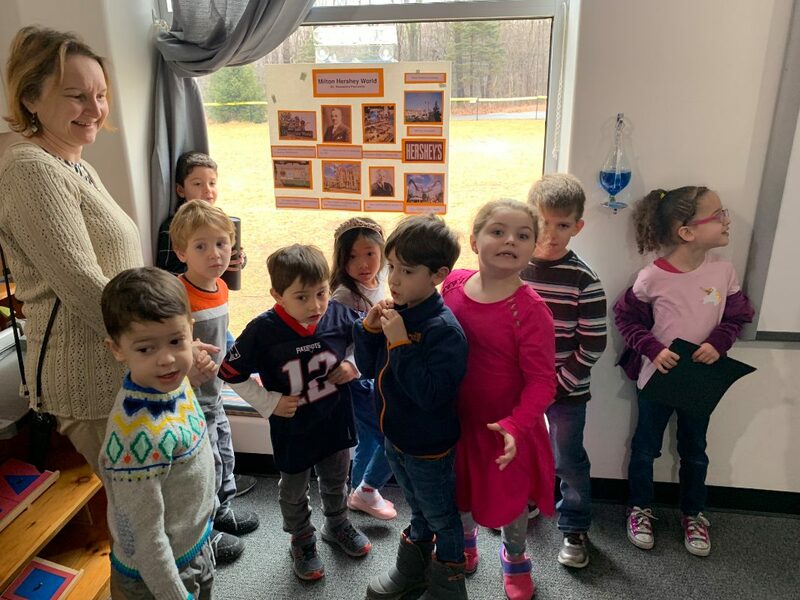 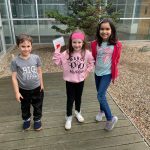 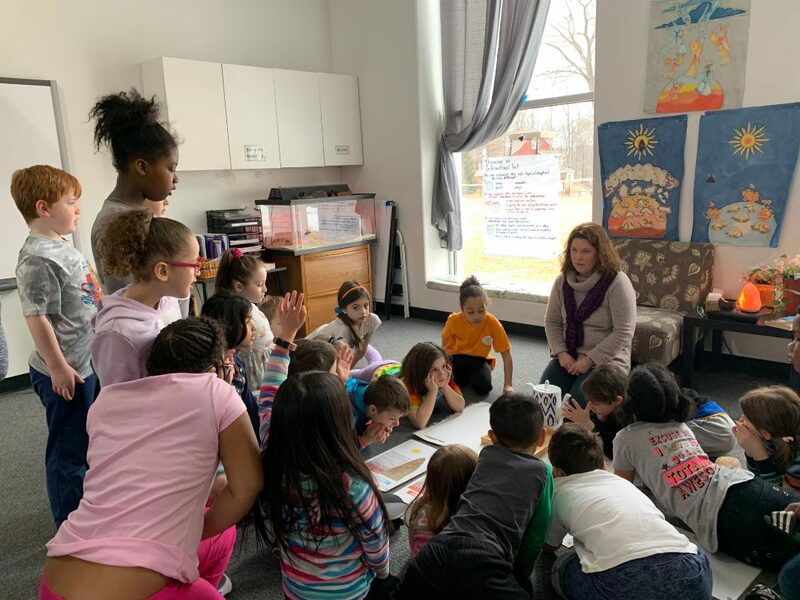 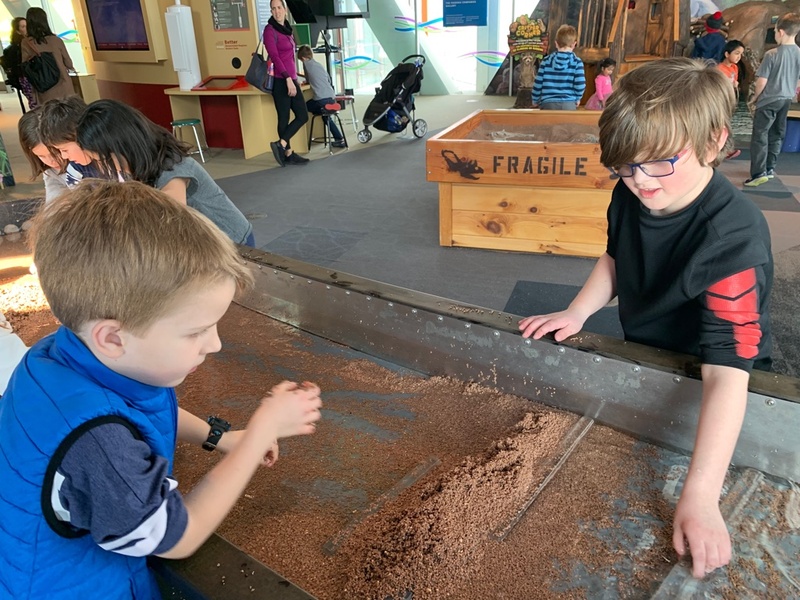 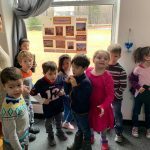 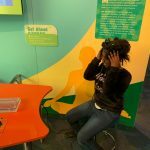 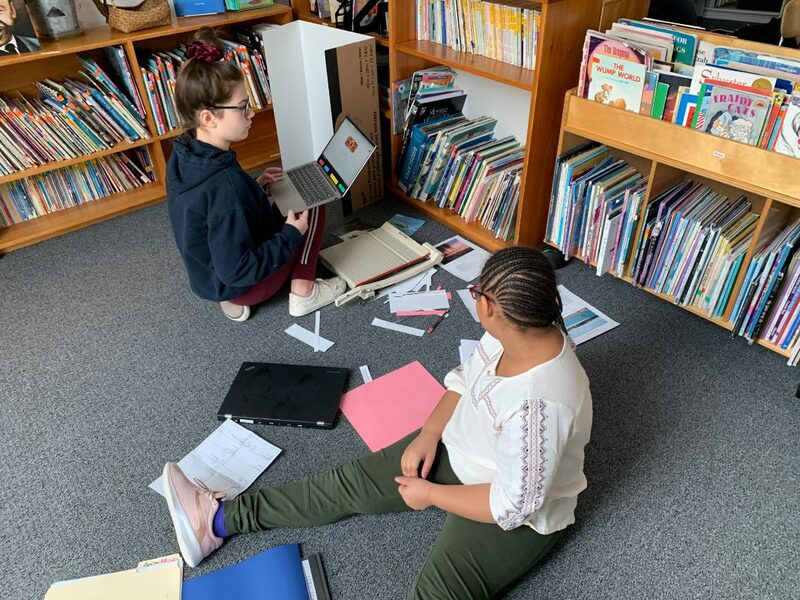 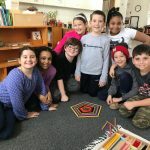 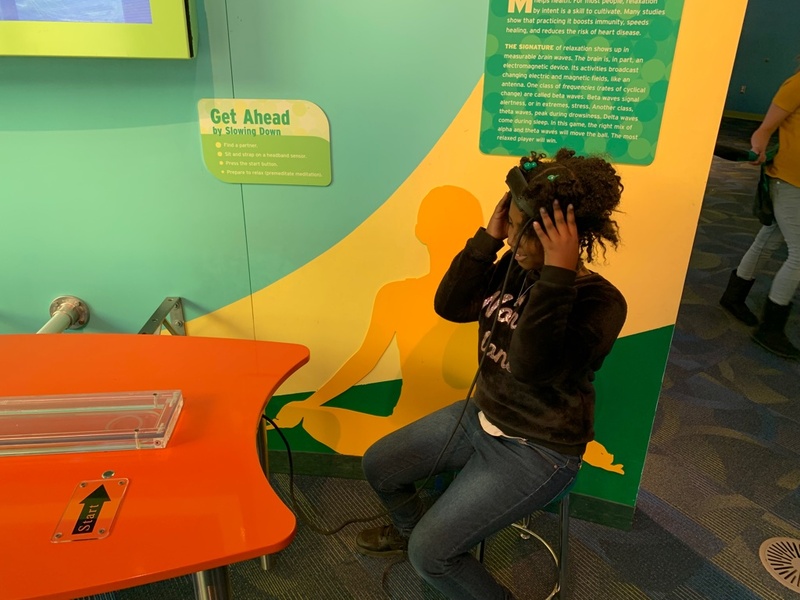 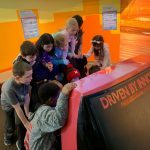 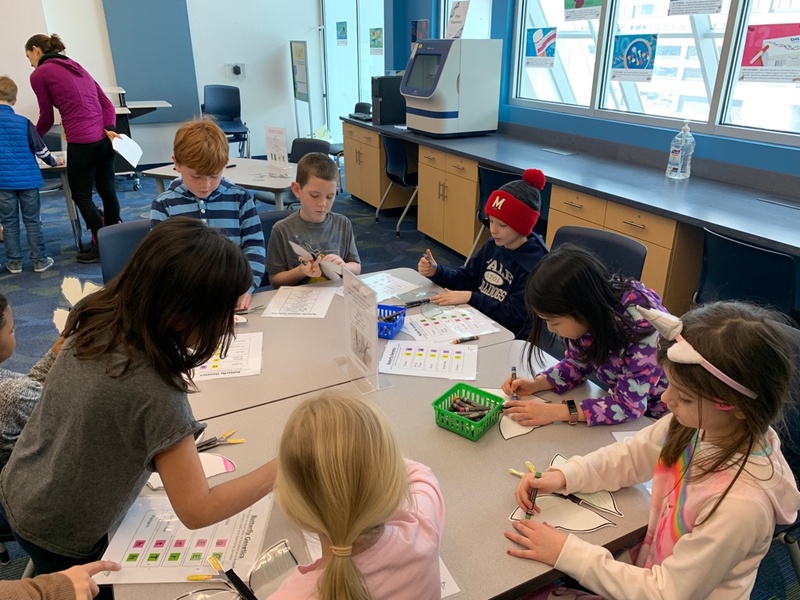 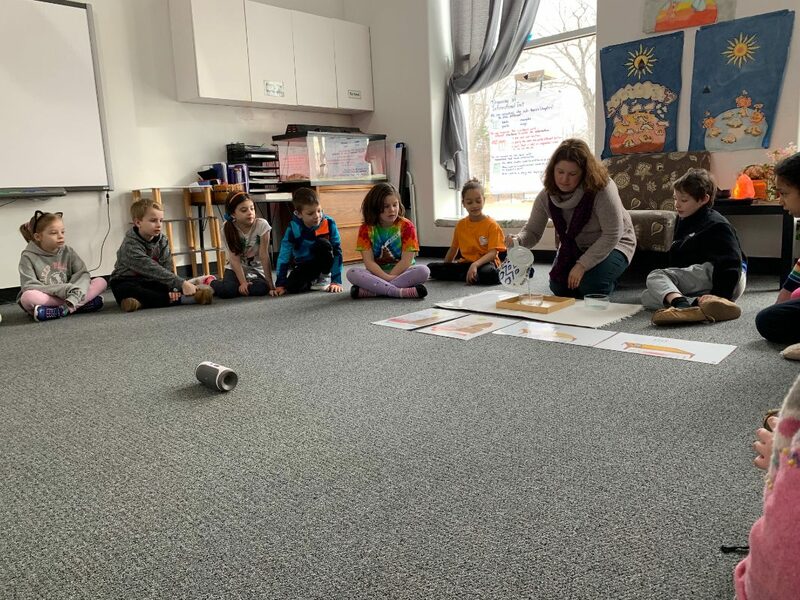 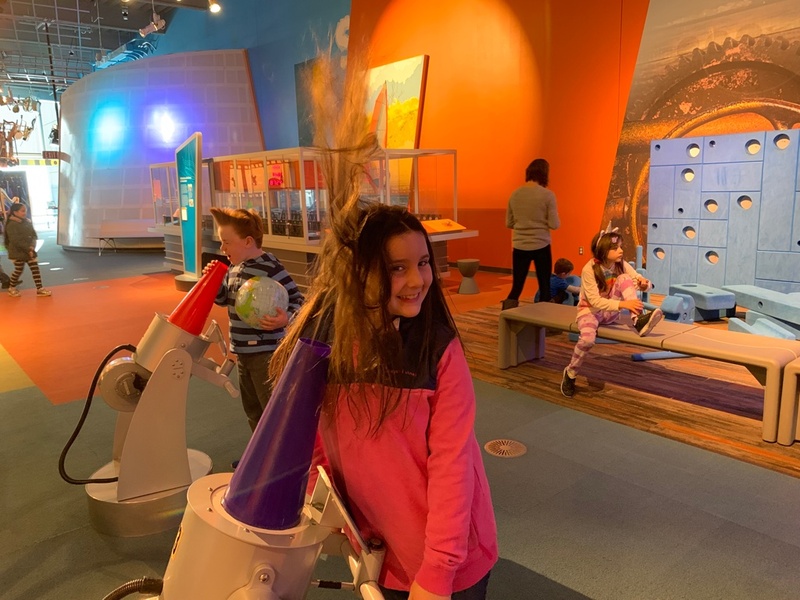 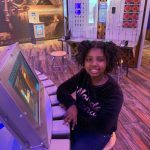 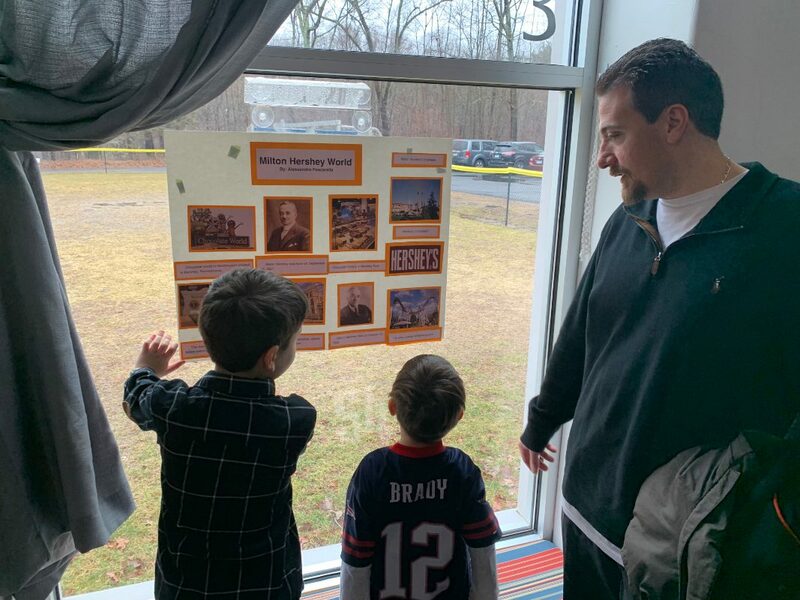 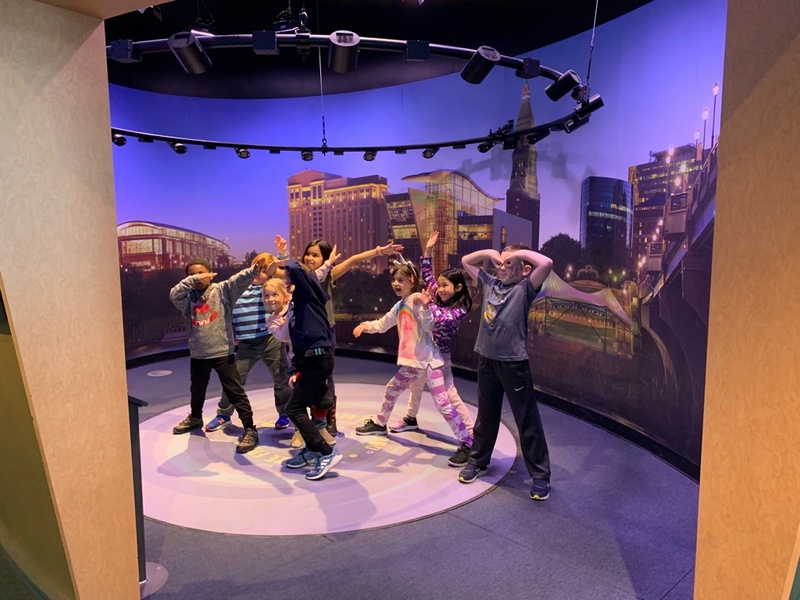 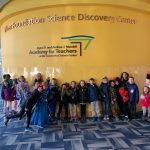 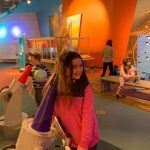 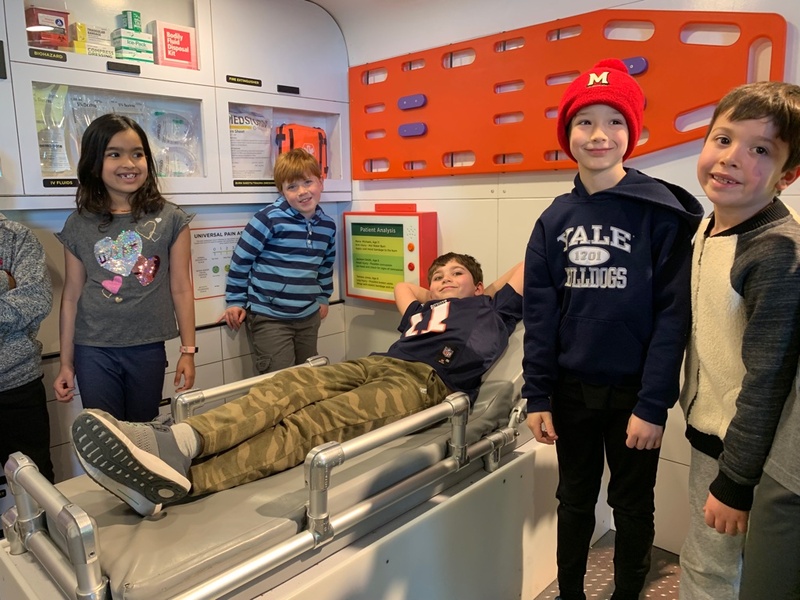 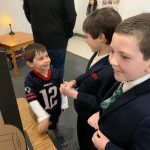 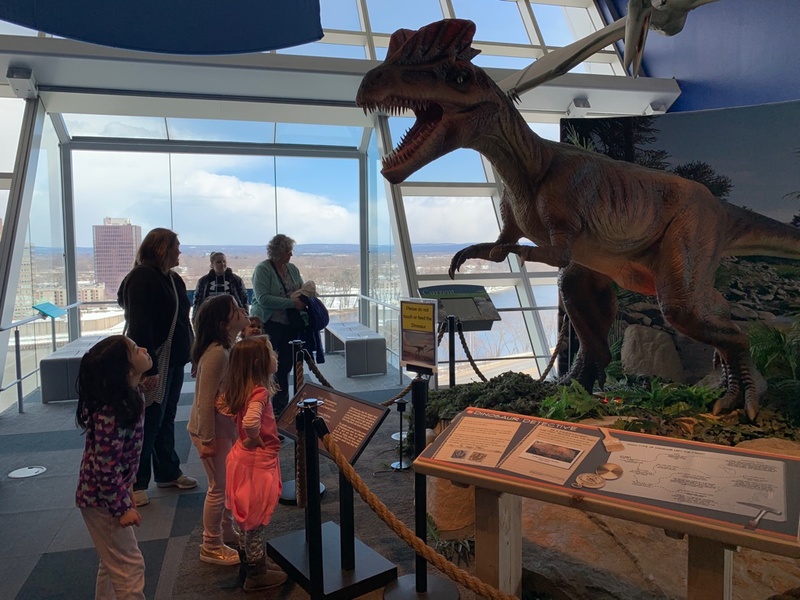 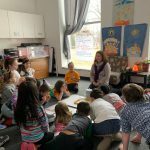 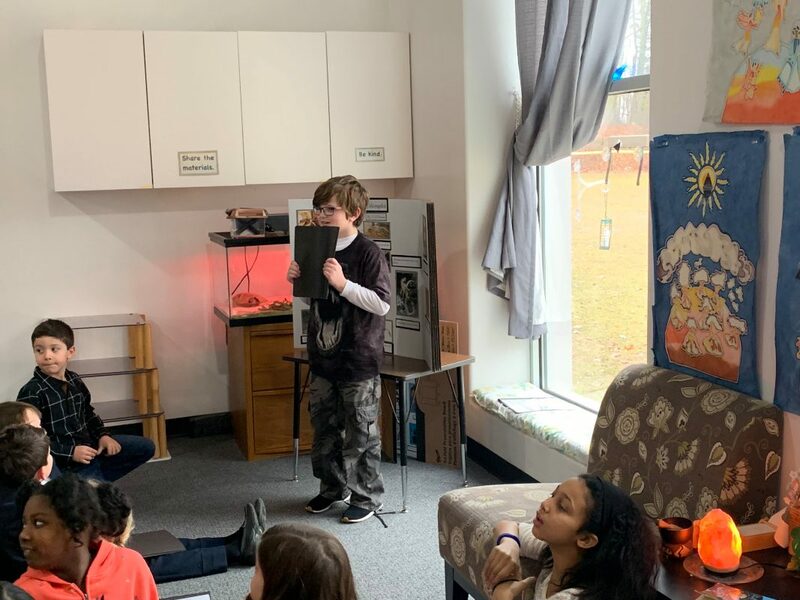 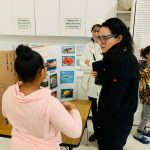 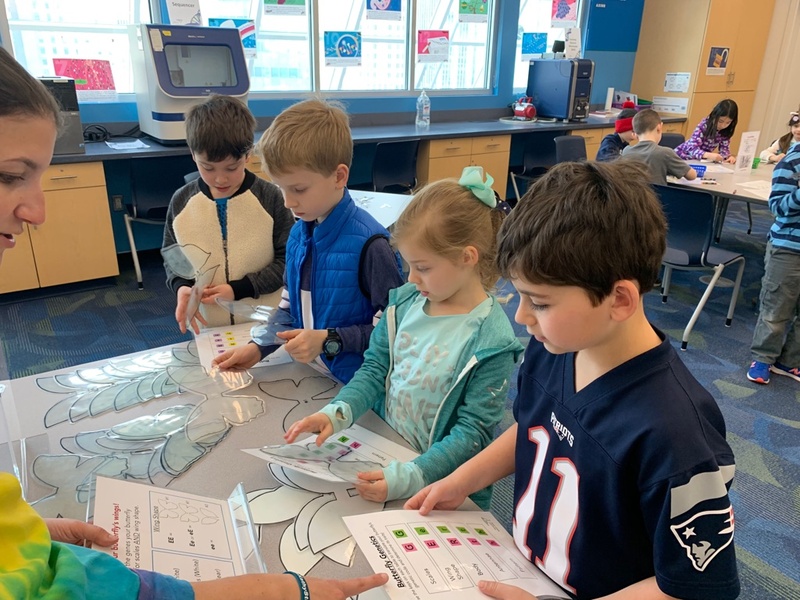 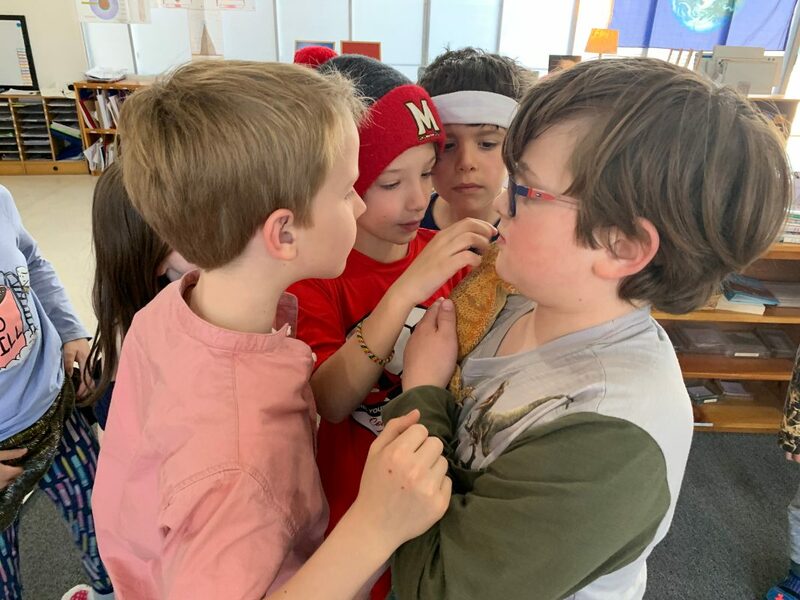 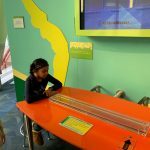 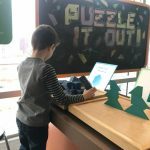 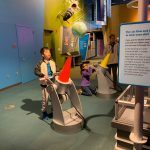 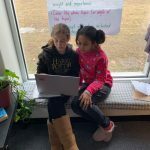 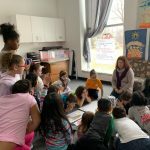 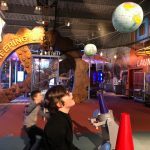 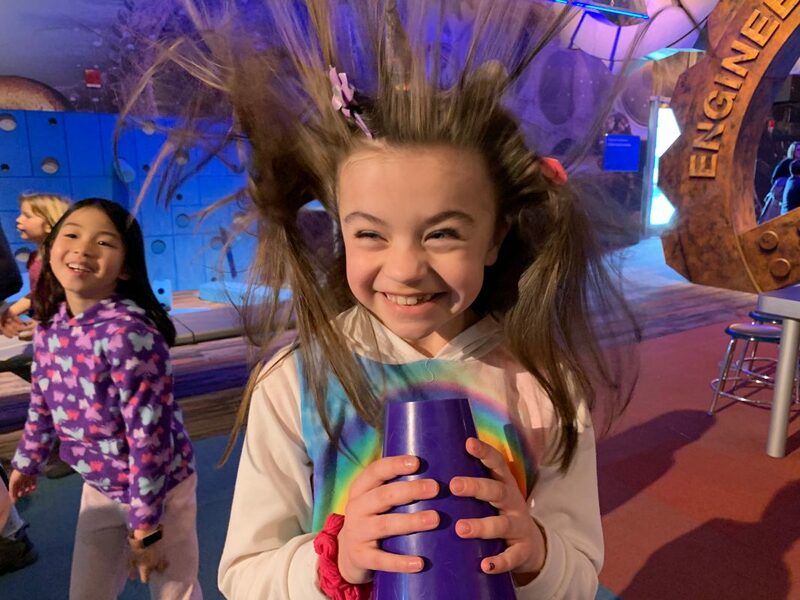 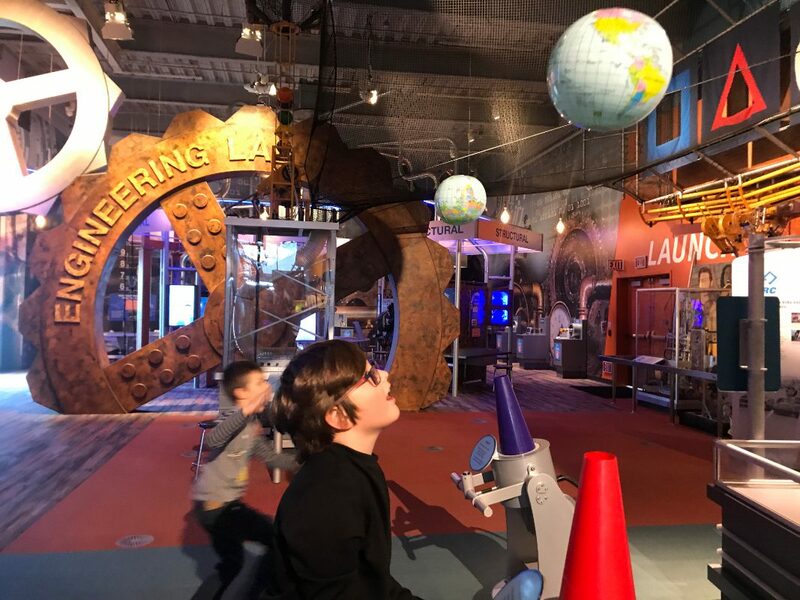 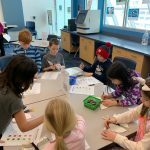 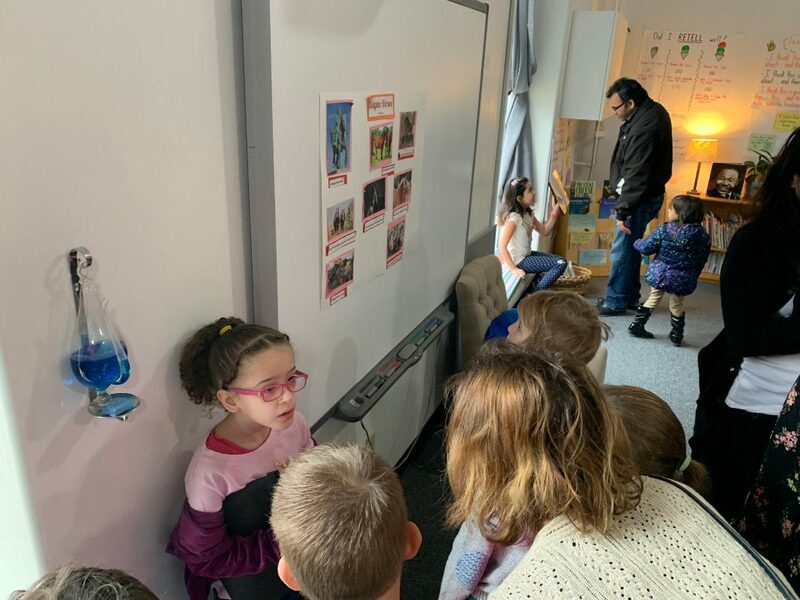 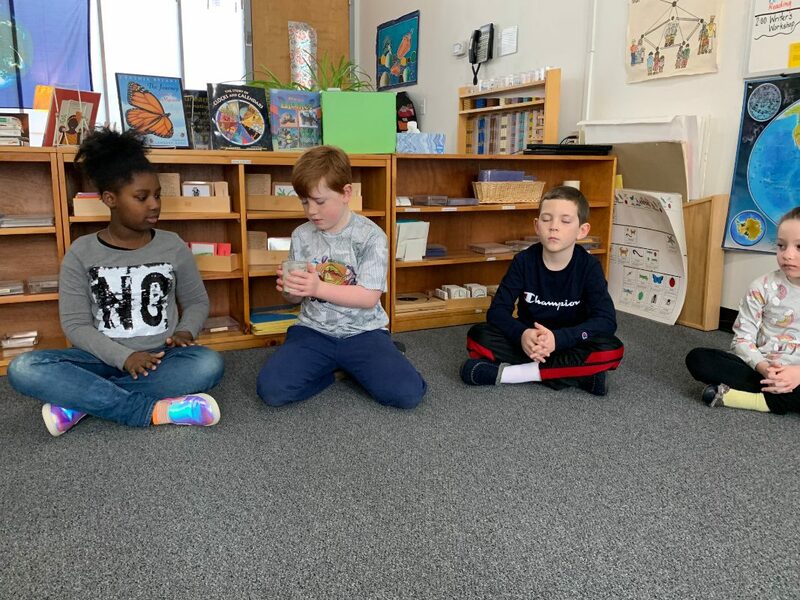 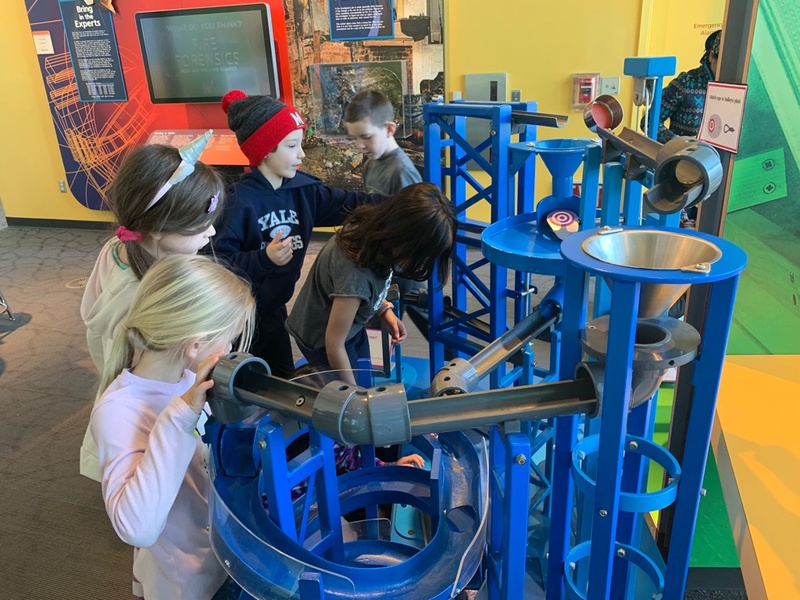 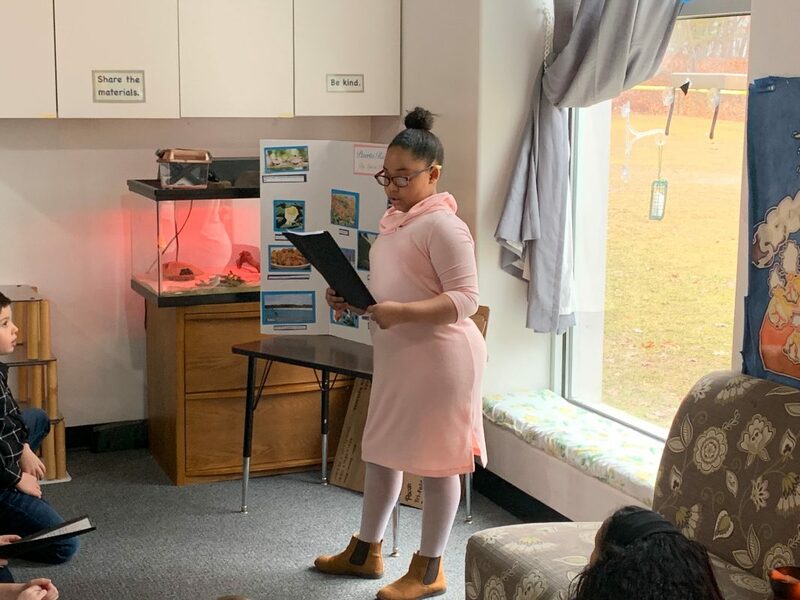 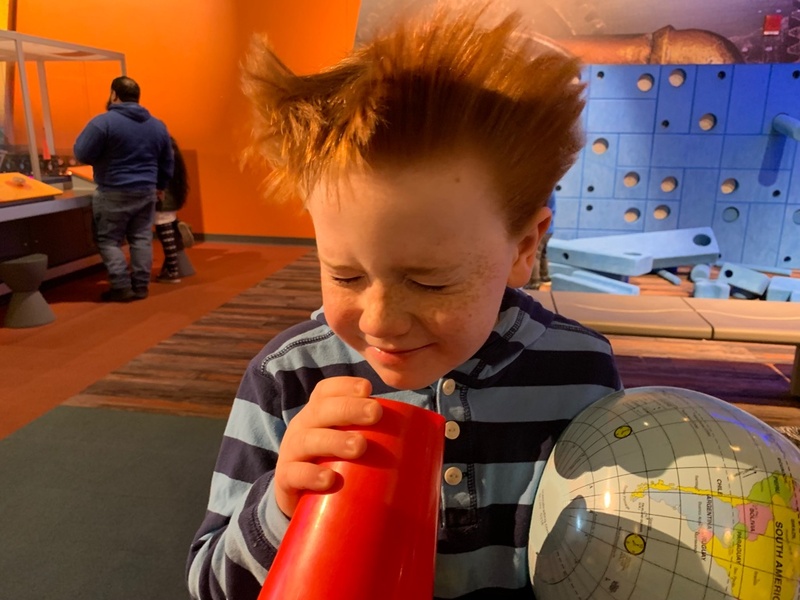 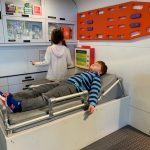 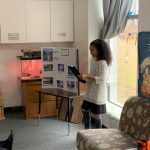 We started our unit on sound with some special activities that are designed to teach about sound at the Connecticut Science Center. 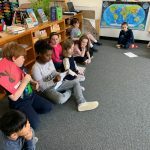 We learned that sound is created through vibrations in the air. 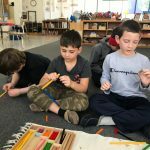 We looked at musical instruments, different sound frequencies, and sound waves. 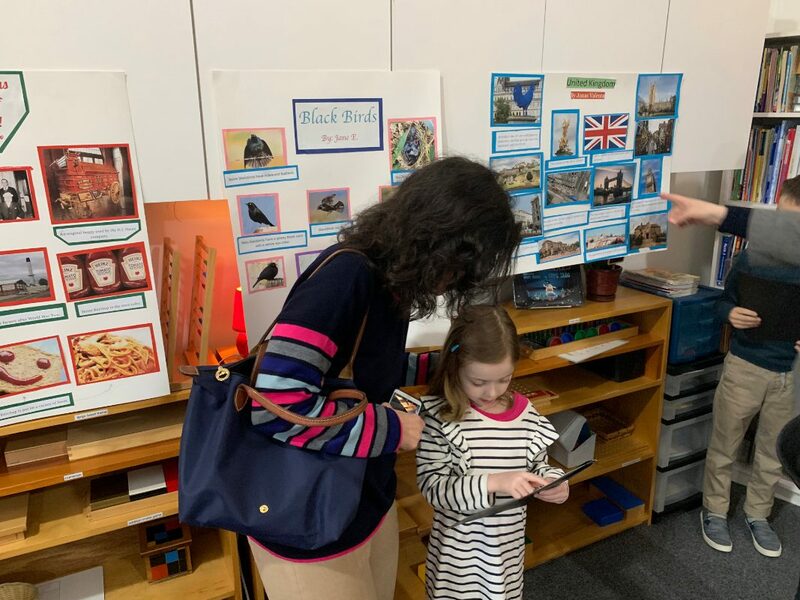 The children enjoyed getting their hands on different materials and exploring the different exhibits. 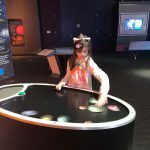 Some of the other exhibits we visited were forces in motion and exploring space. 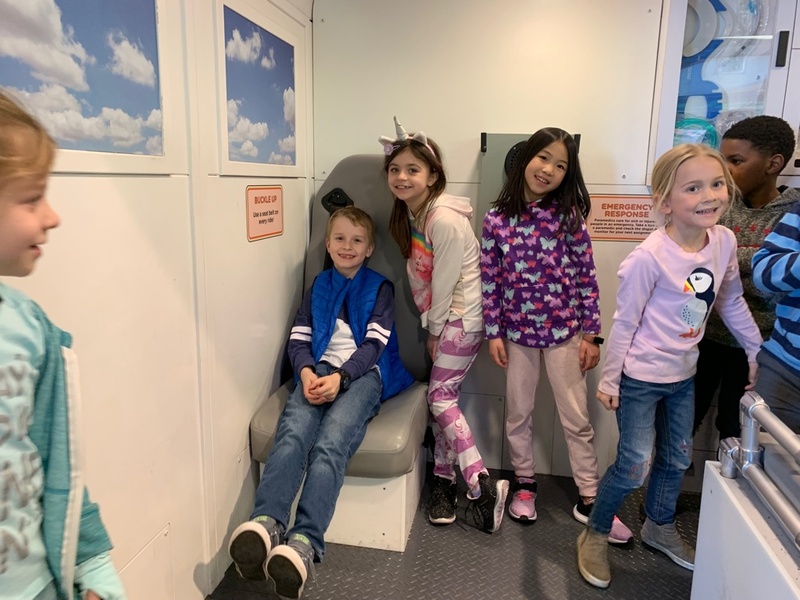 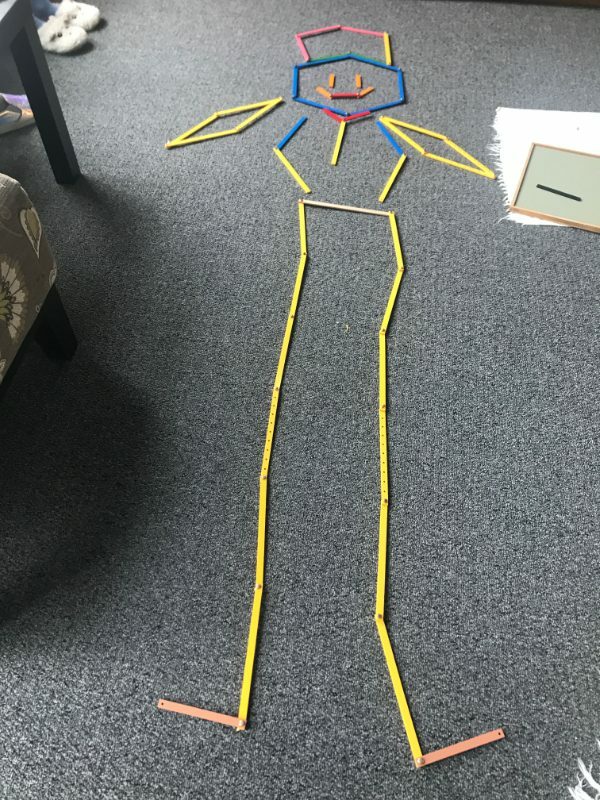 Here the children had the opportunity to design and test their own heli-flyer, move objects with wind power, took the controls of a lunar lander and lounged in a space pod to take a tour of the outer reaches of space. 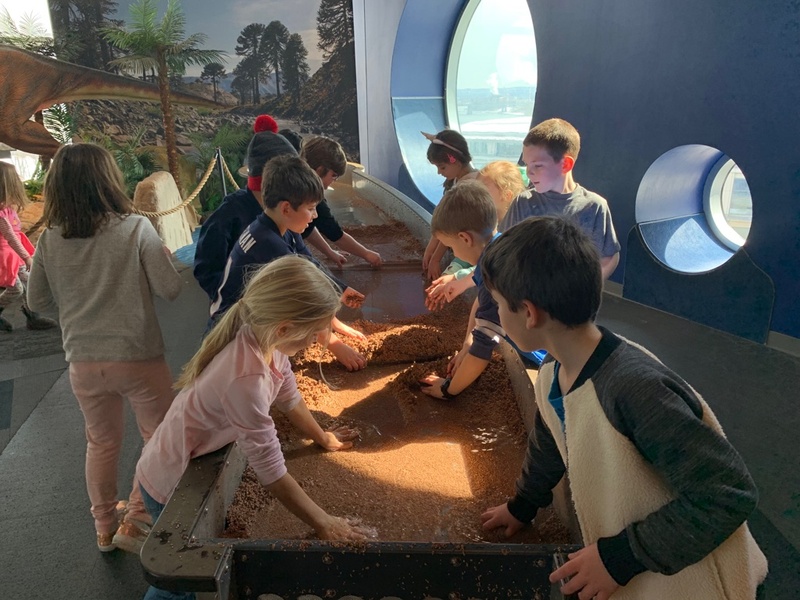 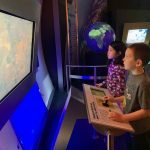 Another bonus about the field trip was that we got to dive further into our Earth lessons in the planet Earth exhibit. 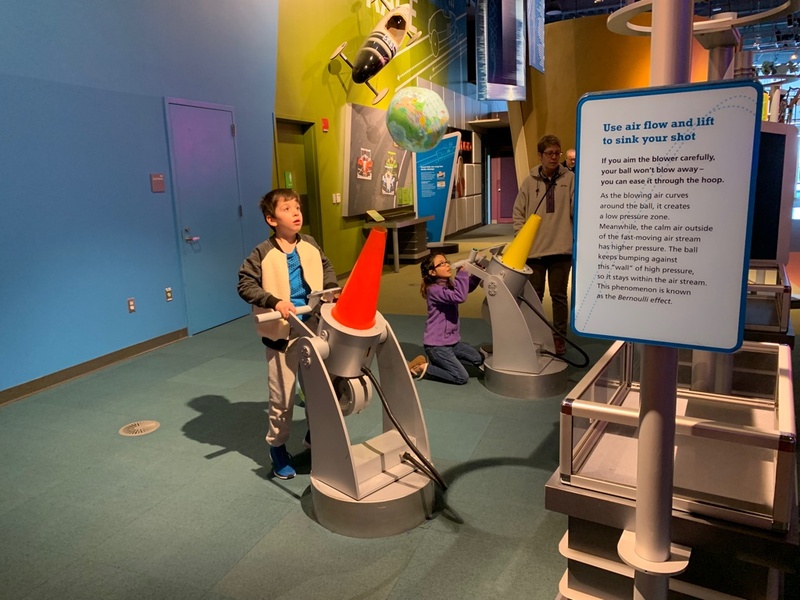 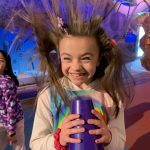 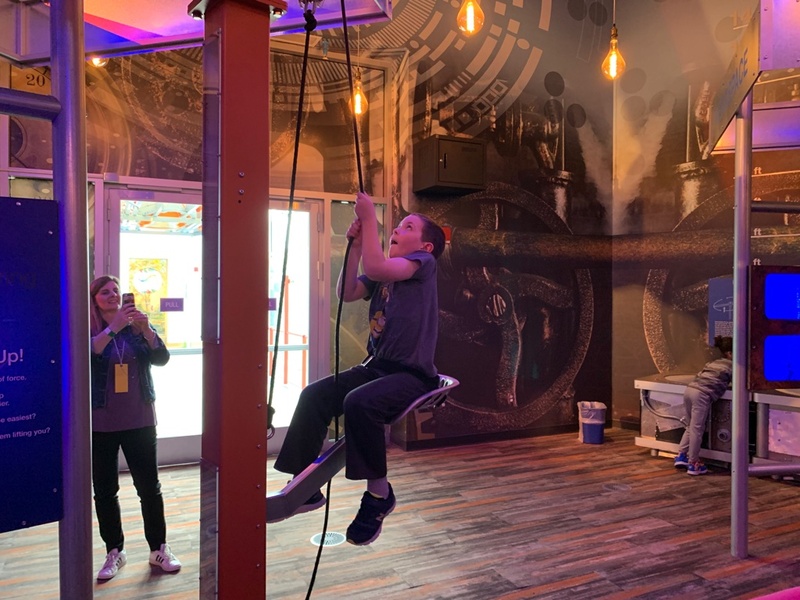 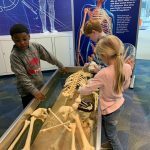 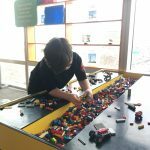 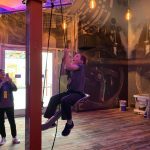 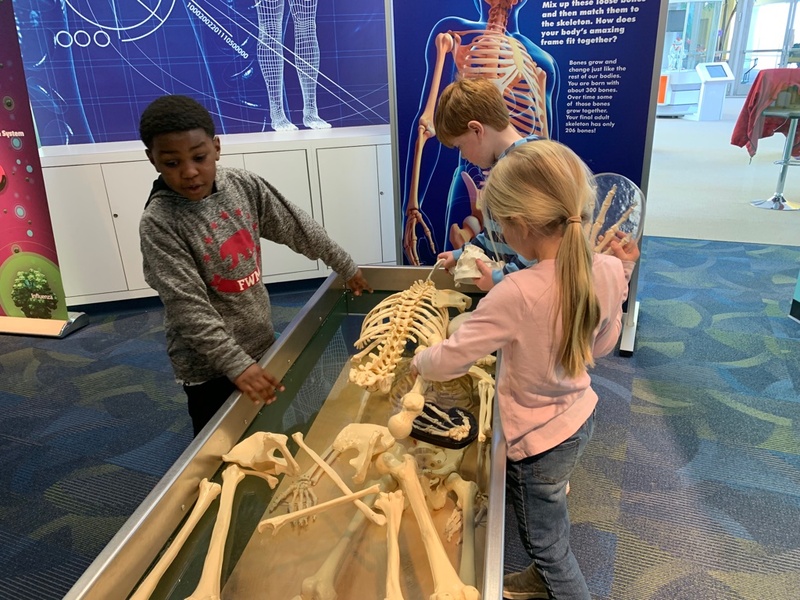 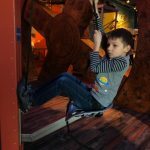 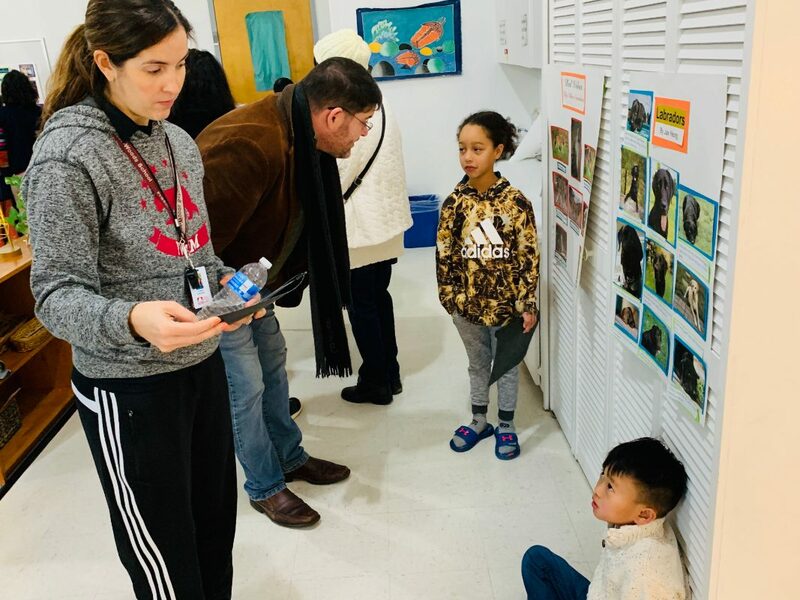 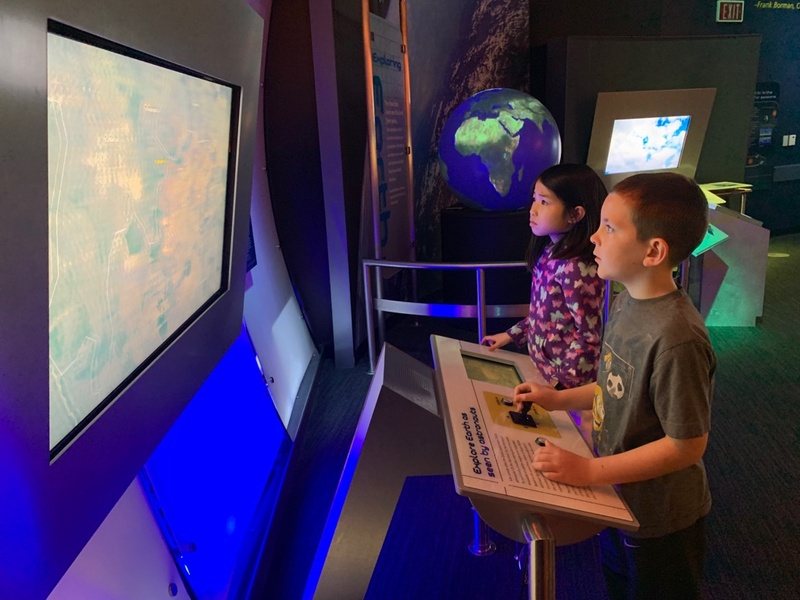 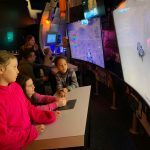 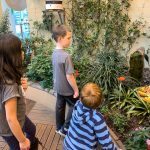 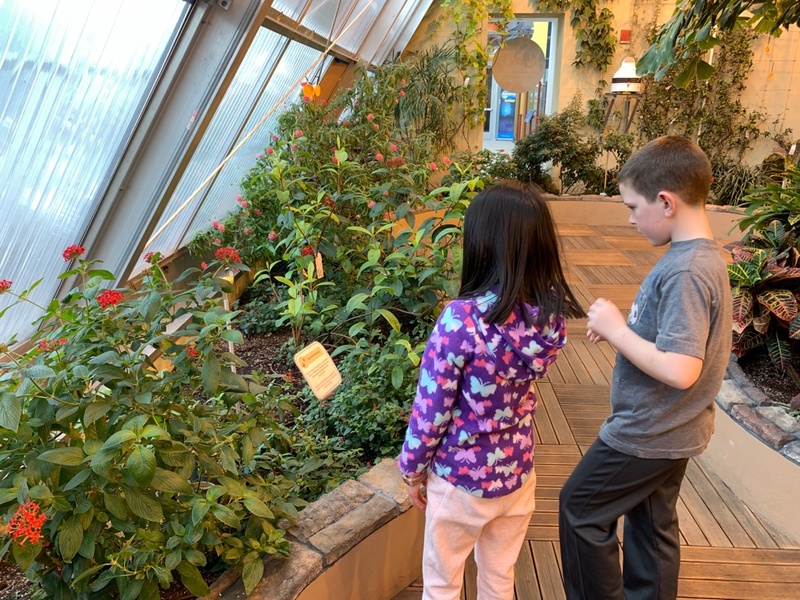 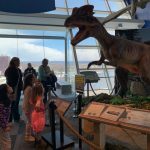 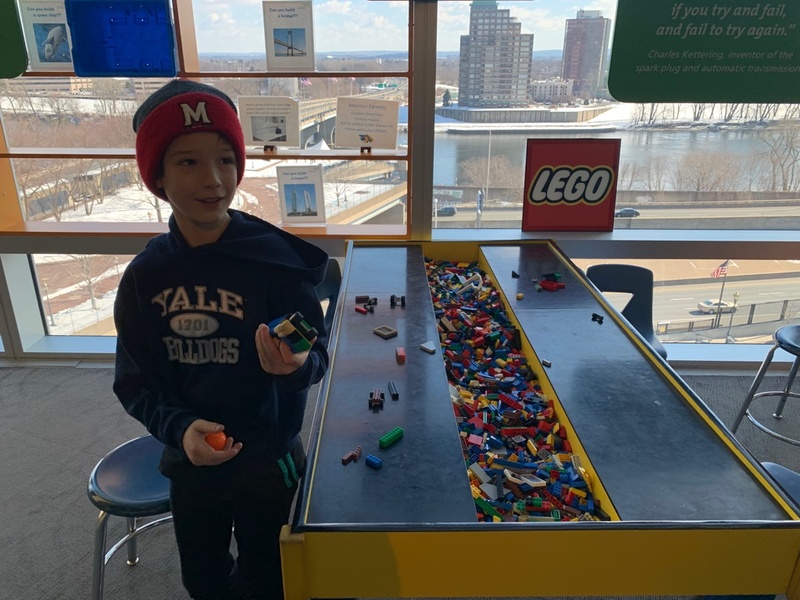 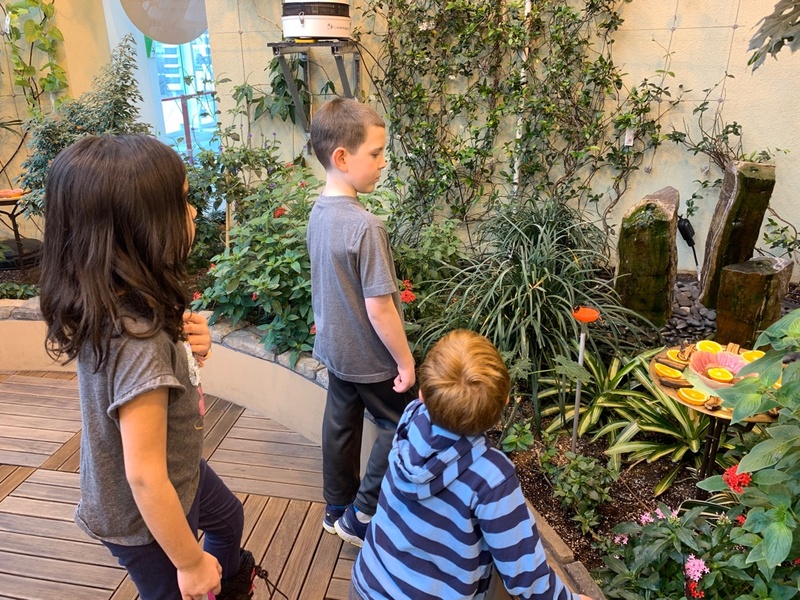 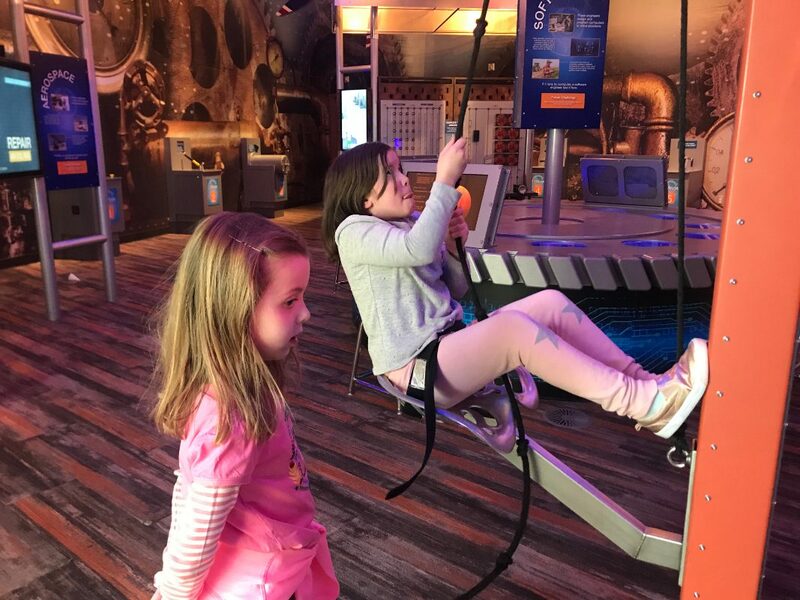 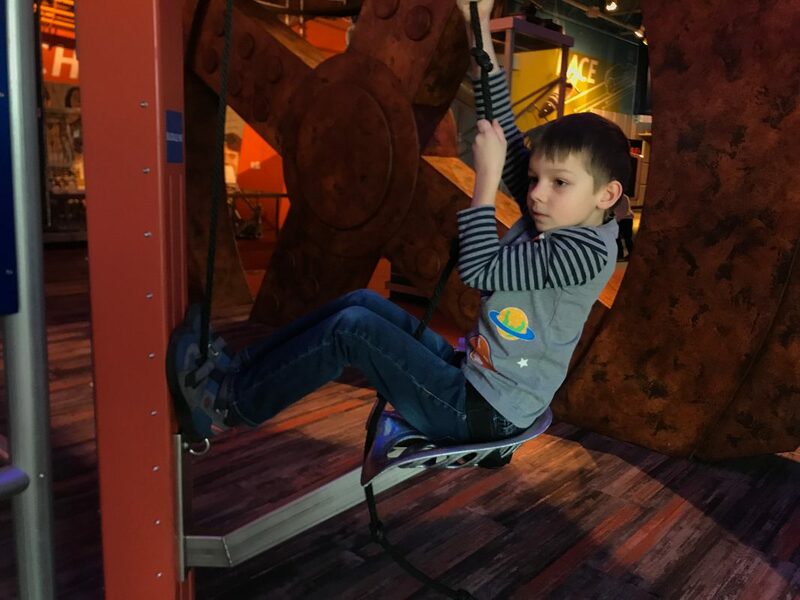 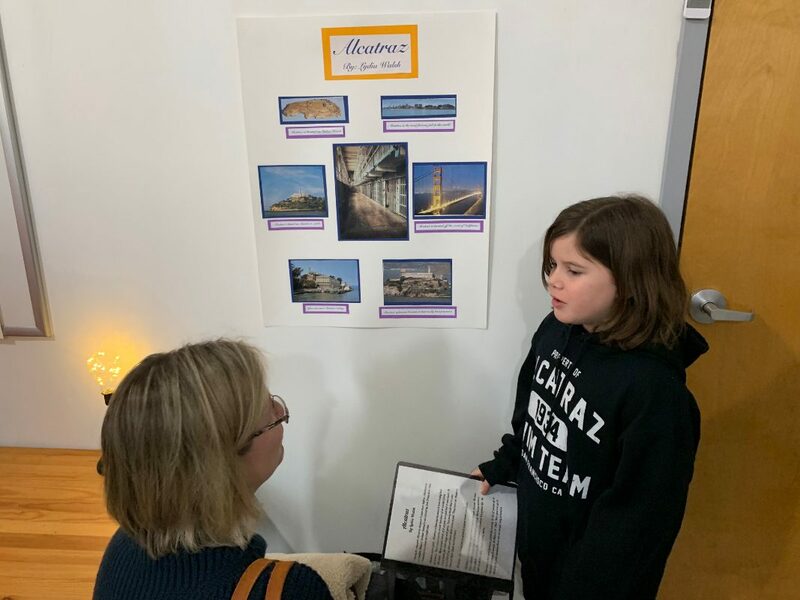 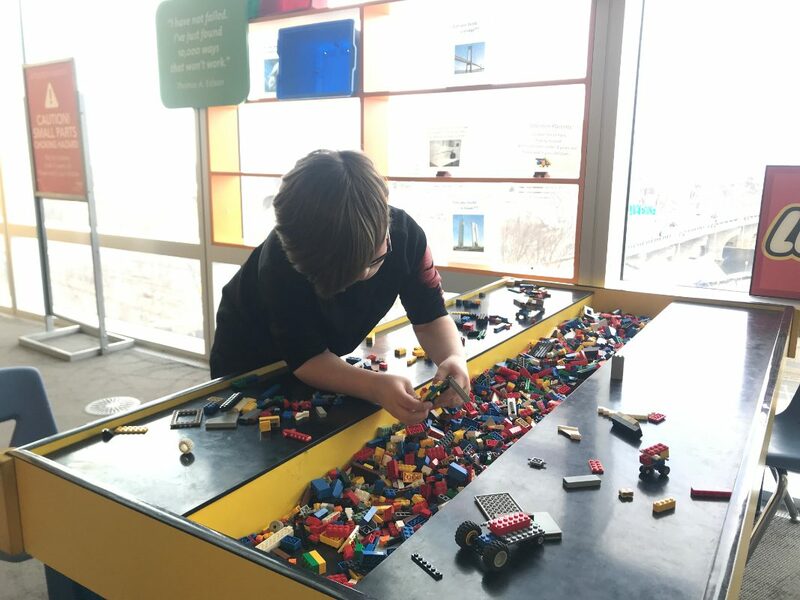 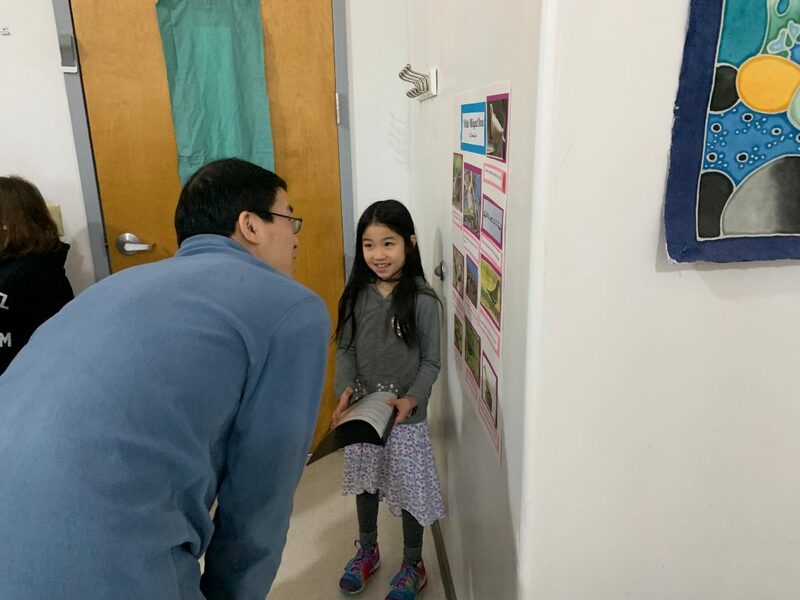 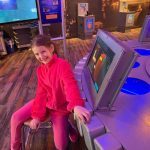 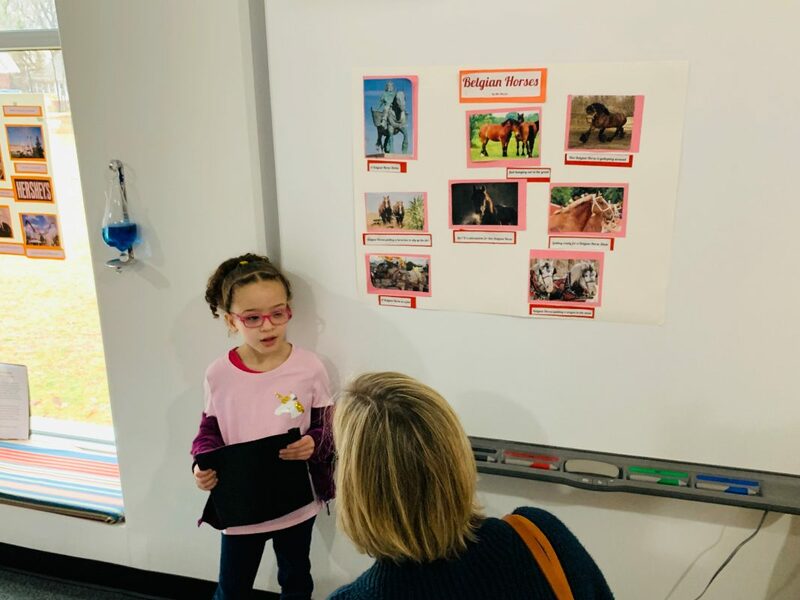 On top of that, some of the other exhibits the children explored were the inventions, health and sports, butterfly encounter, real bodies, and sustainable energy. 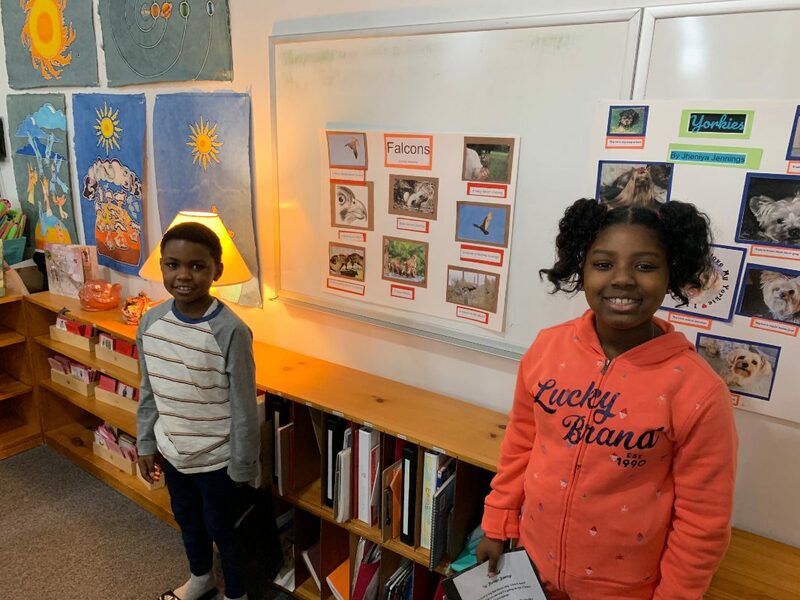 Stay tuned for our field trip coming up on Friday, April 26th to watch Disneynature’s Penguins. 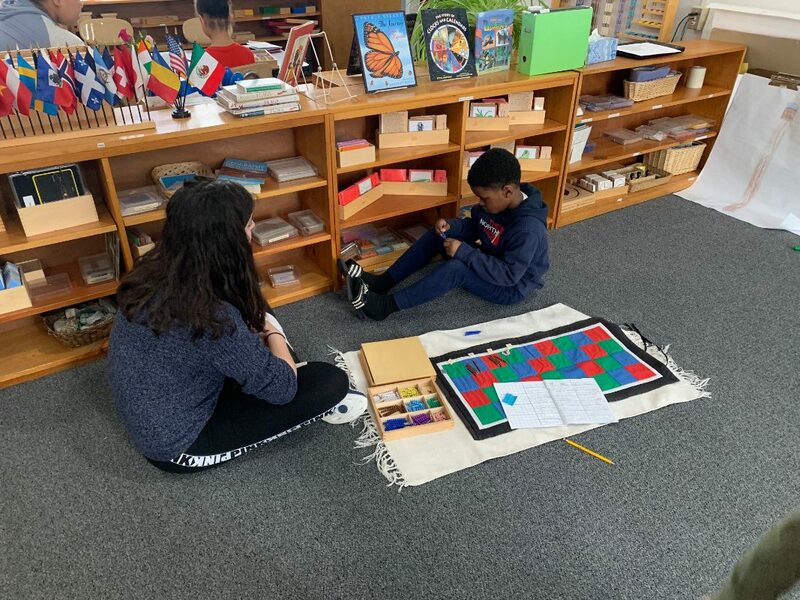 The teaching of grammar is an integral part of the Montessori language curriculum for elementary children. 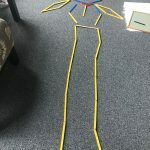 The aims of this work are for the children to learn the parts of speech and to understand the relationships between them. 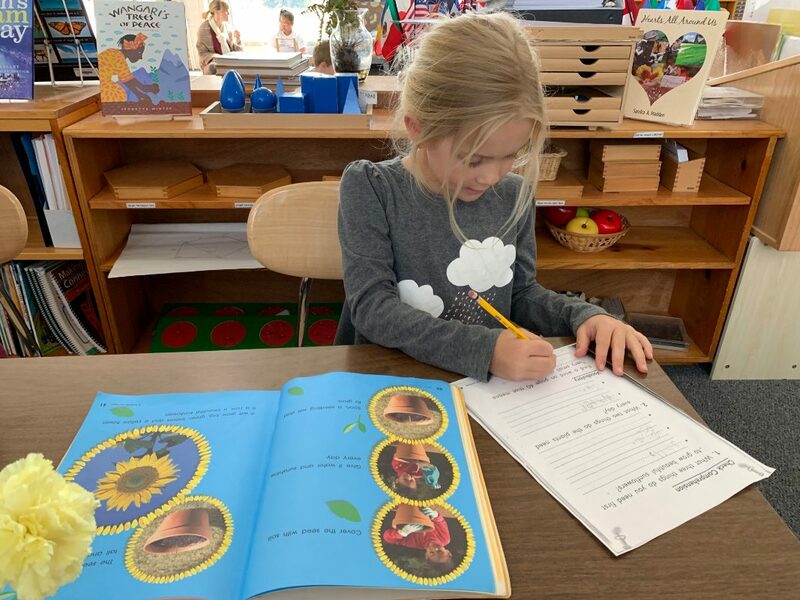 This work also provides practice reading and writing and enriches the vocabulary of the children. 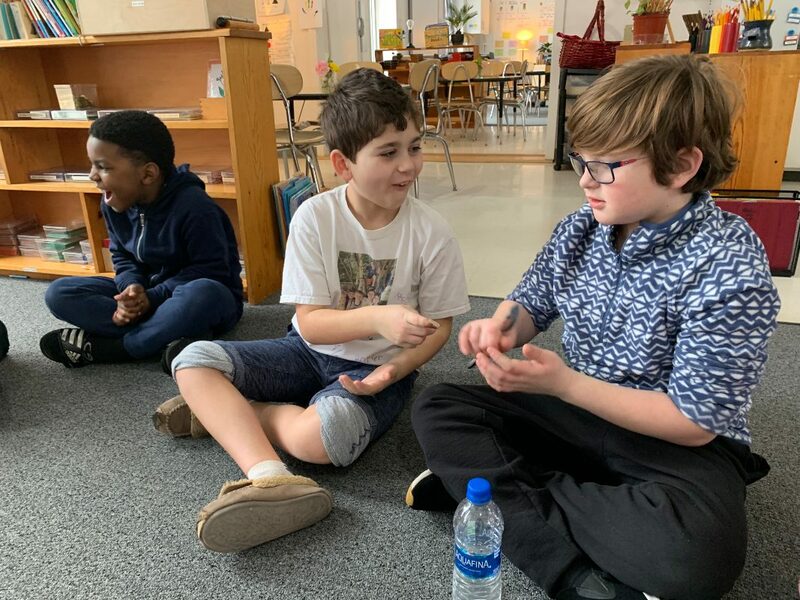 Introductory lessons for each part of speech are given as part of a story; their purpose is to give an impression of the function played by each different part of speech. 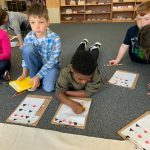 The children are introduced to grammar symbols for each part. 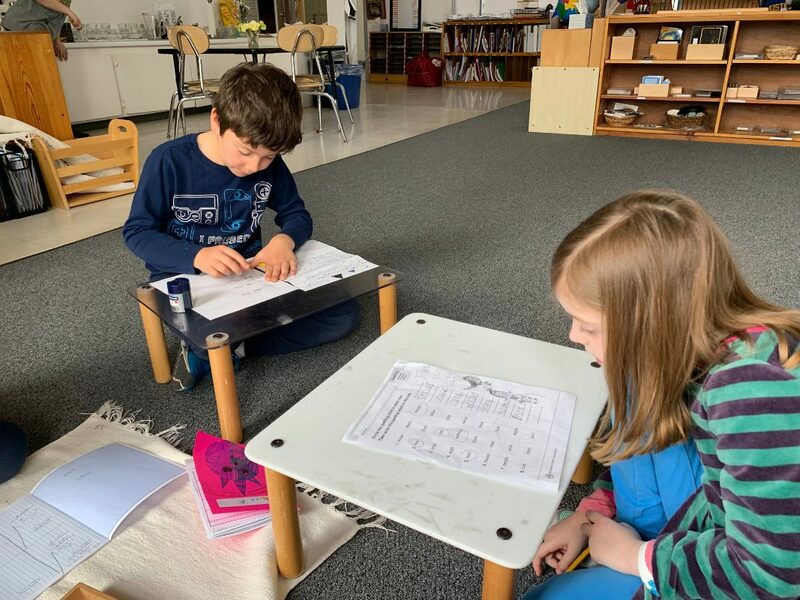 Lessons are followed up with work which is a tool for the children to explore the parts of speech. 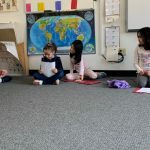 This week first year children learned about adjectives, second year children learned about pronouns, and third years learned about interjections. 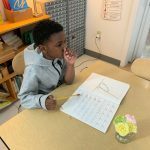 They enjoyed their lessons and did some beautiful follow up work. 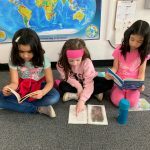 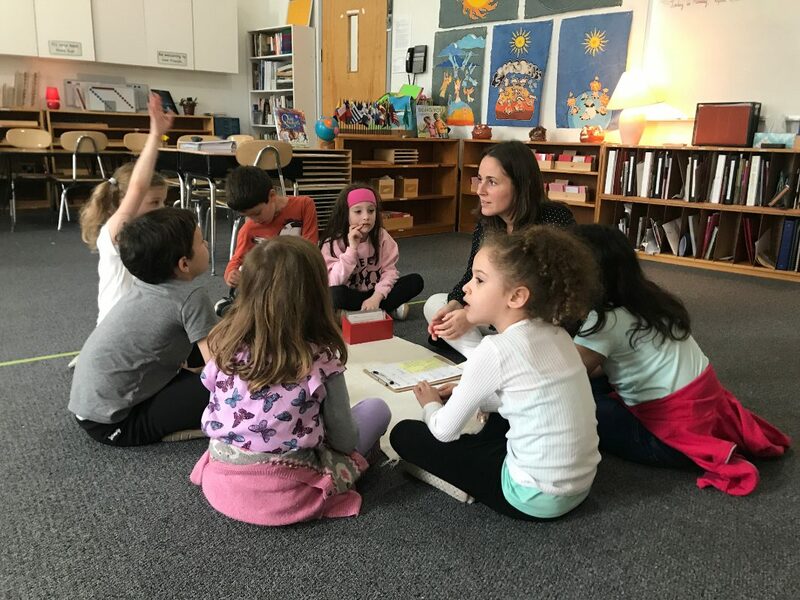 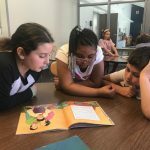 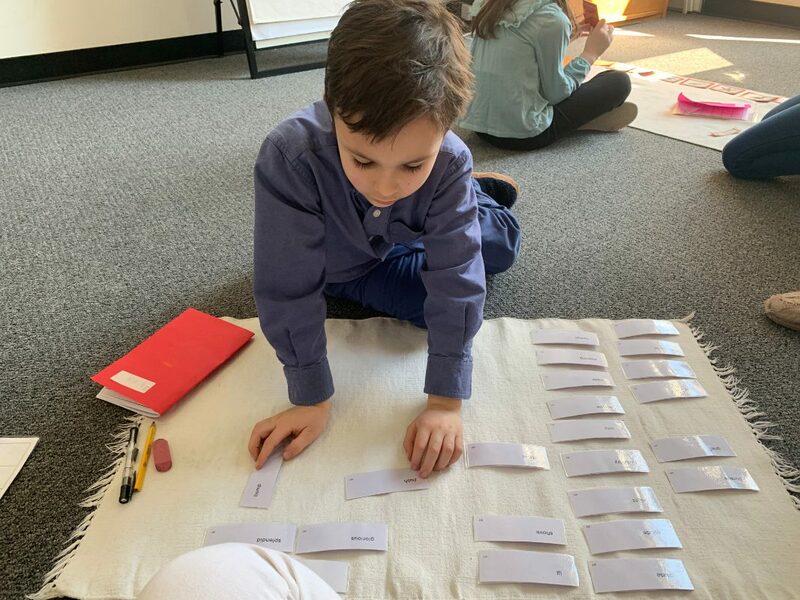 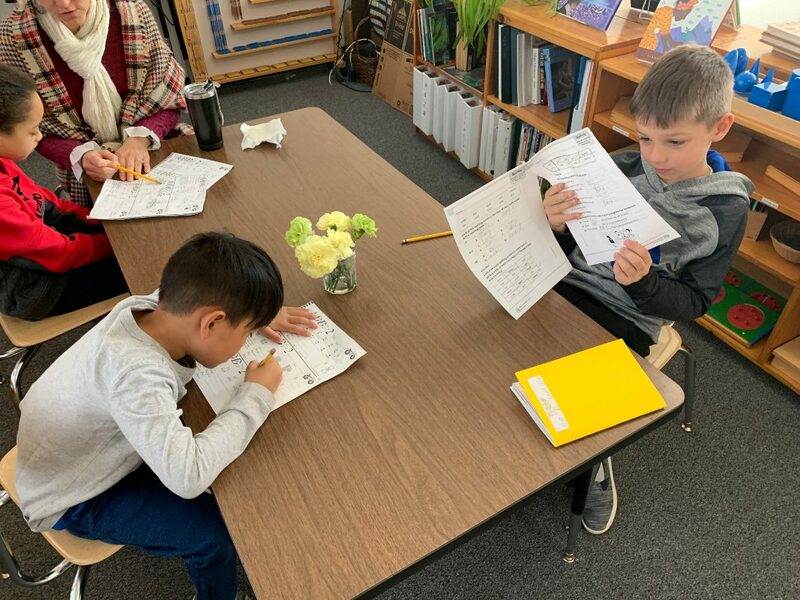 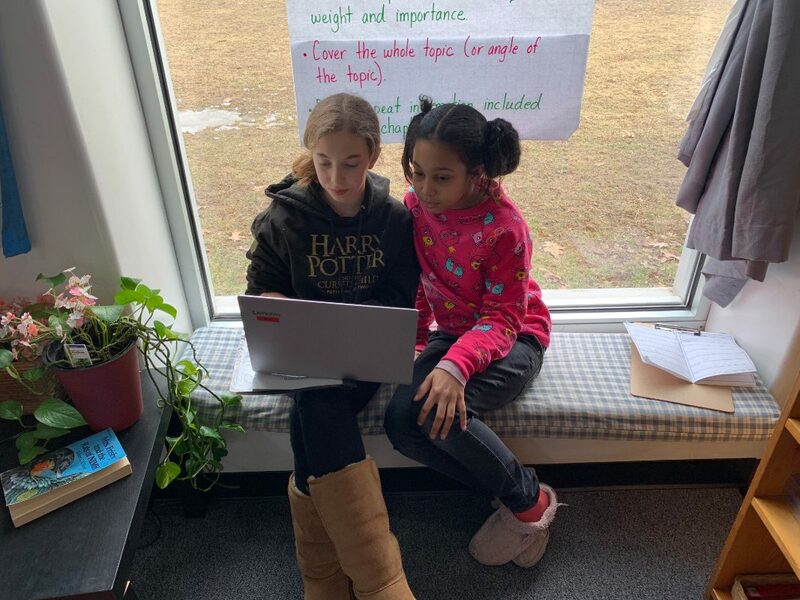 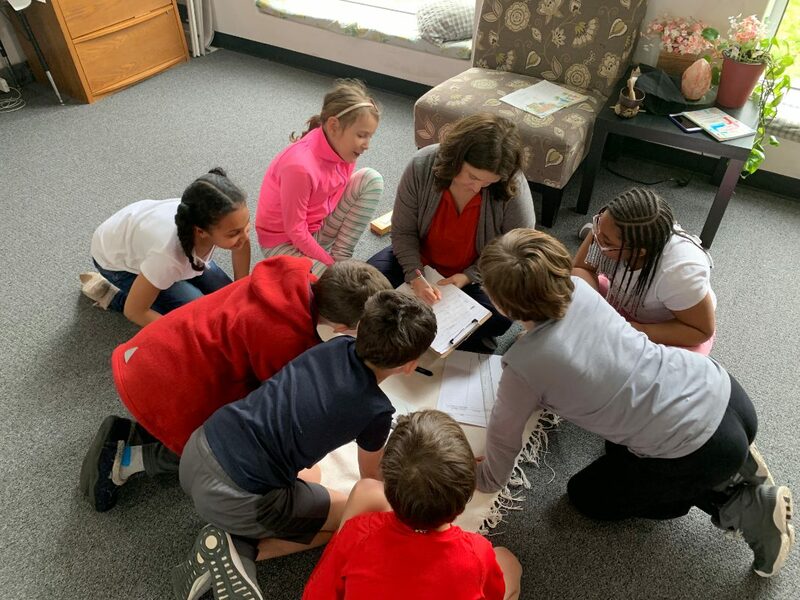 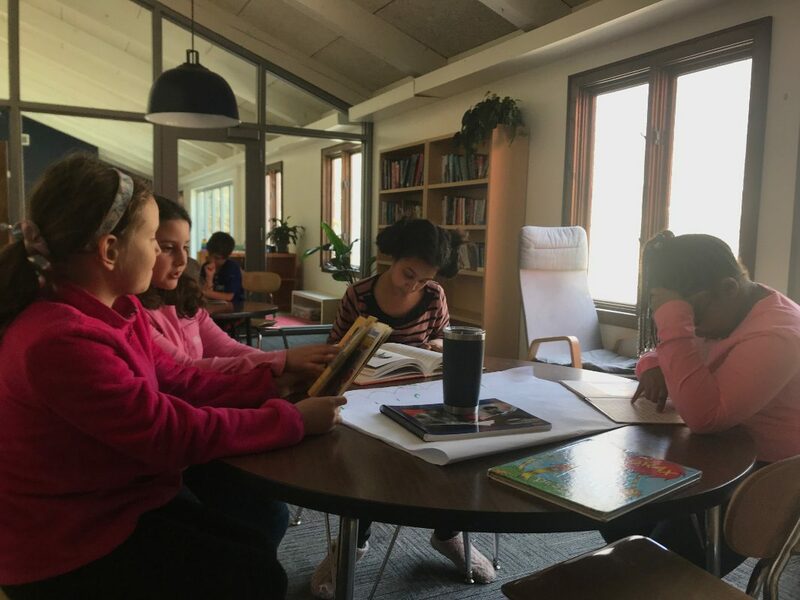 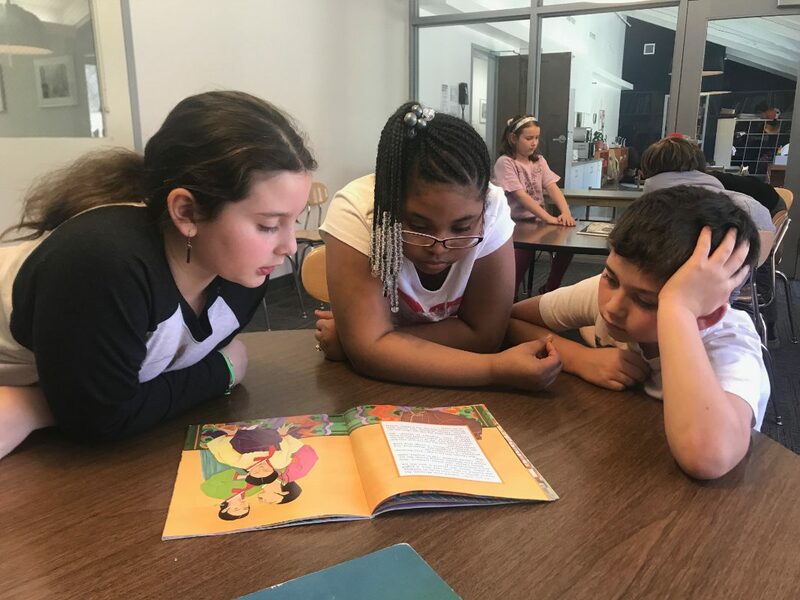 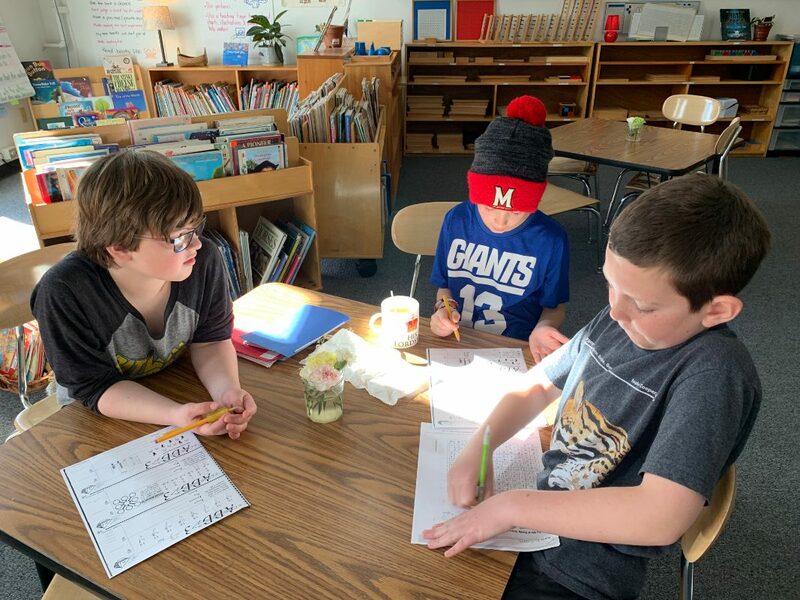 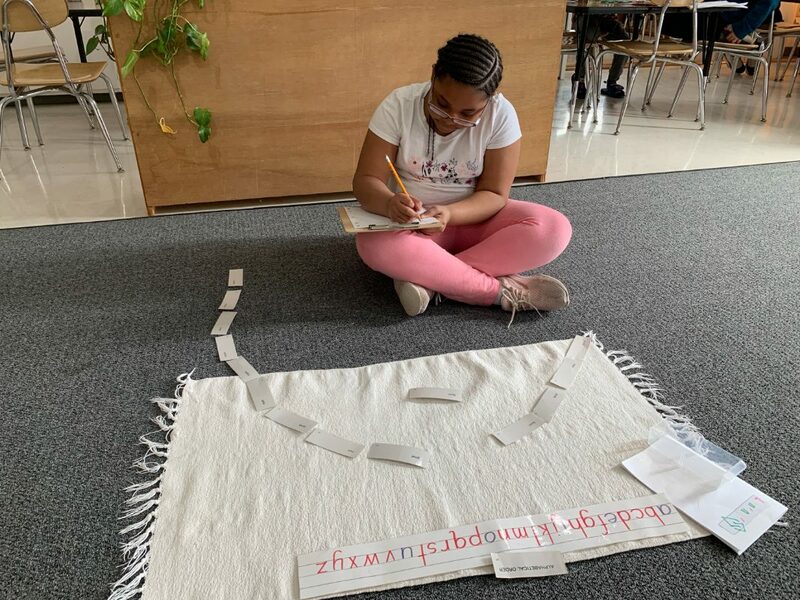 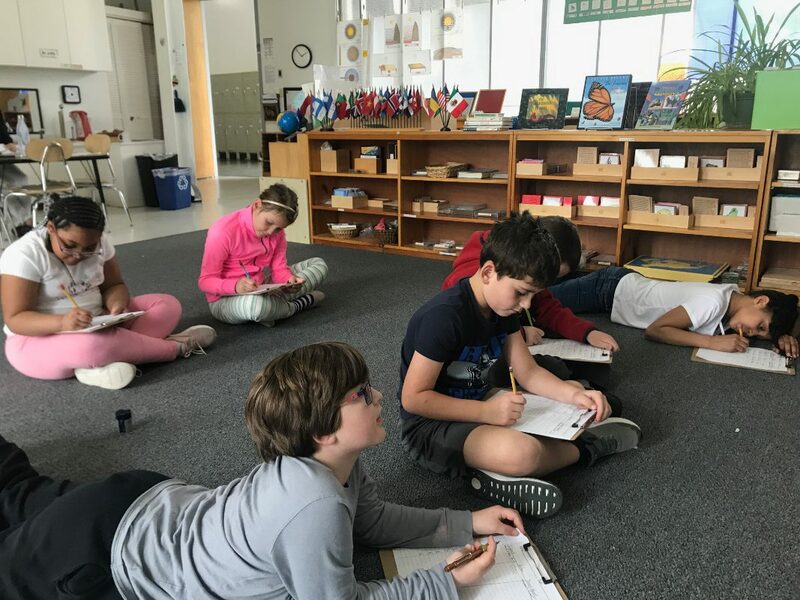 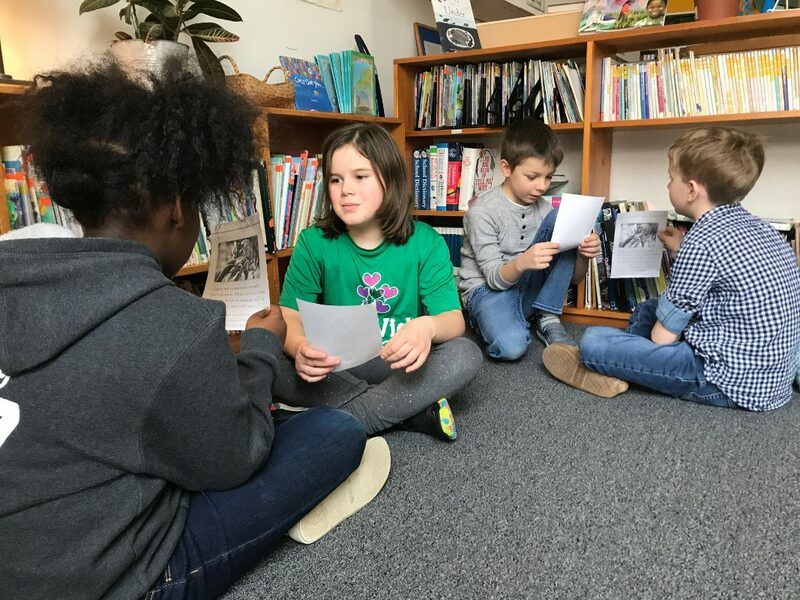 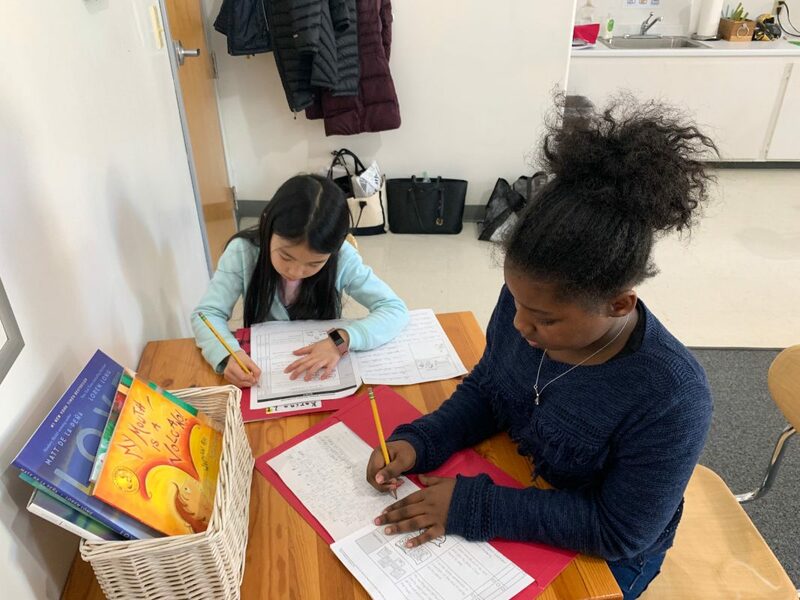 In Reader’s Workshop this week, second year students learned about rereading a page to make their voices smoother after identifying and learning the meaning of key words. 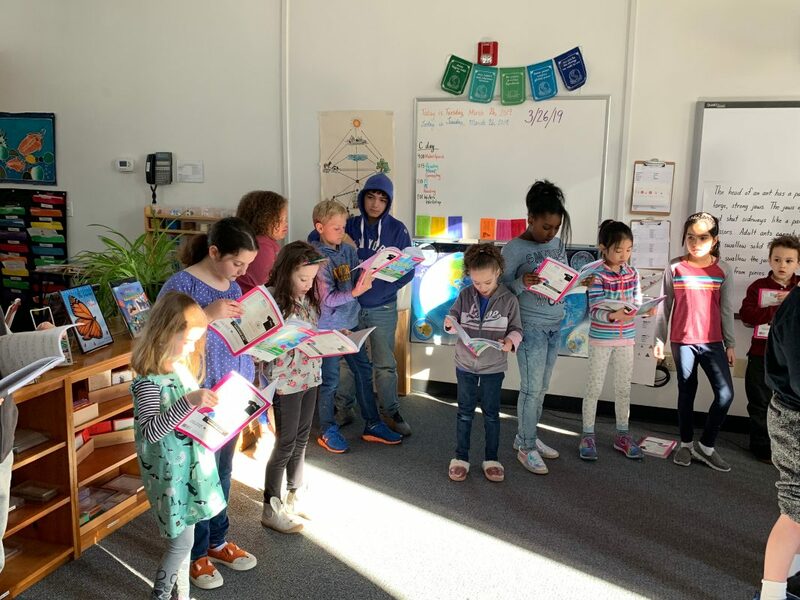 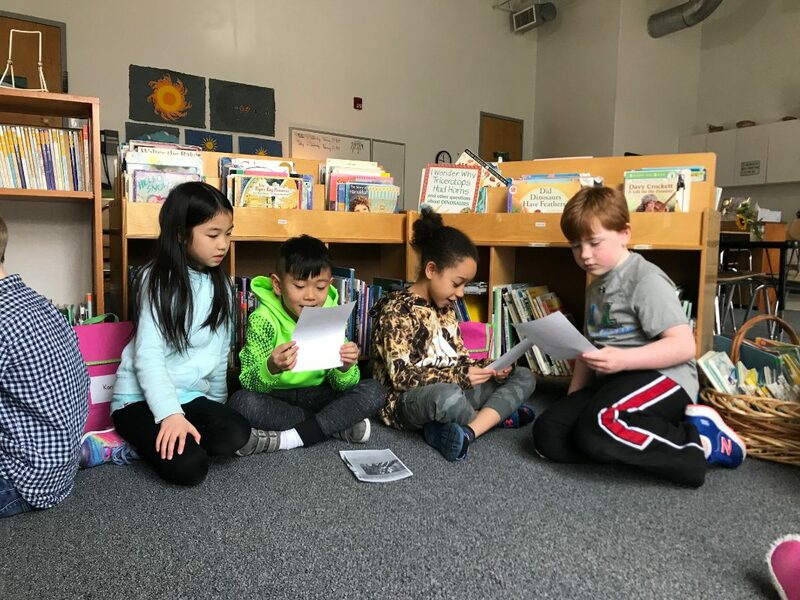 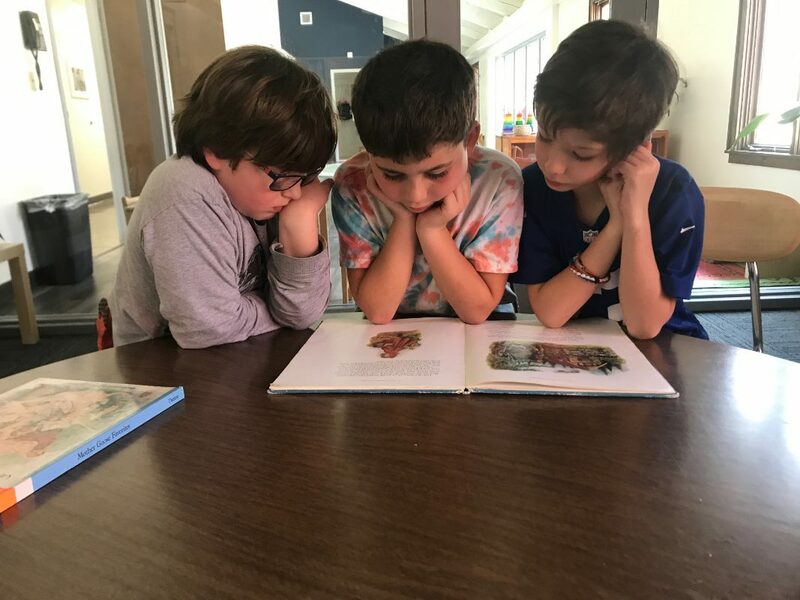 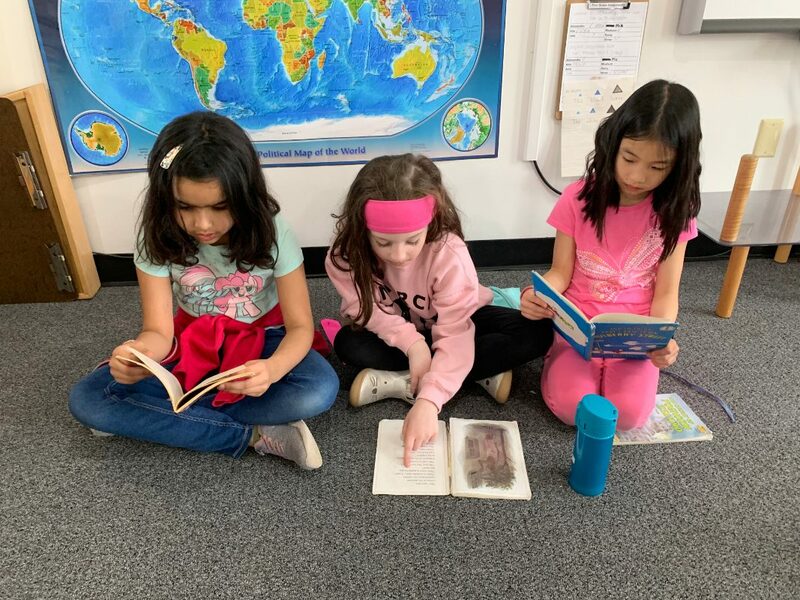 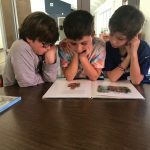 They also learned to read the page the way it wants to be read, meaning adjusting the tone and inflection in their voice according to what the page was about. 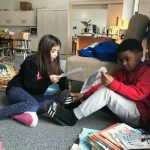 They worked with partners, practicing these skills after their minilesson. 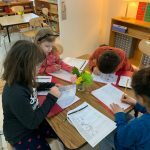 Another busy week here in Lower Elementary! 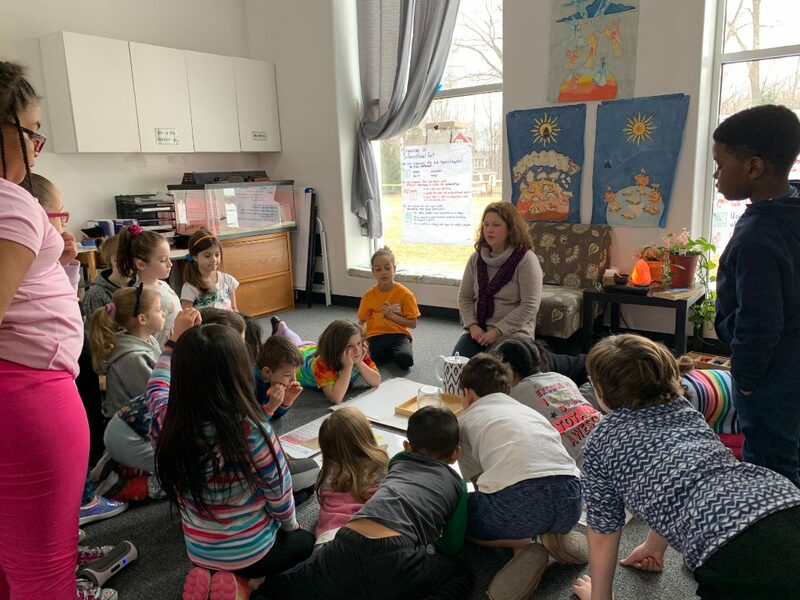 This week Karen introduced an impressionistic lesson about radiant and passive heat, the Earth’s insulation. 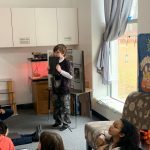 Radiant heat comes from something that is burning, and passive comes from something that has collected the heat from something that is burning. 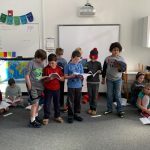 For example, the rays of the sun heat the Earth, but they do not heat the atmosphere very much. 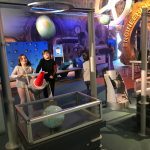 The atmosphere is heated by the collected heat of the Earth. 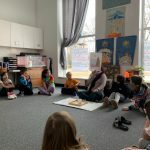 The children got to experience this first hand by first heating up a spoon and then feeling the heat radiate off of it. 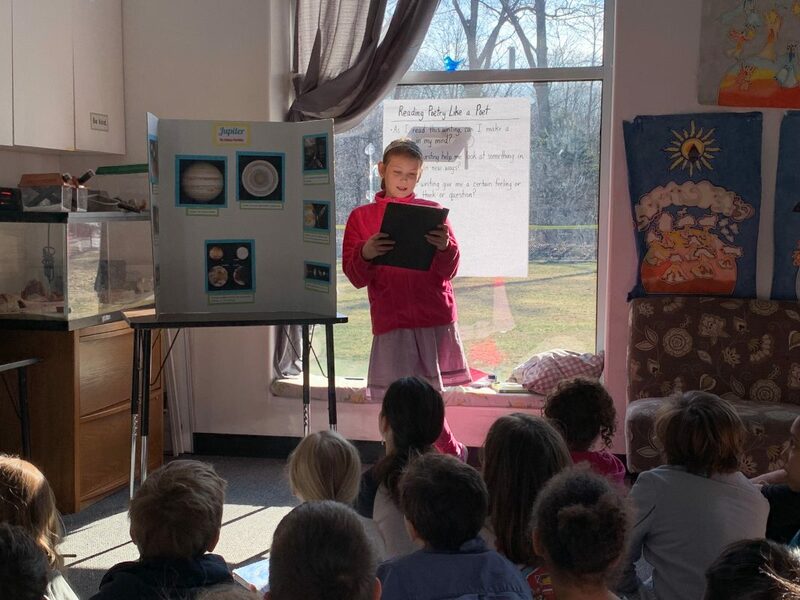 Just like the Earth, it gives off its heat and warms the atmosphere. 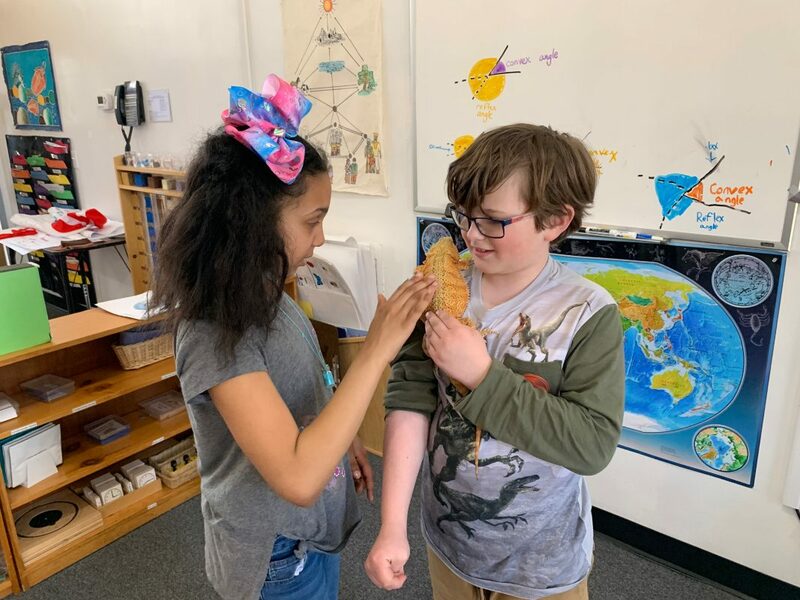 This heat is not as strong as the direct rays of the sun, but the atmosphere acts like a blanket, and holds the heat in, just like the spoon. 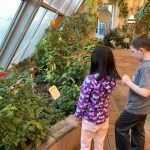 This is called the greenhouse effect. 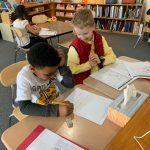 They also enjoyed learning about the temperature of the air and the amount of moisture the air can hold. 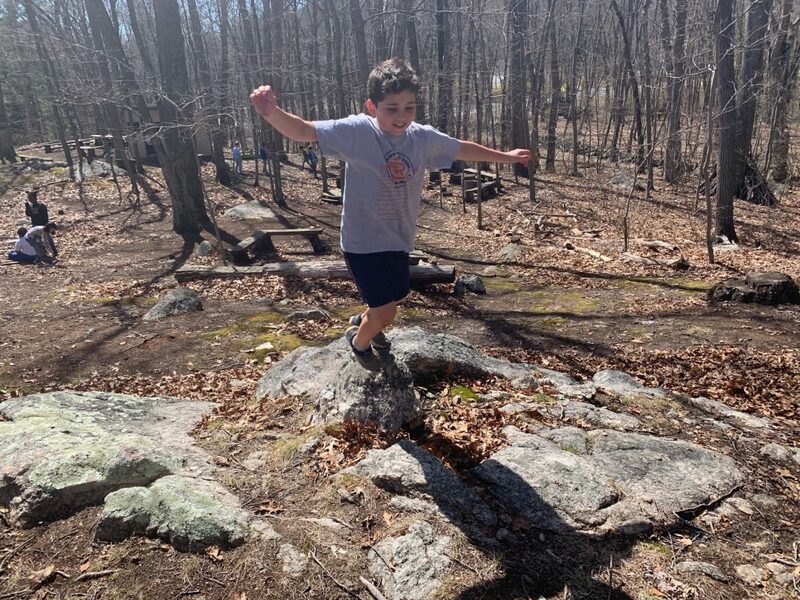 As the air goes up the side of a mountain, it cools, and is forced to release its moisture. 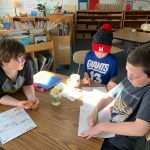 To illustrate this idea, we boiled water in a small pan and then briefly covered the pan with a cool glass bowl. 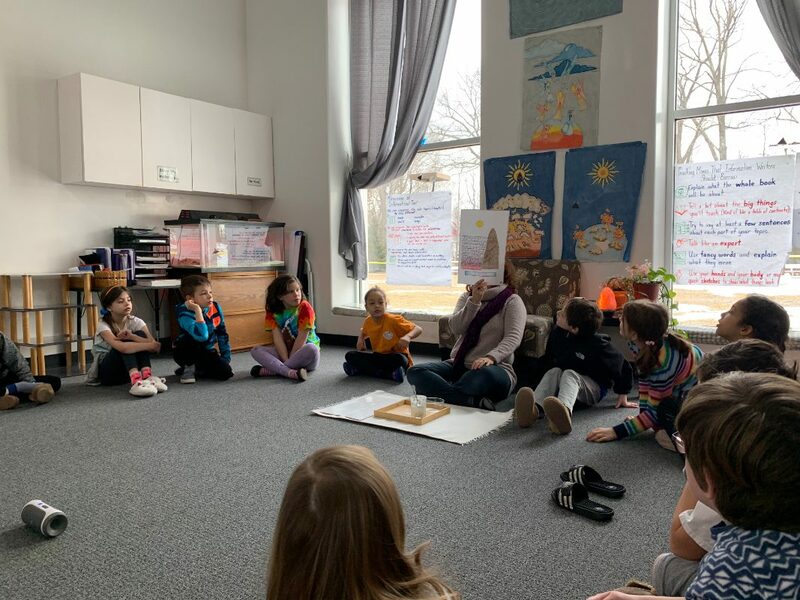 The children observed water droplets quickly appearing on the bowl because the coolness of the bowl allows the air to release its moisture. 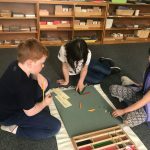 This week we felt very fortunate to have extra hands in the classroom to help prepare for our Research Morning. 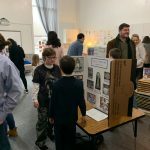 For community service, the middle school students assisted our students with the construction of their poster boards. 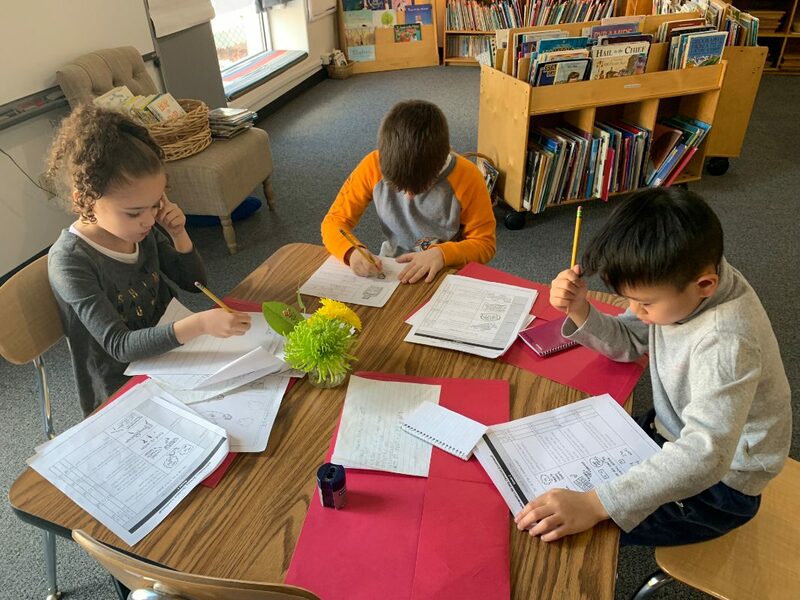 As we mentioned the past two weeks, we have been incorporating research into our Reader’s and Writer’s Workshop lessons. 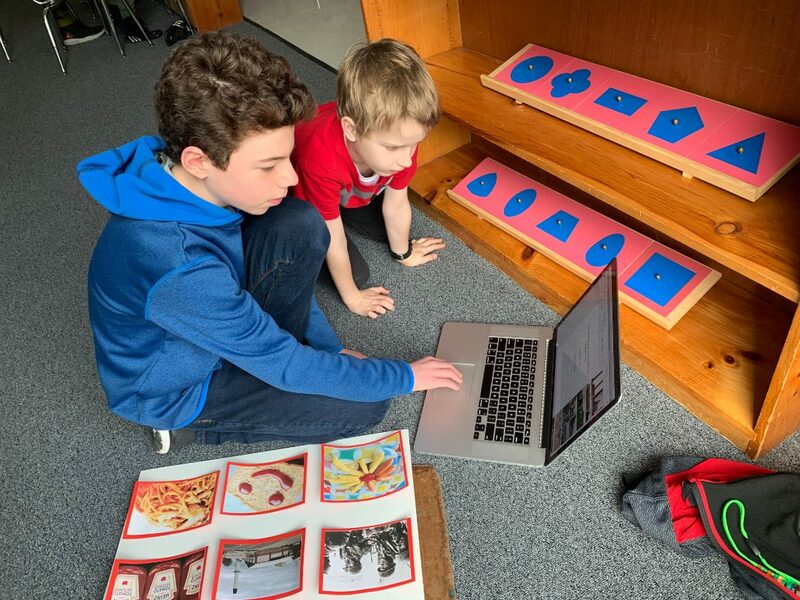 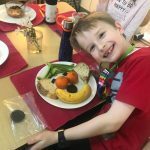 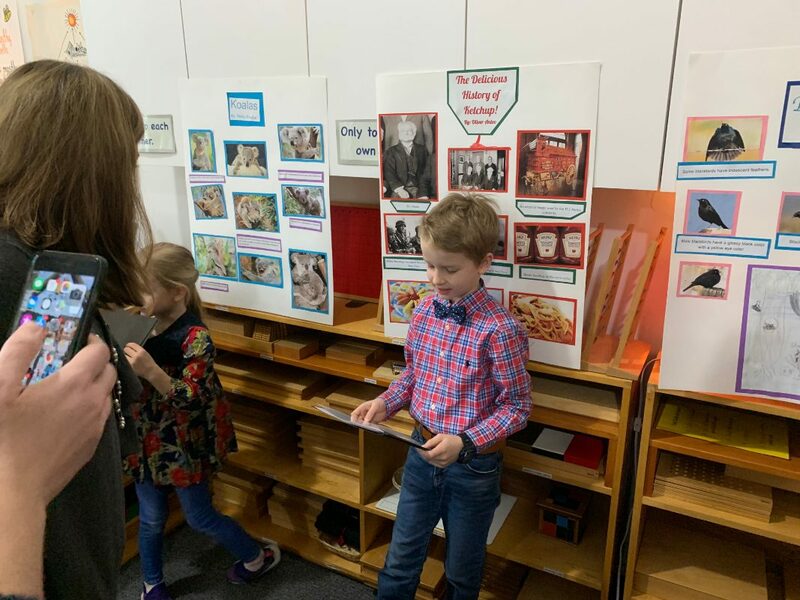 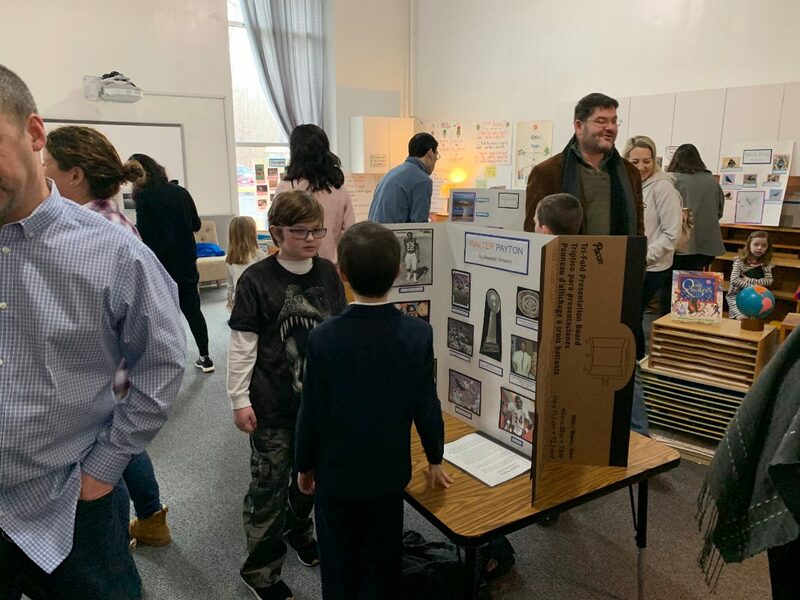 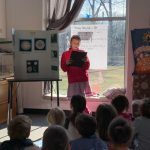 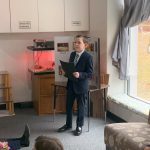 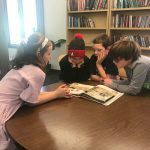 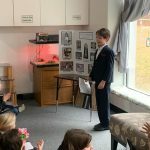 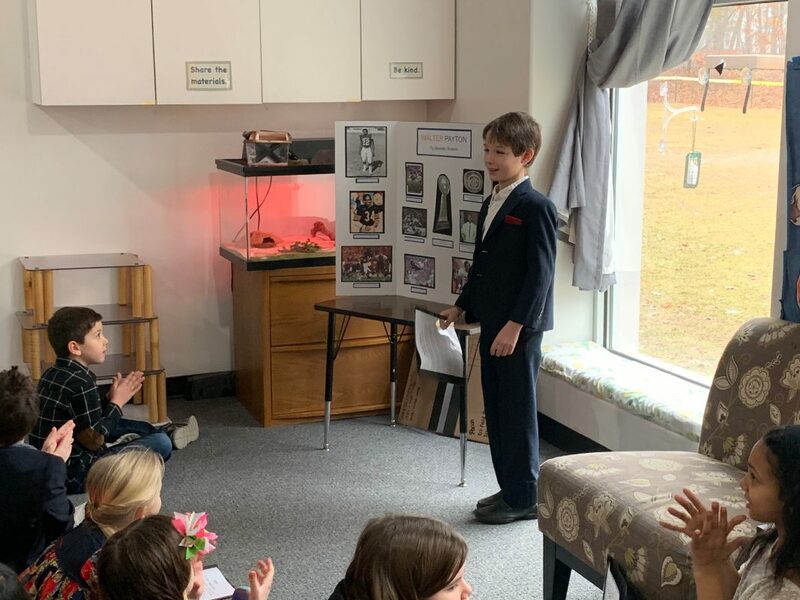 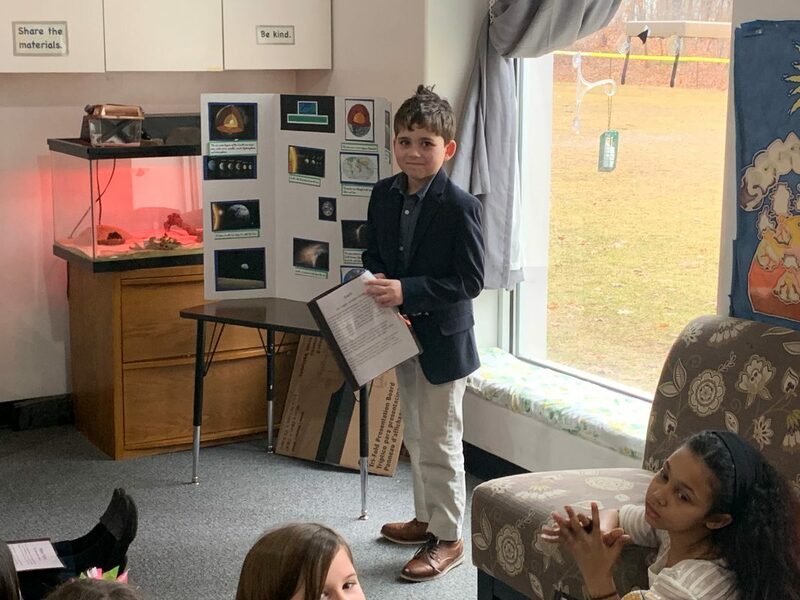 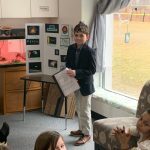 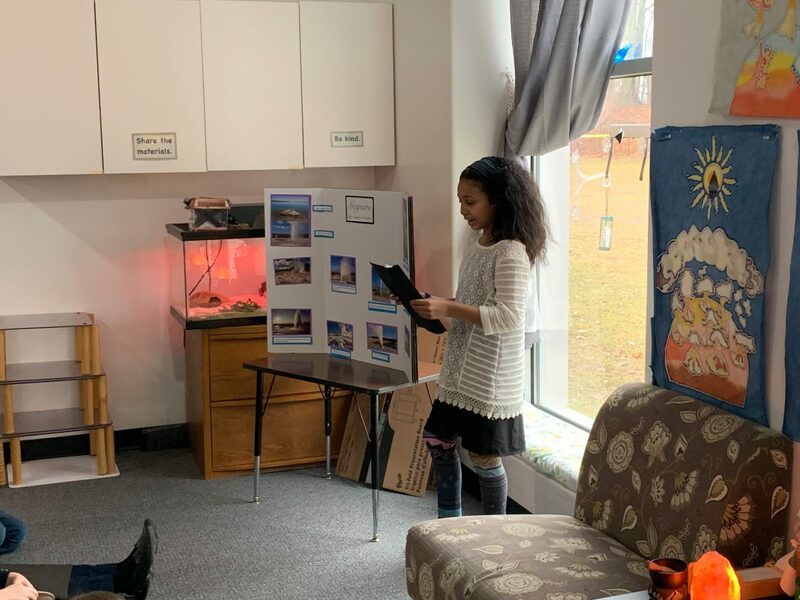 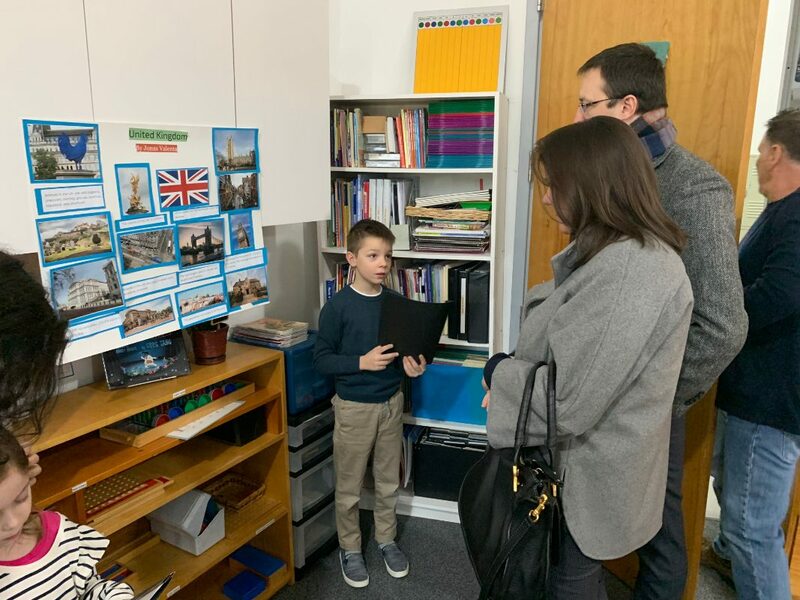 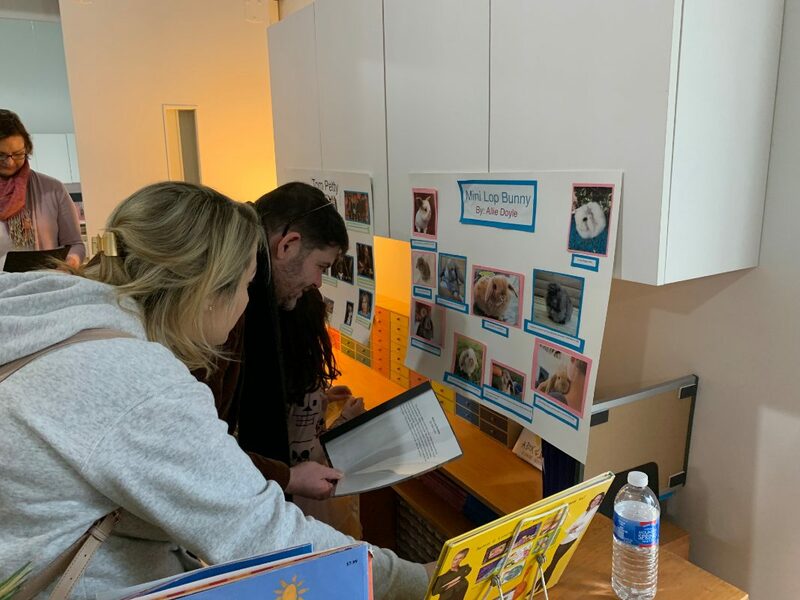 Another change in research this year was that the children chose their own topics from any area of personal interest instead of being given a theme from within to choose a topic. 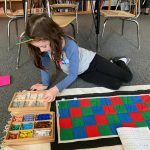 As a result of these changes, we observed true authentic Montessori research at its finest. 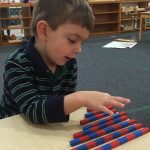 The process the children followed after choosing their topic was tailored specifically to each child’s readiness. 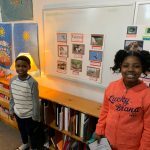 We guided students in their selection of informational texts and provided questions for them to answer to guide their research. 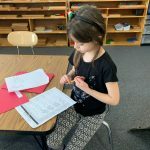 Depending on readiness, each child elaborated to different levels on his or her answers to the questions. 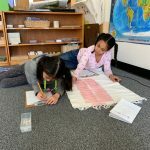 This led to the children naturally writing their research papers. 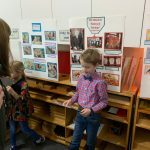 In addition, each child designed his or her own display. 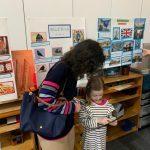 After this morning, the children were left feeling so empowered and confident. 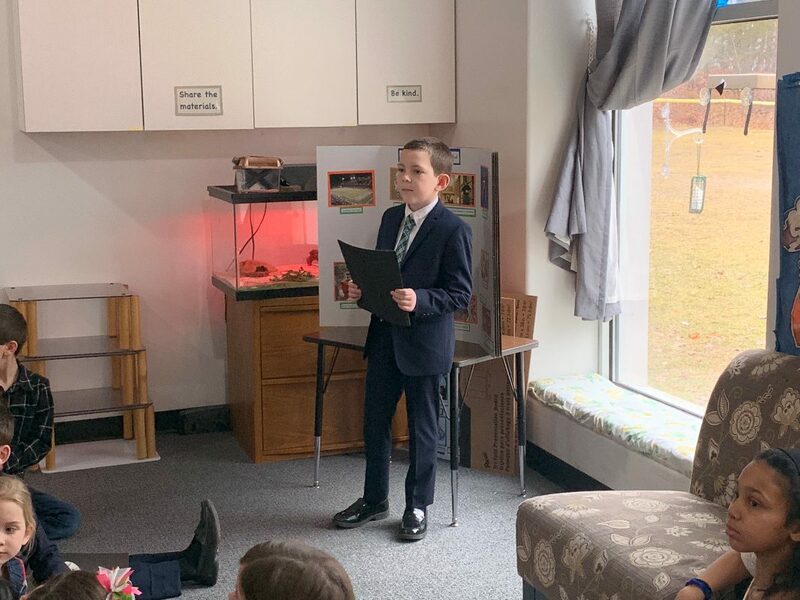 Even though the third years told us they were very nervous about their first oral presentation, they leaned into the discomfort and experienced a new level of poise and confidence. 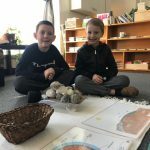 They should be so proud of themselves.